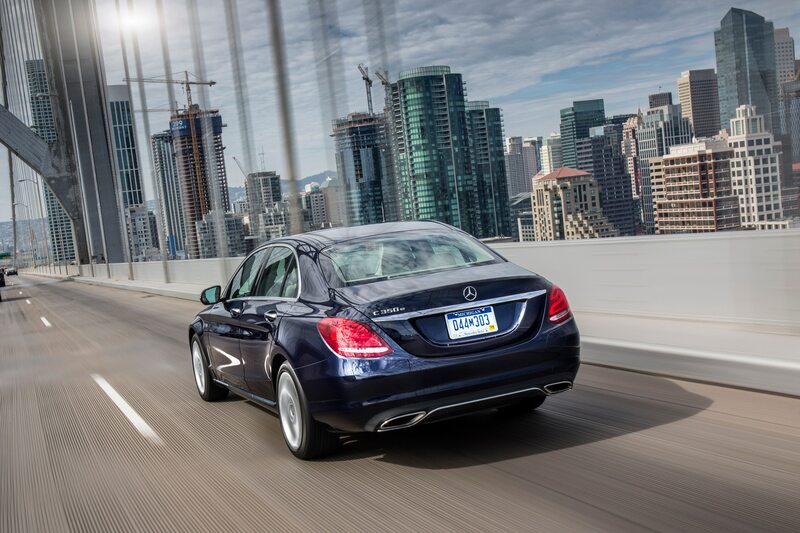 If you could have just one car and one car only, what would it be? 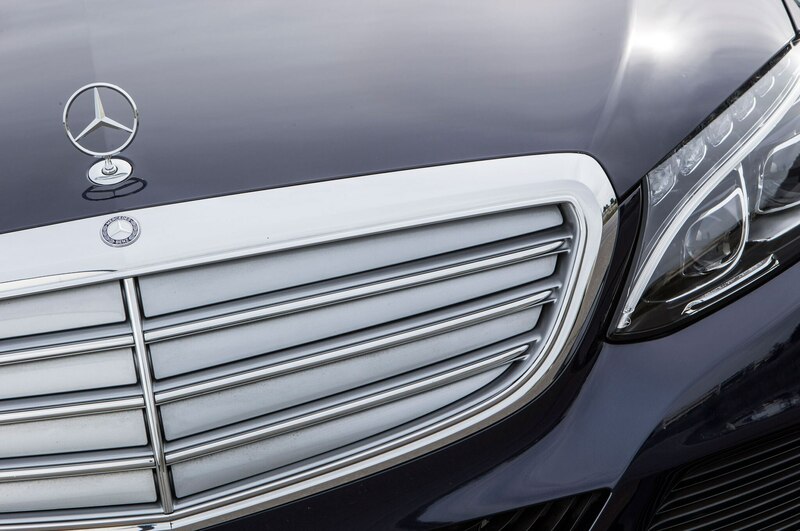 It’s a common question thrown out to journalists, and a rather tricky question to answer. 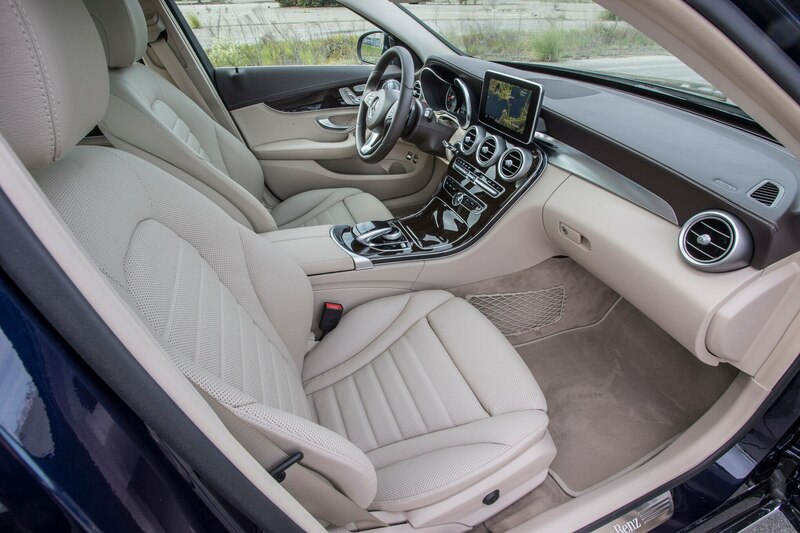 Some might say a Porsche 911, but how do you take more than one other adult out with you in comfort in the long-produced German 2+2? 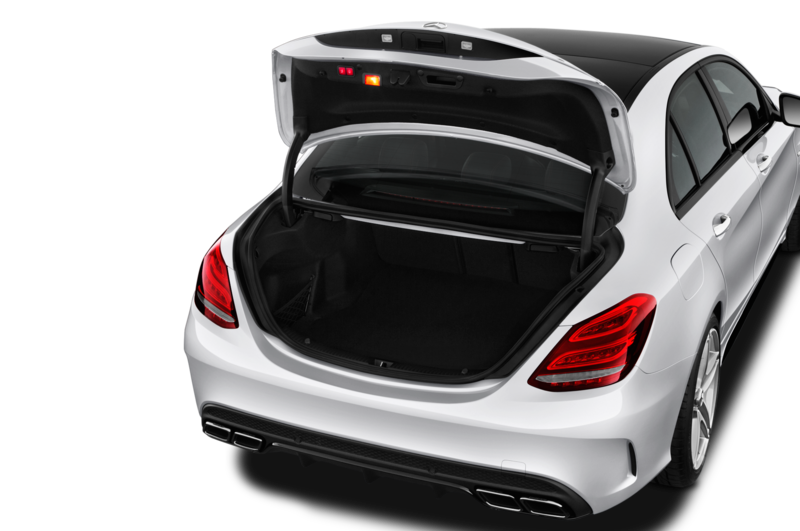 There’s also the rear-engined sports car’s shortage of ultimate cargo capacity—tough to satisfy the Will Ferrell-esque father spending a Saturday at Home Depot and, if he has enough time, Bed, Bath and Beyond. 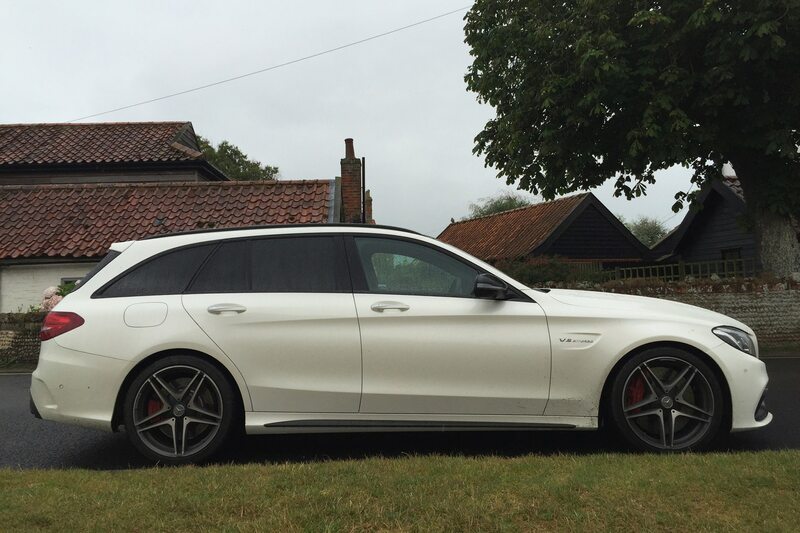 Key to this elusive, Swiss Army knife-vehicle is that it must properly reward when pushed on the back roads and, ideally, hold its own at a track day. 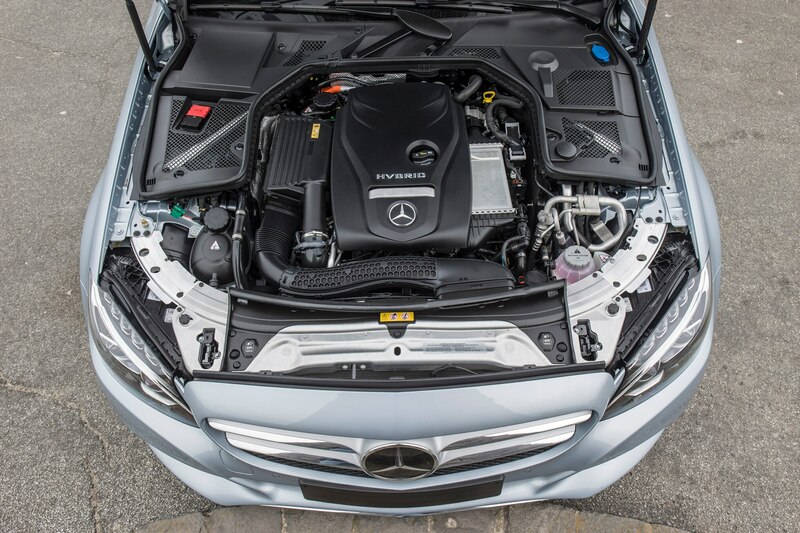 An ultra-powerful crossover like a Mercedes-AMG GLE63 S or Porsche Cayenne Turbo S isn’t that vehicle, no matter what you’ve been told. 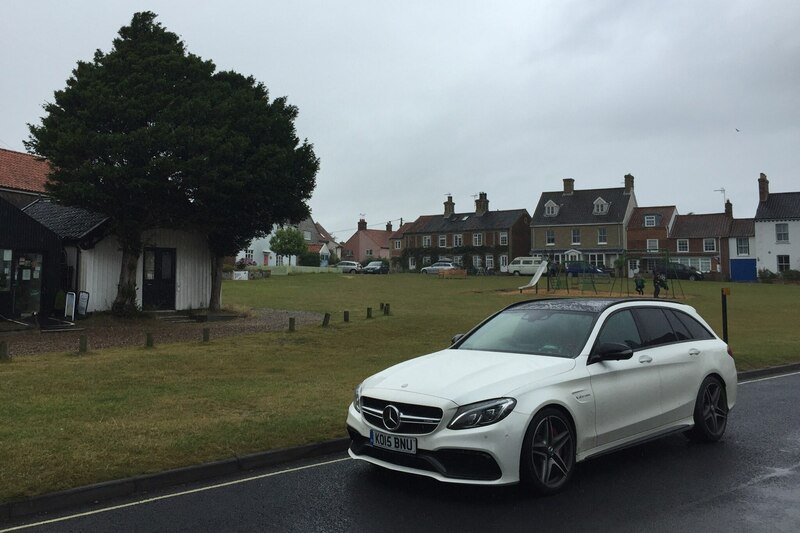 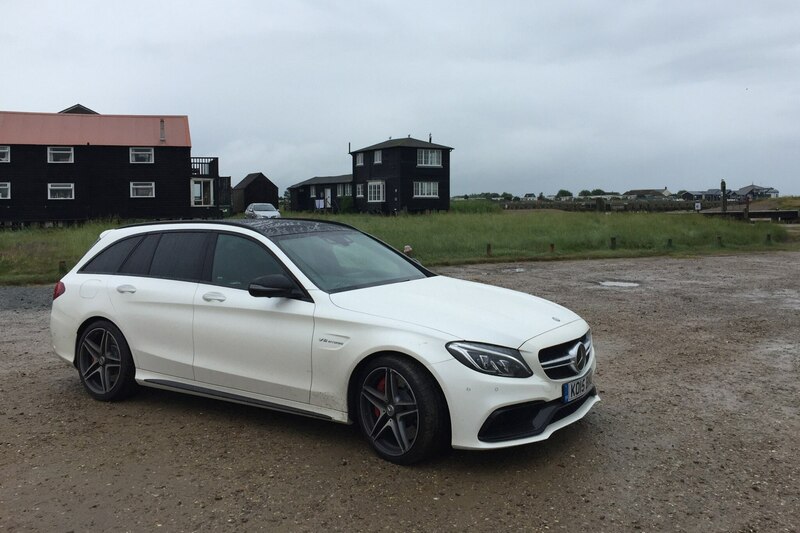 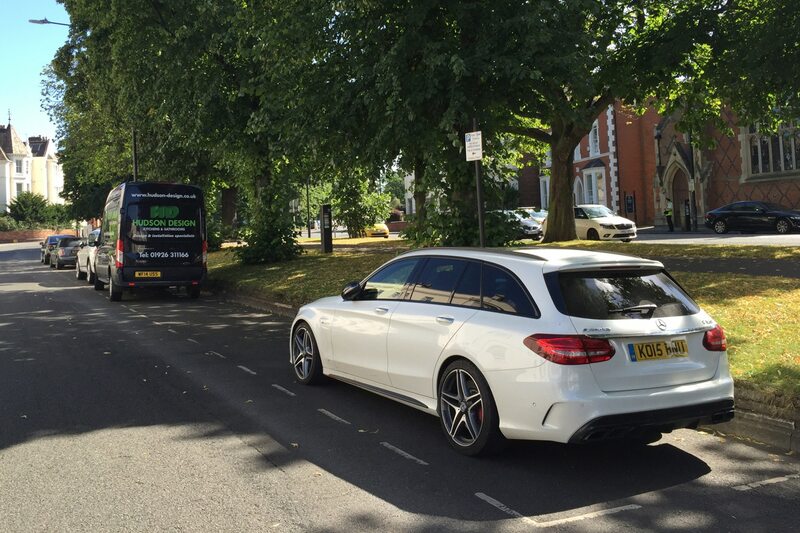 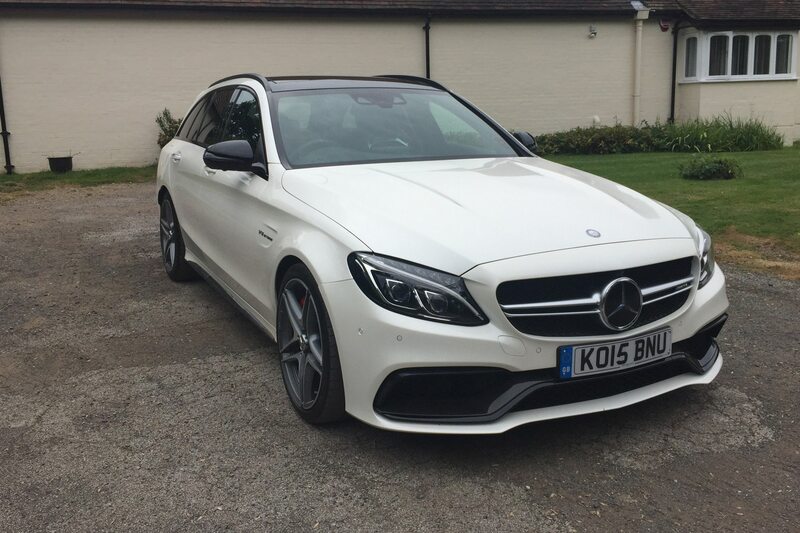 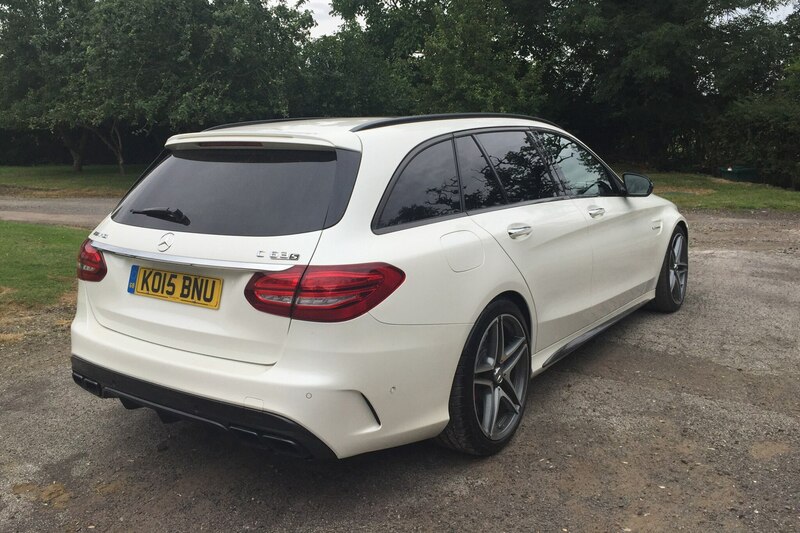 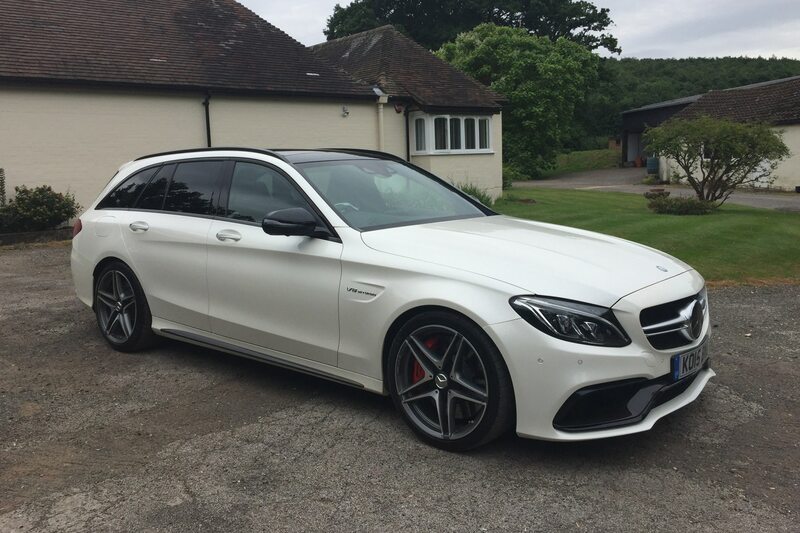 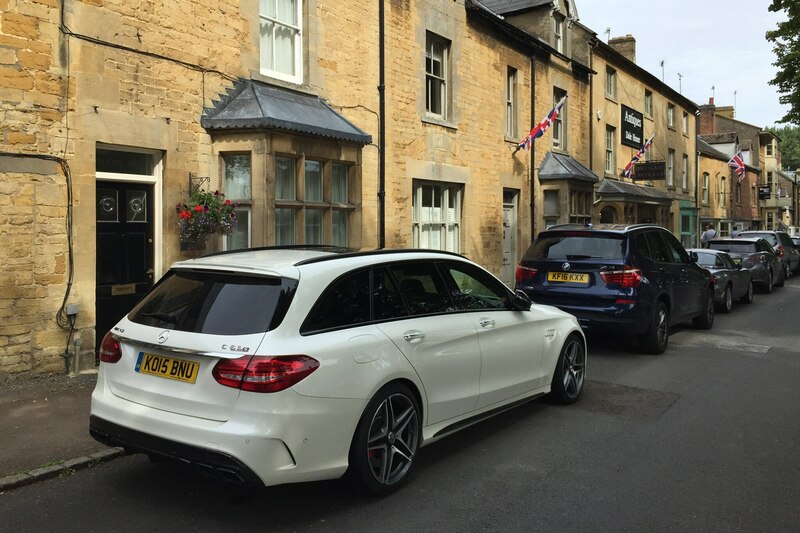 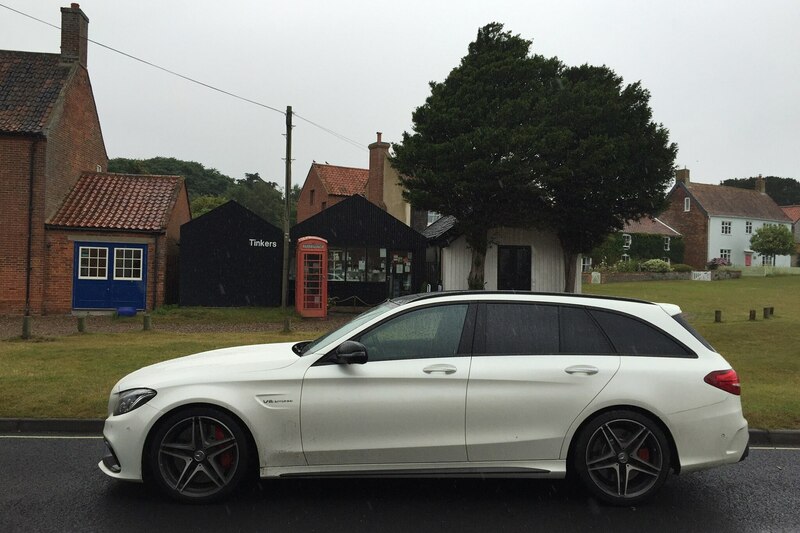 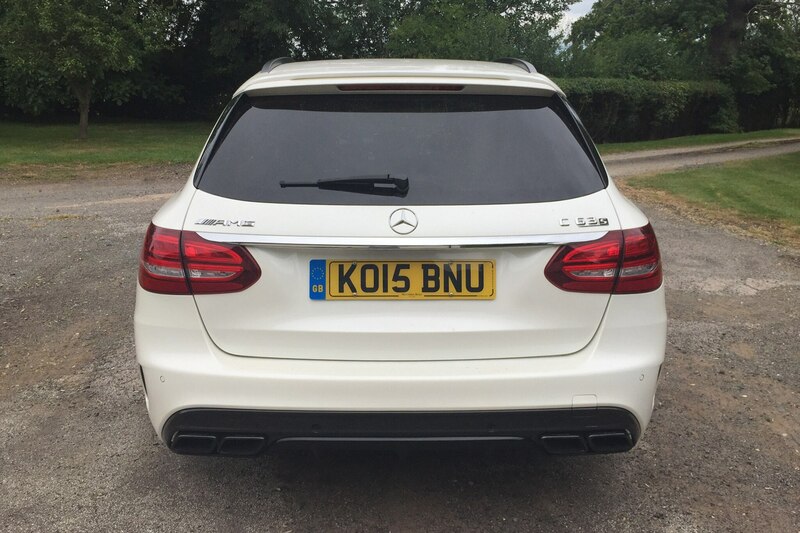 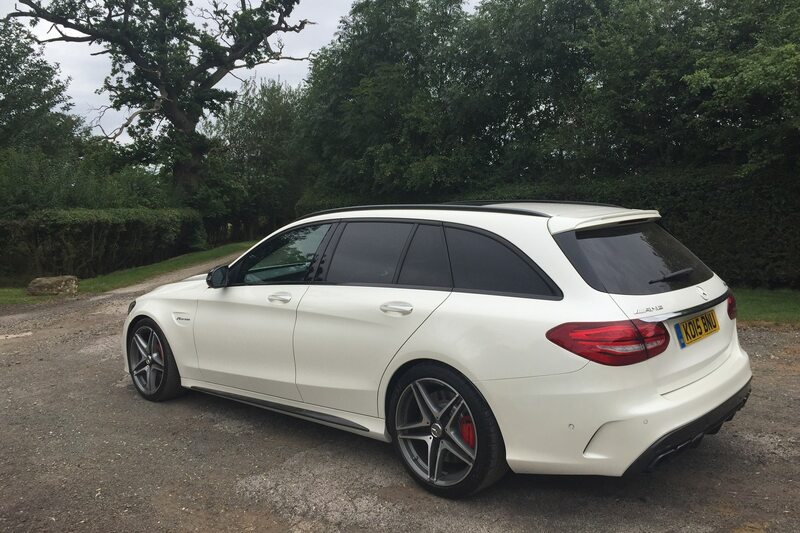 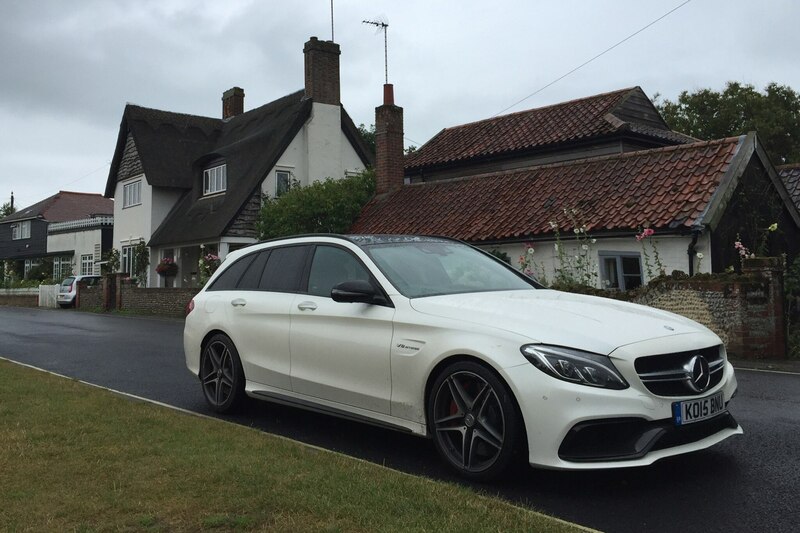 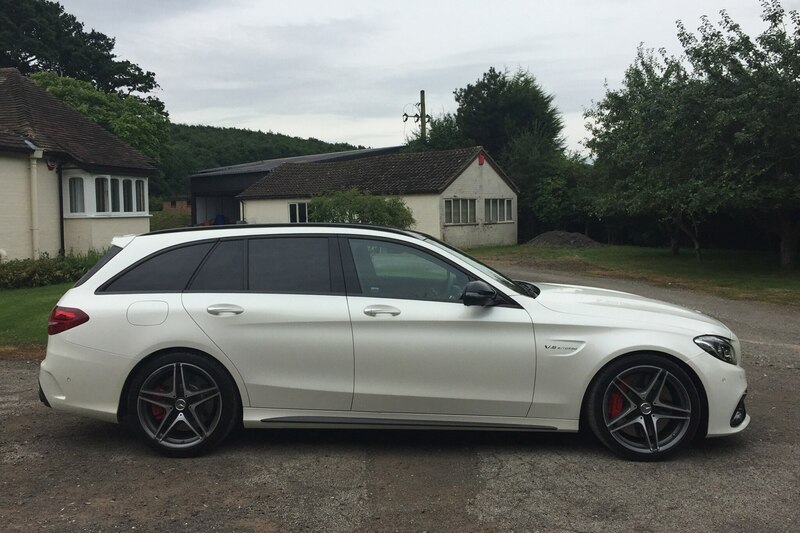 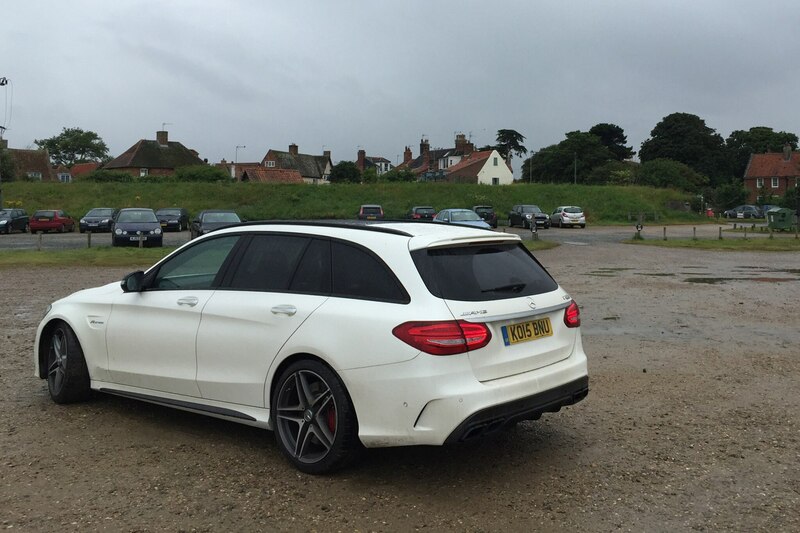 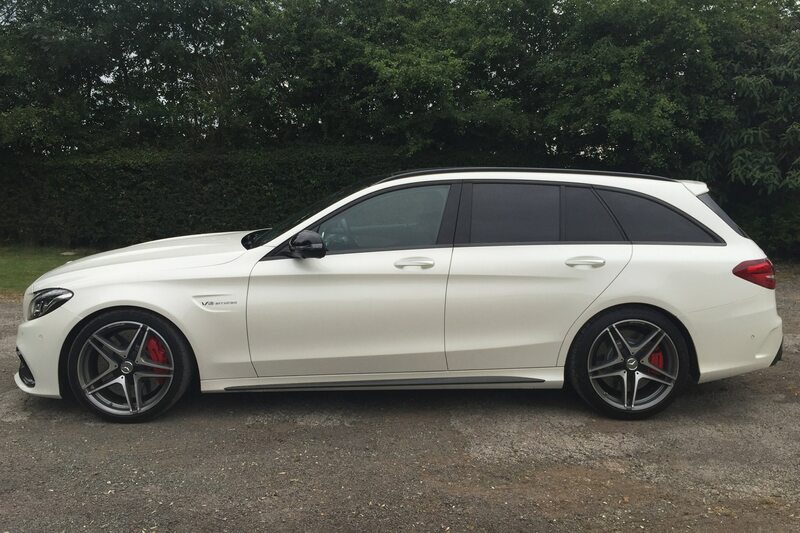 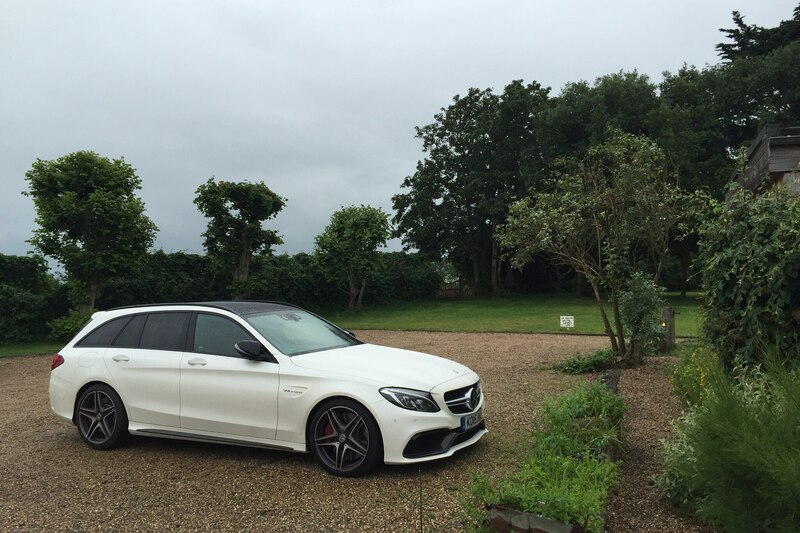 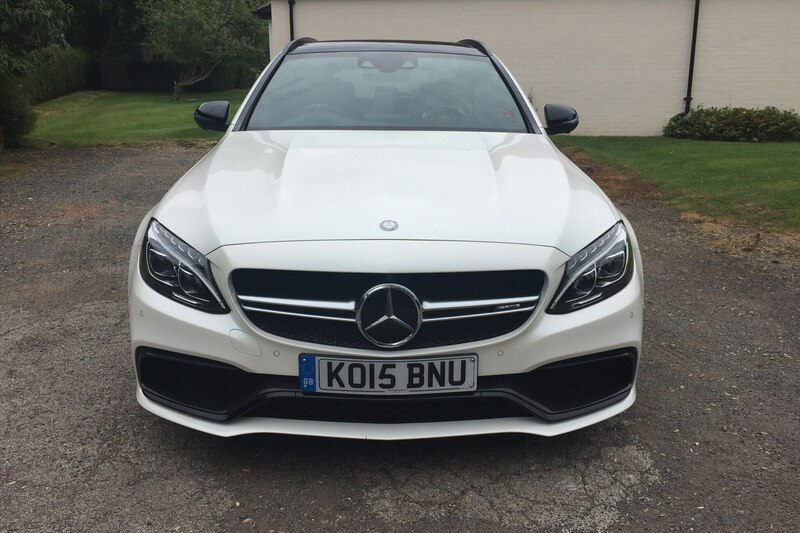 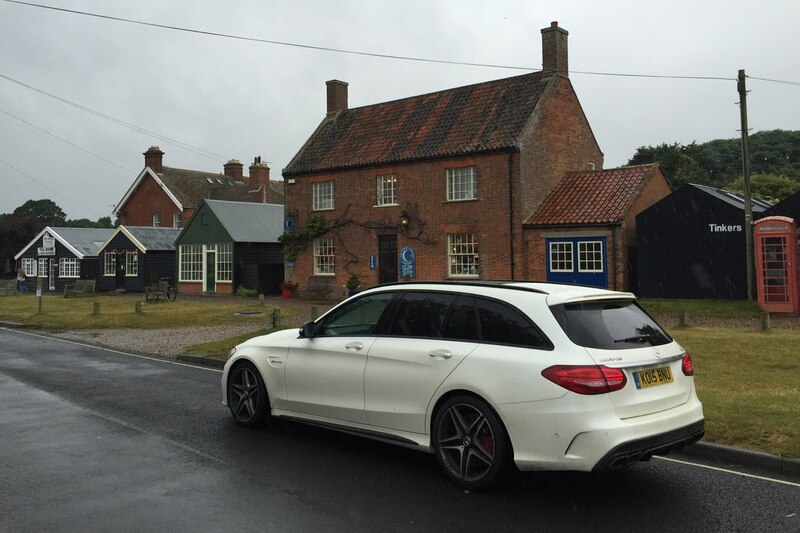 Alas, I may have finally found the holy grail during a recent trip to England, the 2016 Mercedes-AMG C63 S Wagon. 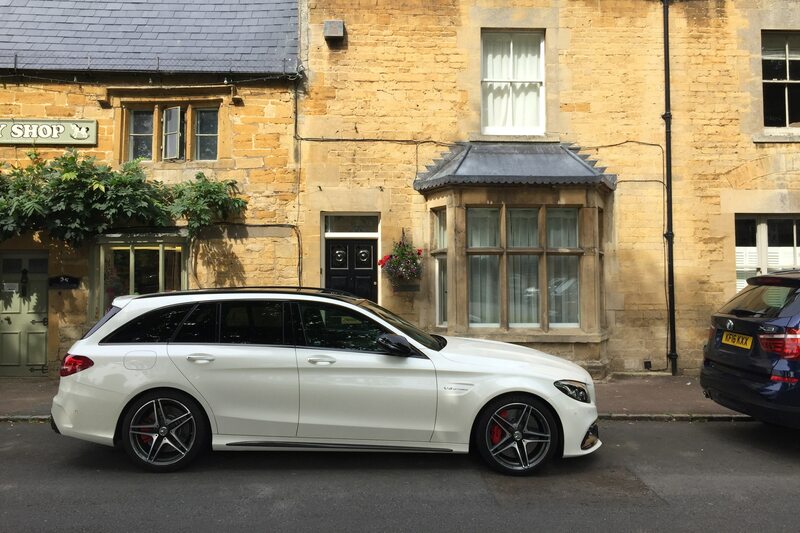 Before you start yelling and screaming, I’m well aware that us Americans are already gifted the larger Mercedes-Benz E63 S Wagon. It’s a wonderful automobile and we’re lucky that our station wagon-averse market actually receives such a fine specimen of performance grocery getters. 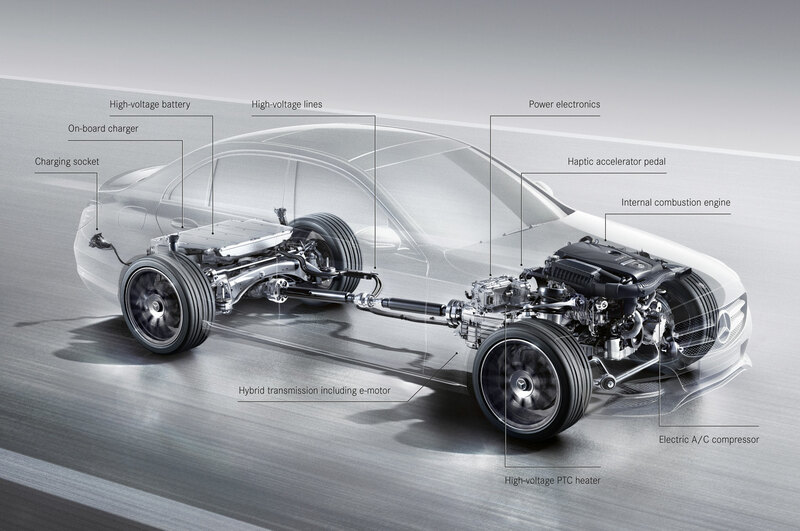 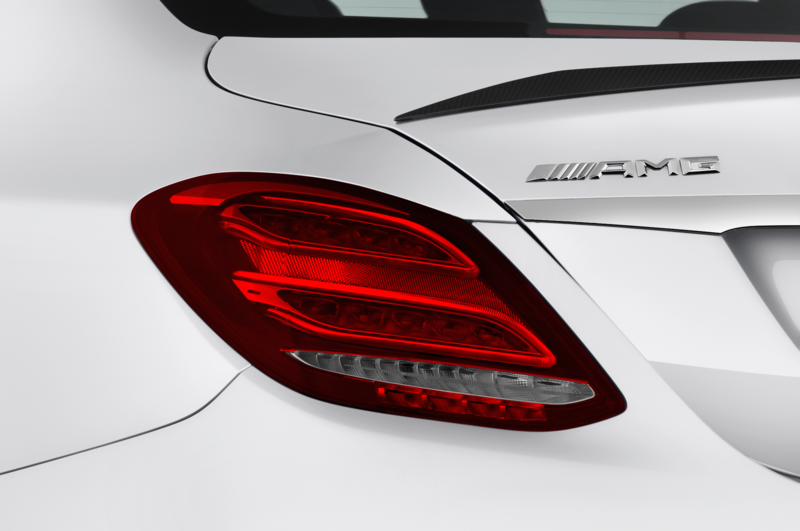 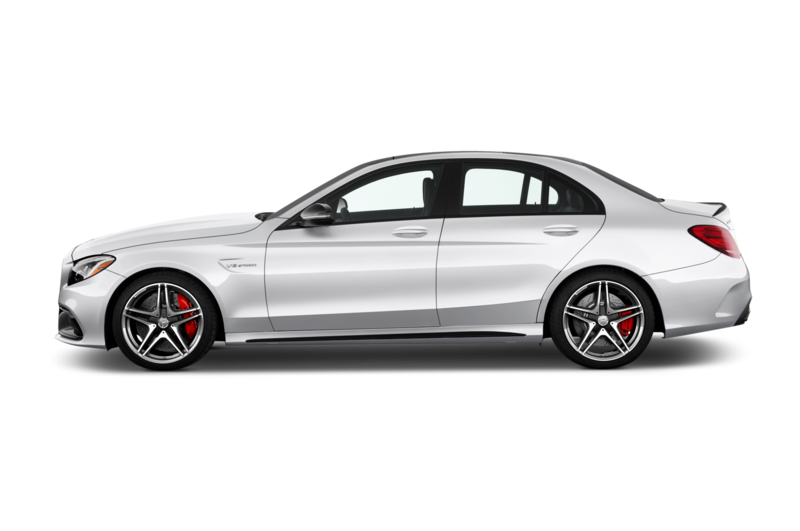 But the AMG E-Class isn’t quite the lithe dancer that I’m looking for to fully satisfy the perfect, sole-vehicle role. 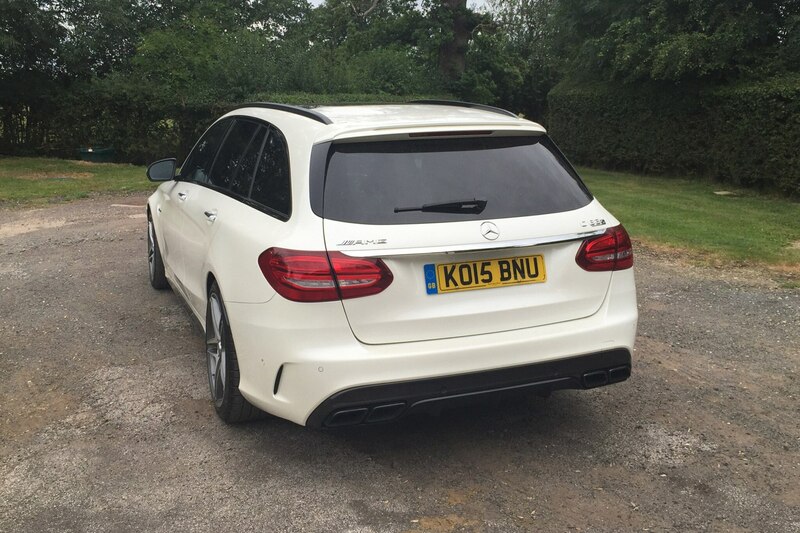 Yes, it grips through a corner with impressive verve but it’s a bit too big and heavy, and the all-wheel drive dulls ultimate handling. 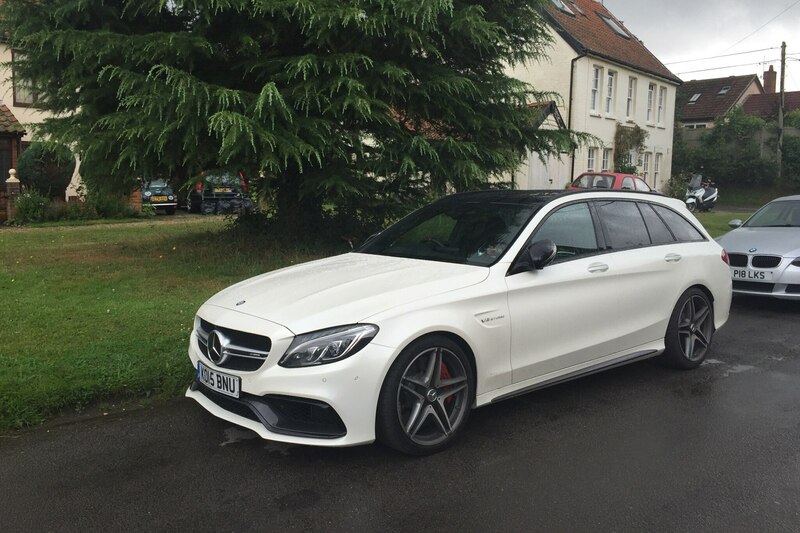 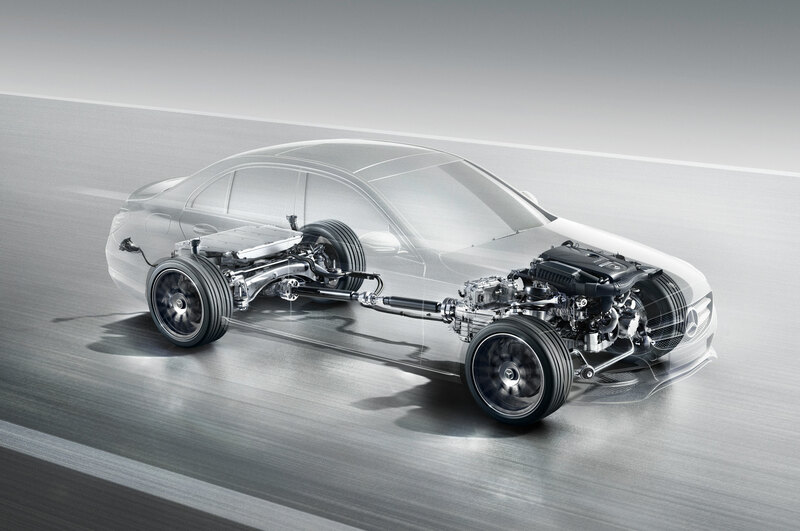 I love the E63 but it’s more of a straight-line beast, an Autobahn blaster. 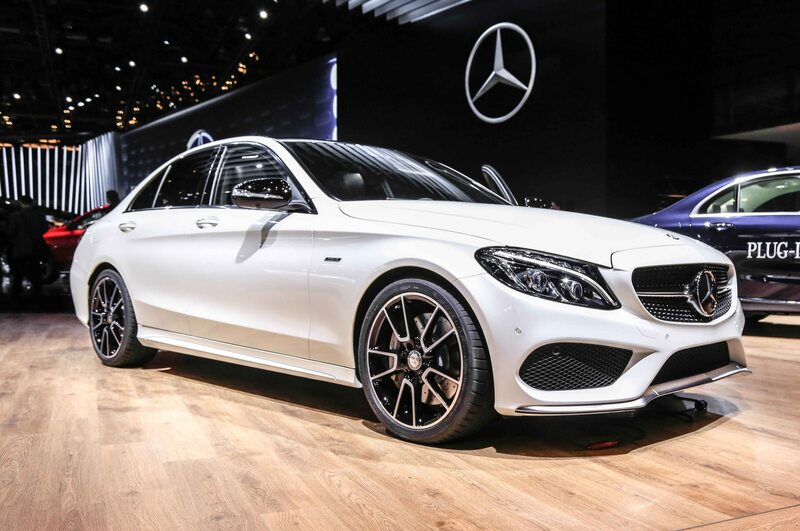 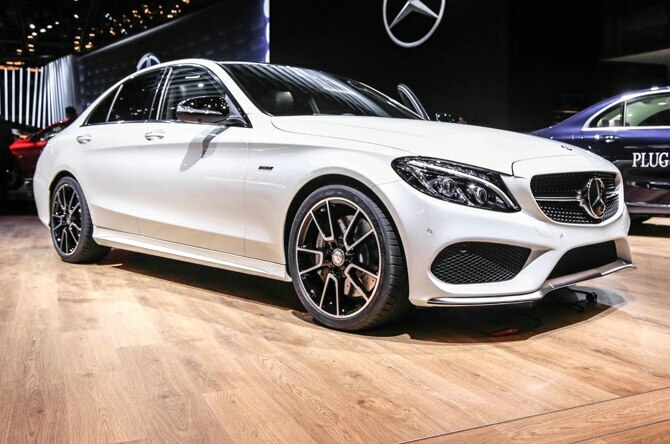 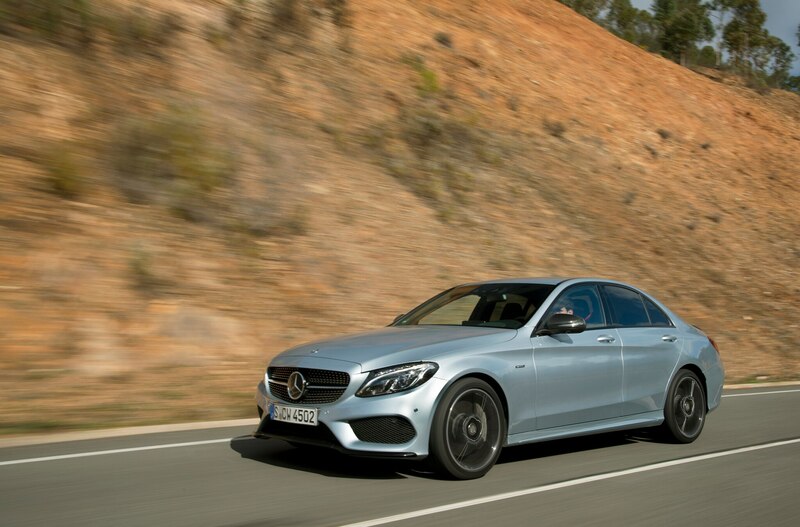 Plus, the present E63 is on its way out, soon to be replaced by an AMG version of the new E-Class. 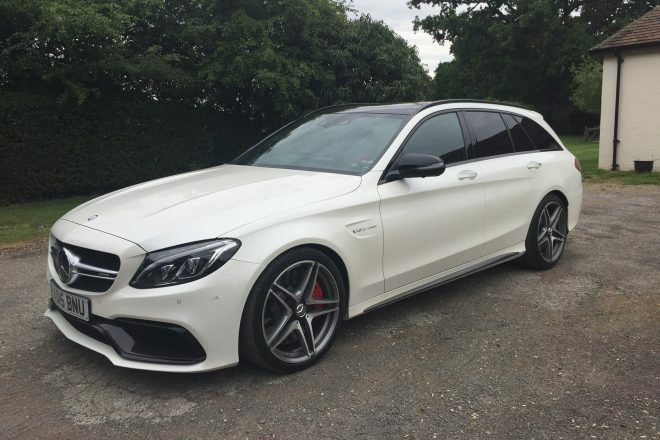 It only takes rocketing through a challenging British roundabout with the optional sport exhaust activated to realize the C63 wagon is the AMG that you want. 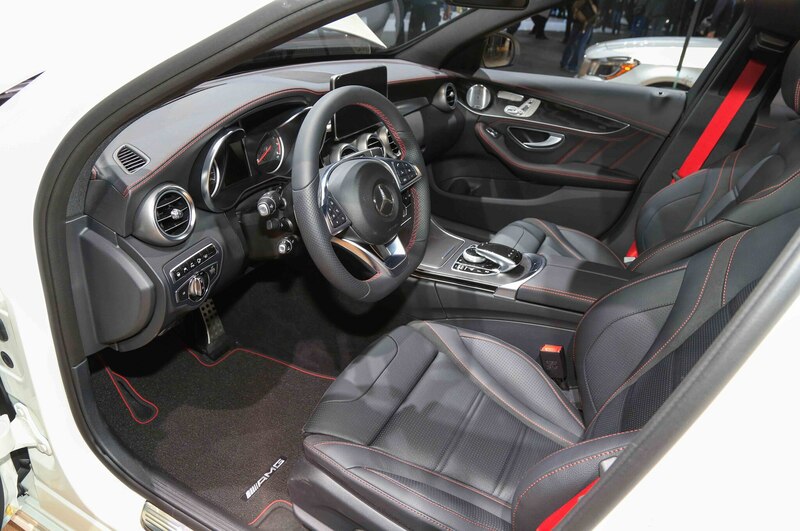 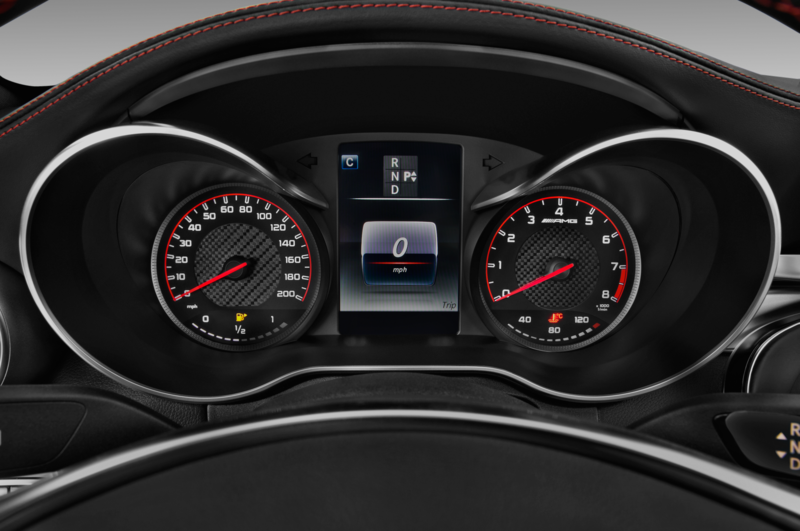 Dial in a bit of opposite lock as the 265/35RY-19 Michelin Pilot Super Sport rear tires scamper for traction and pull the upshift paddle just before the 7000-rpm redline, rewarding you and any lucky occupants to a glorious exhaust bark during the ratio swap of the 7-speed automatic. 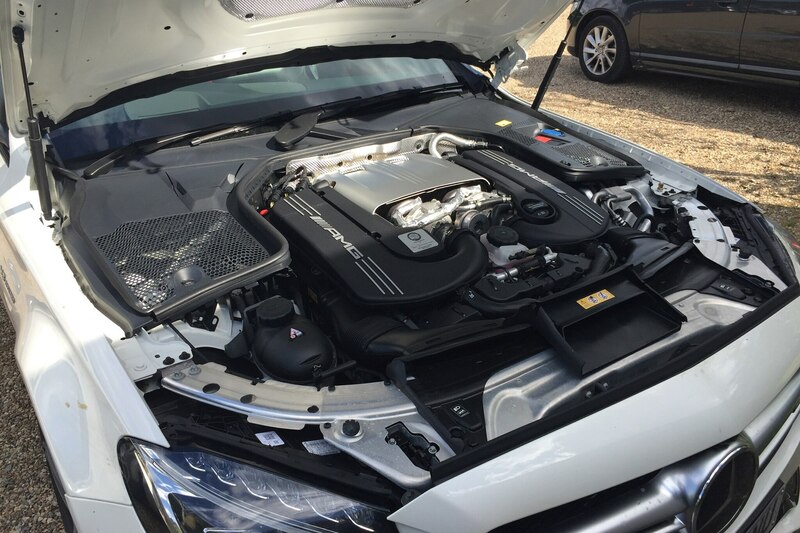 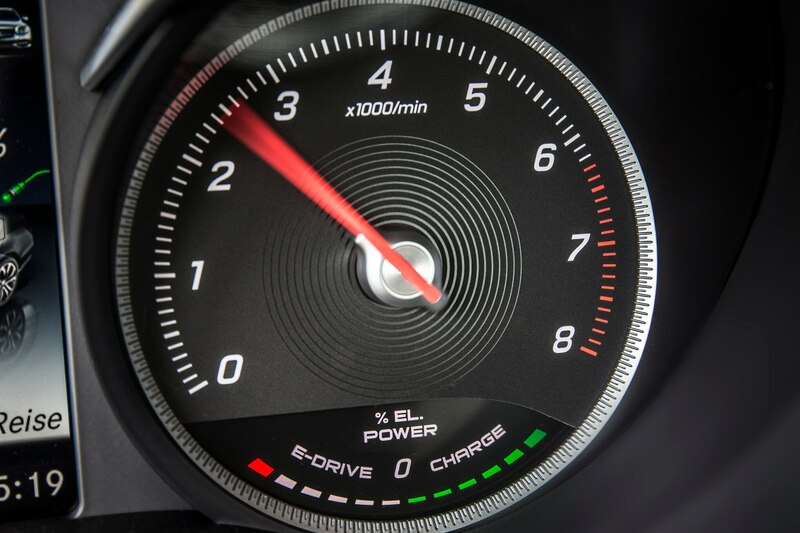 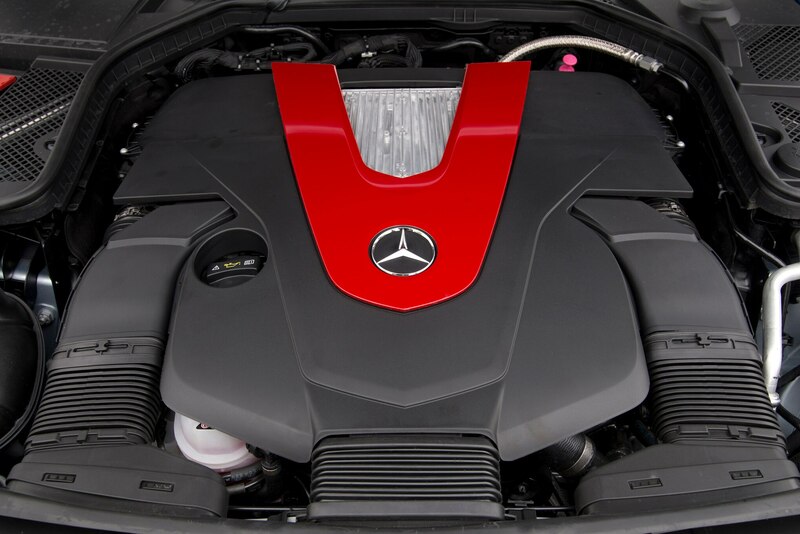 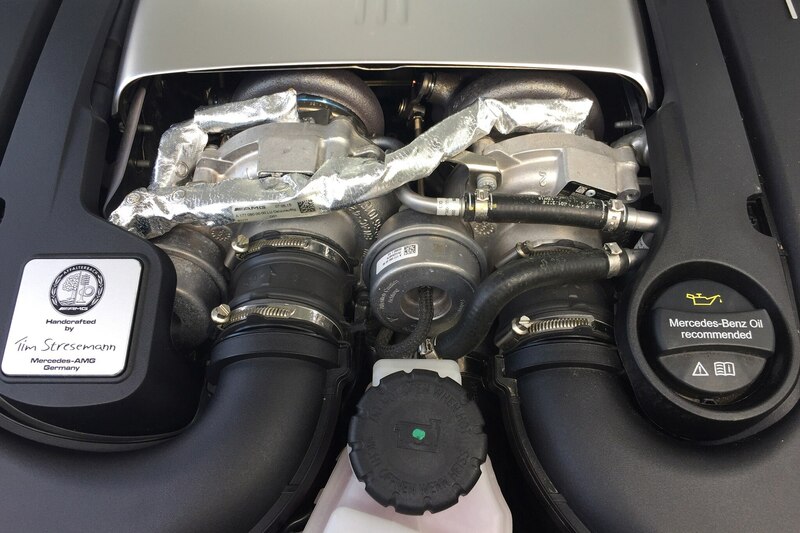 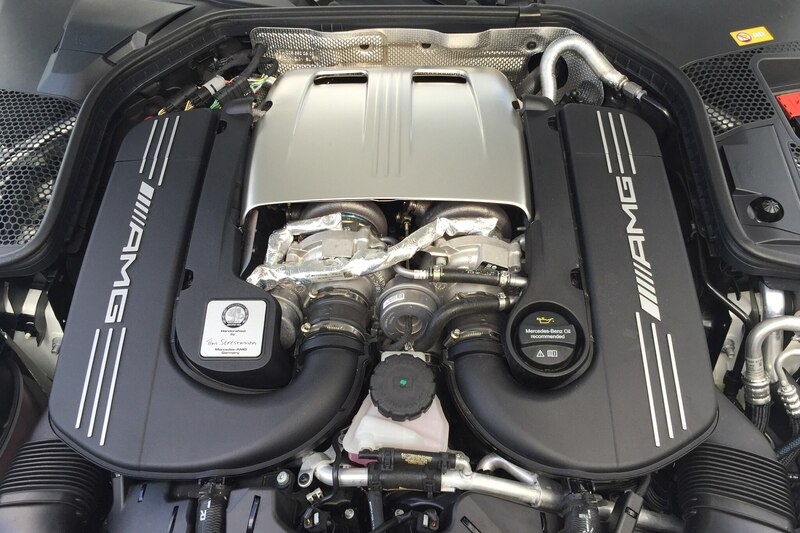 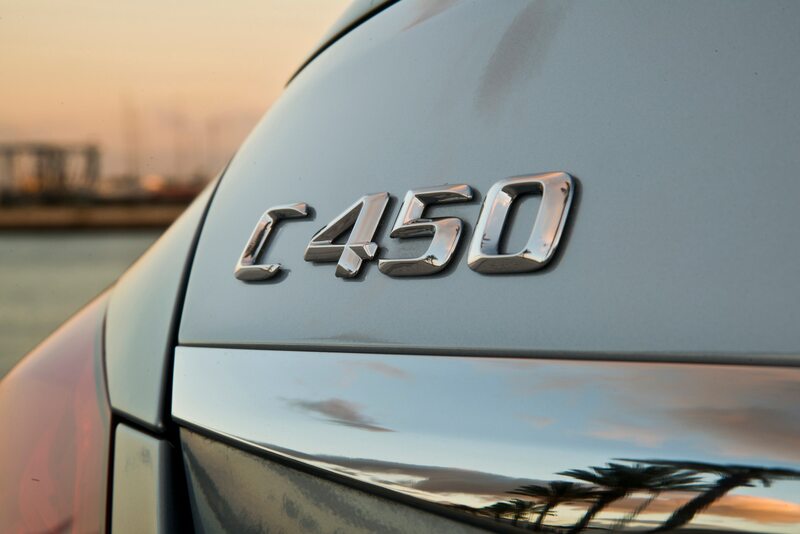 Before you know it, the 503-hp V8 has accelerated you well past the speed limit while your giggles attempt to overpower the lovely, extroverted engine note. 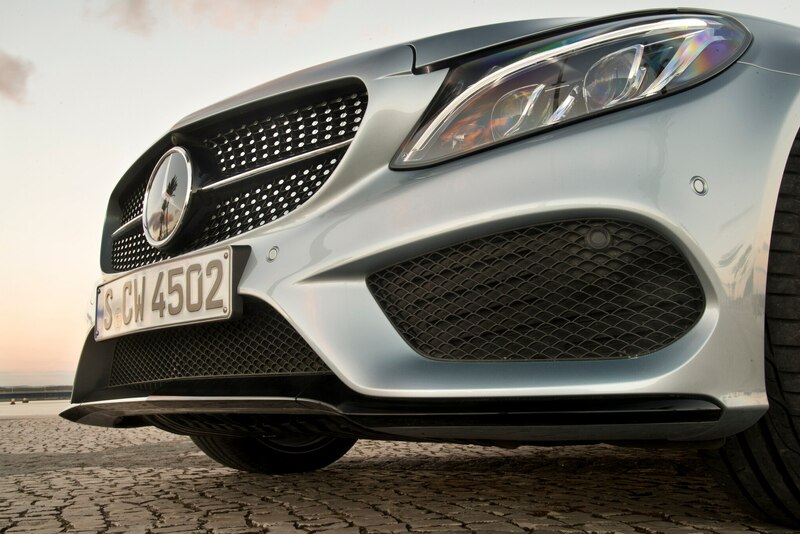 Luckily, powerful brakes bring you back down to a speed camera-friendly pace after the hooligan fun. 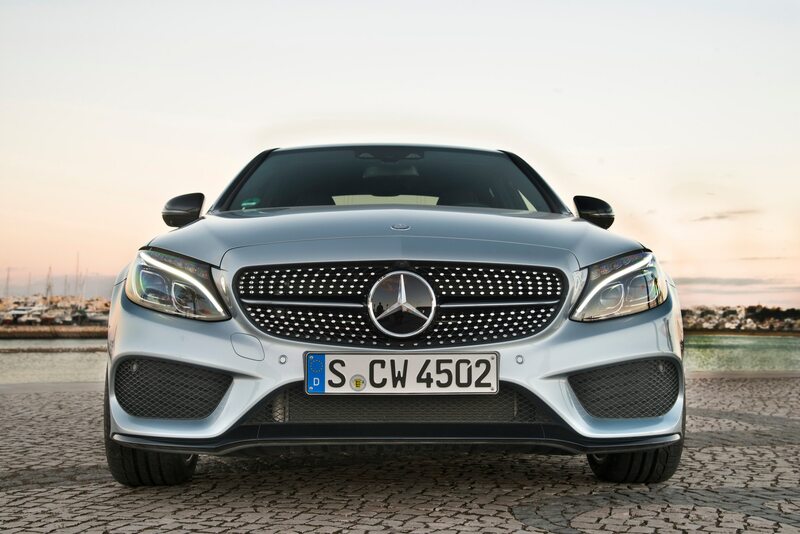 It’s a raw, almost muscle-car character, but with welcomed German refinement sprinkled in. 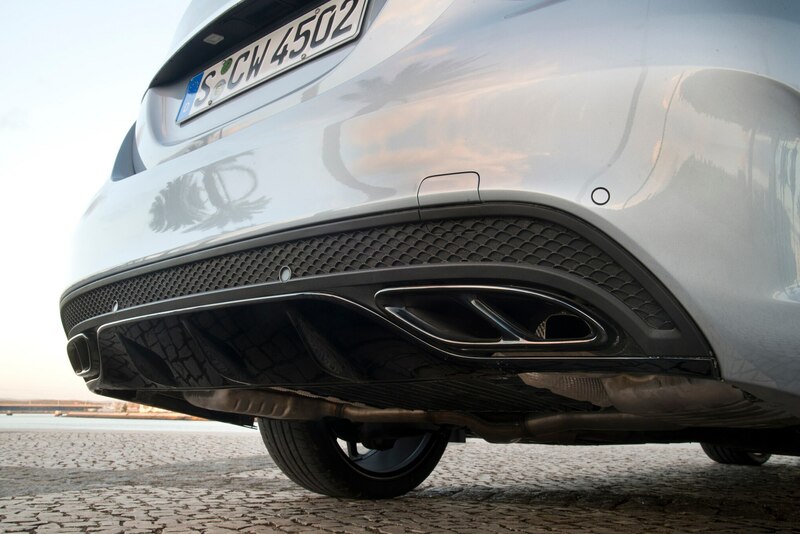 You clearly know that lighting-up the rear tires into a flurry of smoke and enjoying the popping and banging from the exhaust isn’t exactly socially acceptable but you don’t care. 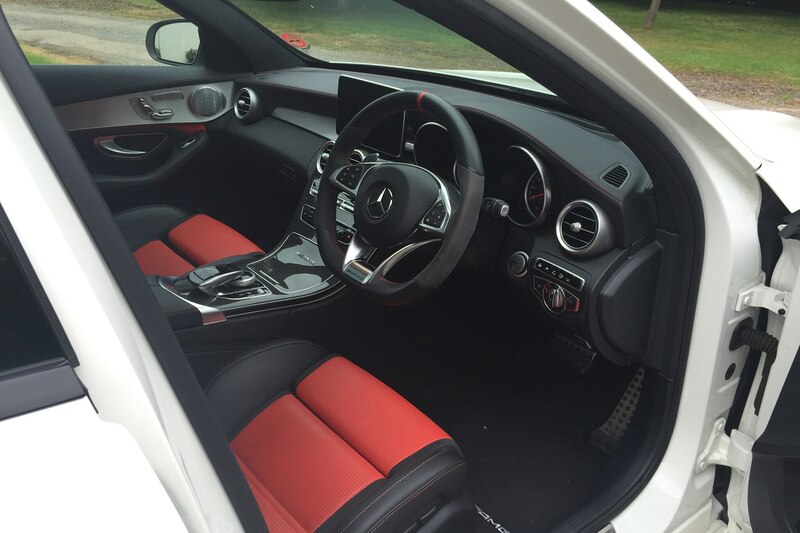 It’s just so much damn fun. 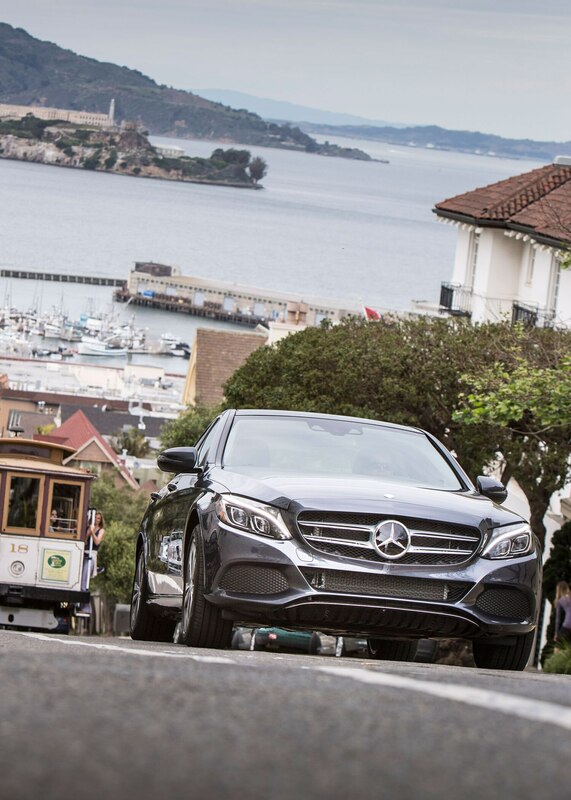 And fun for the whole family. 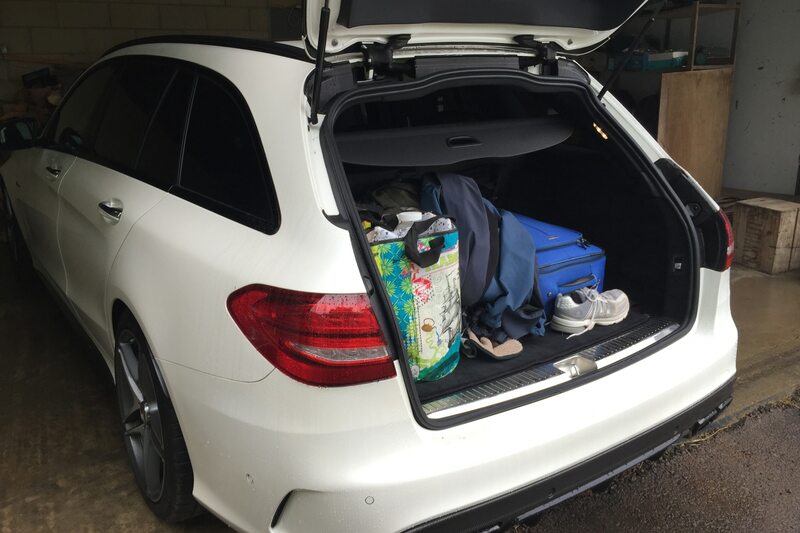 The Noordeloos brood piled the ample luggage compartment full of baggage for a much-needed getaway to the English seaside in Suffolk. 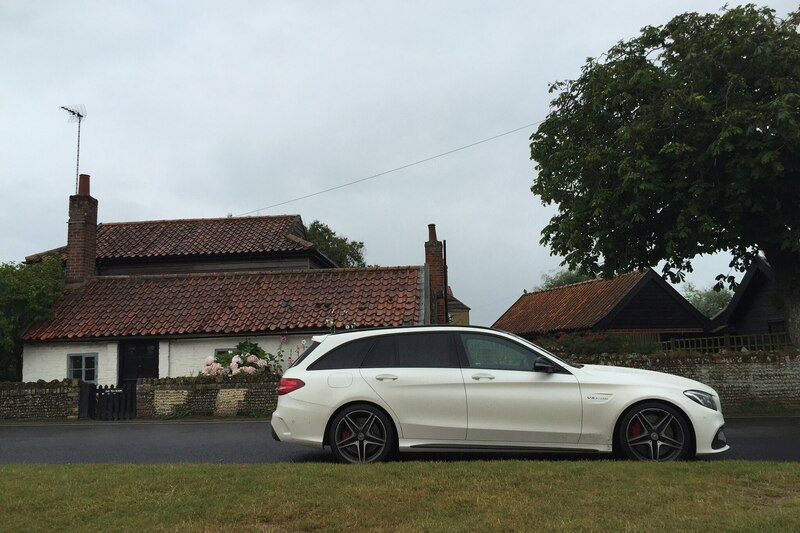 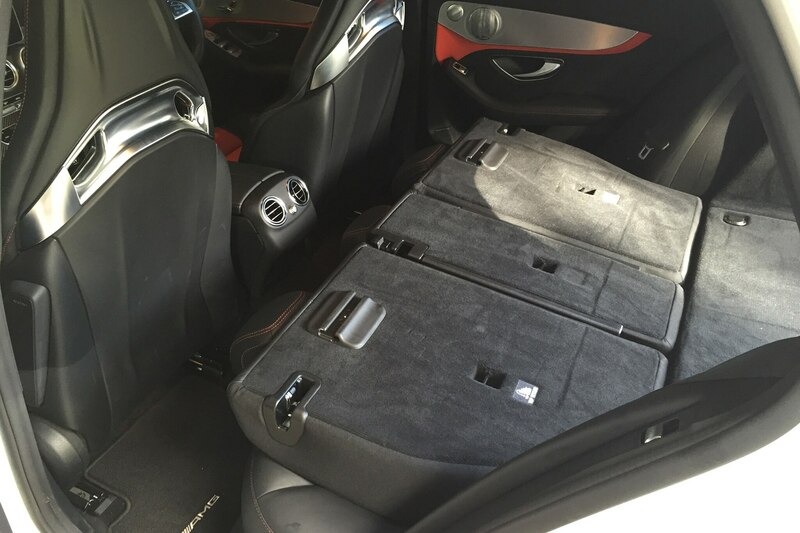 We had room to spare in the C63, both for gear and our legs. 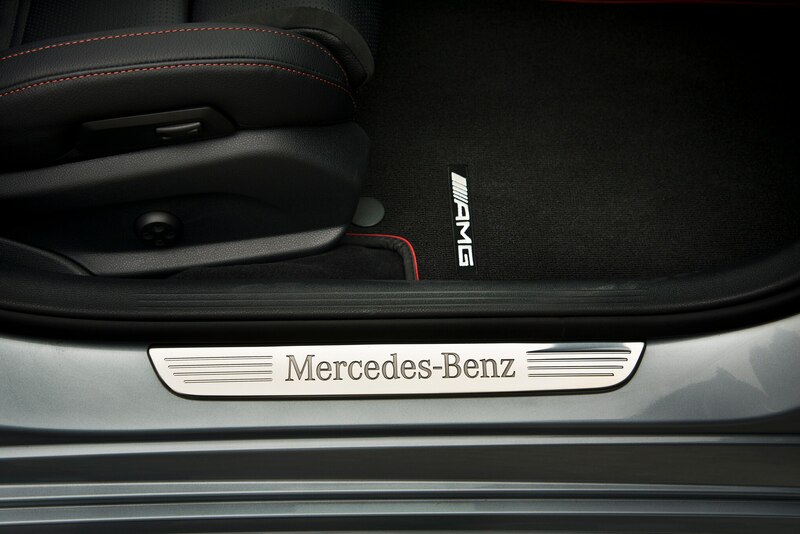 The power luggage compartment cover kept all the loose items safely in their place as I pushed the C63 along the route. 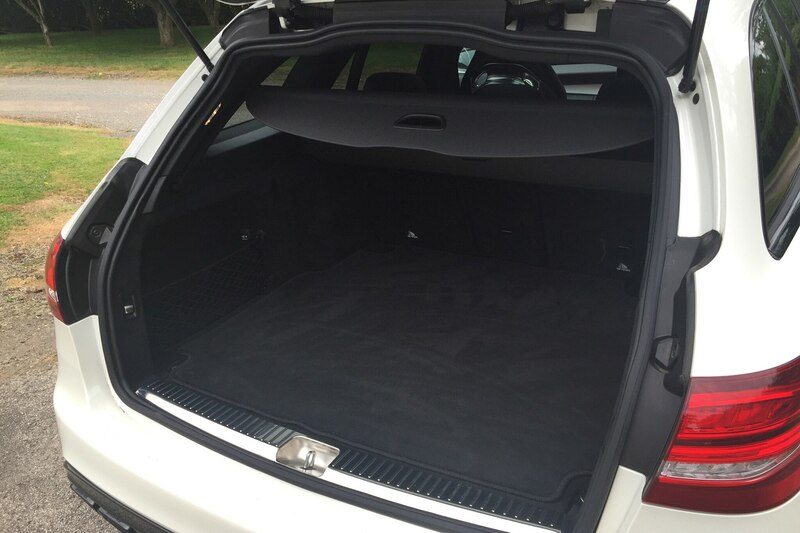 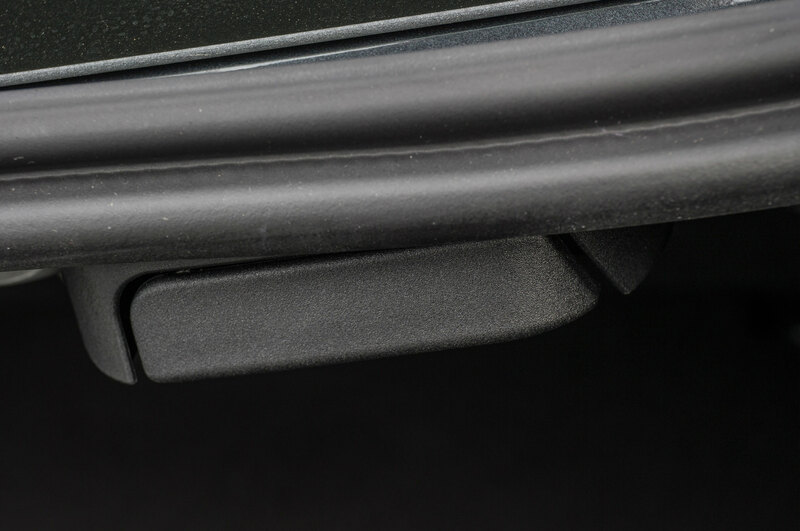 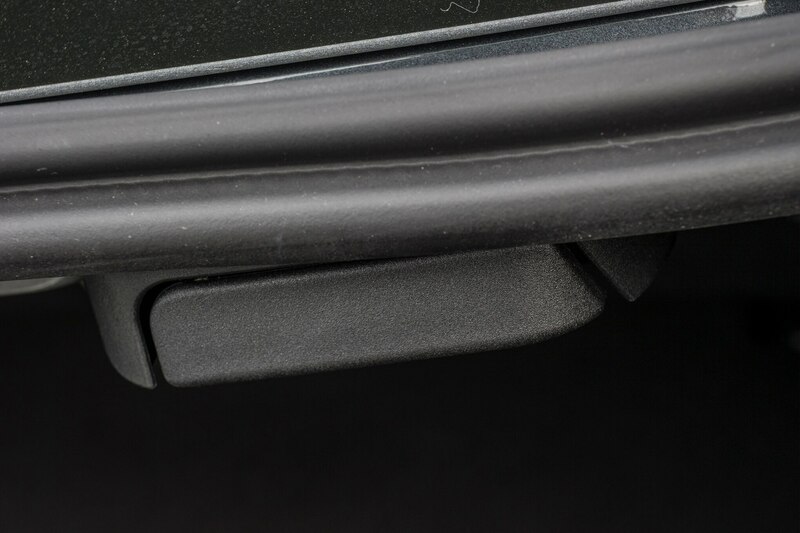 If you need more room, retract the luggage cover and fit the standard luggage net, allowing you to safely fill the back of the wagon straight up to the headliner. 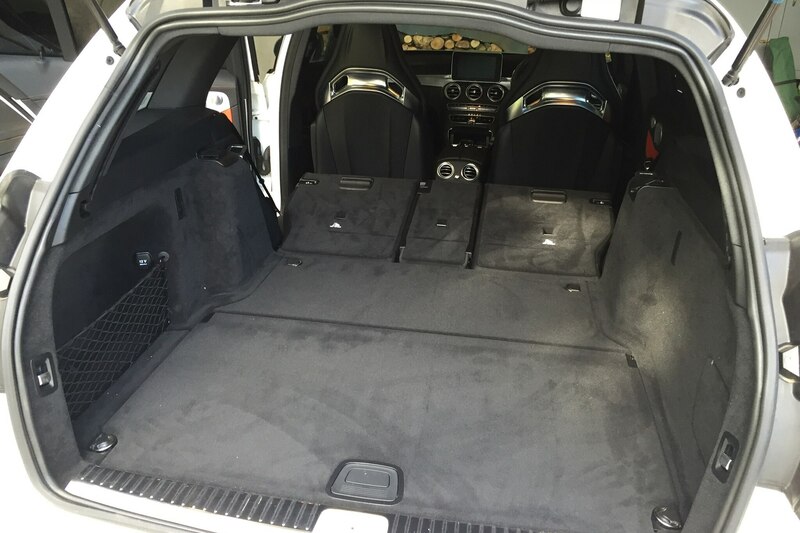 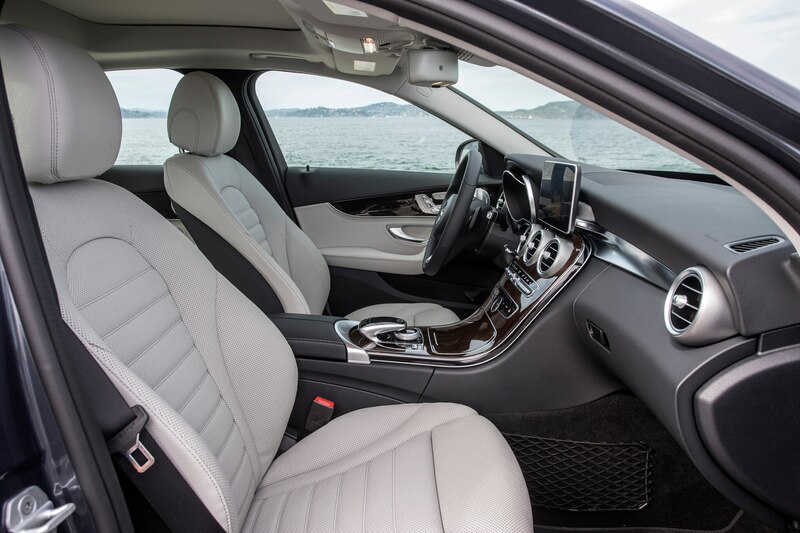 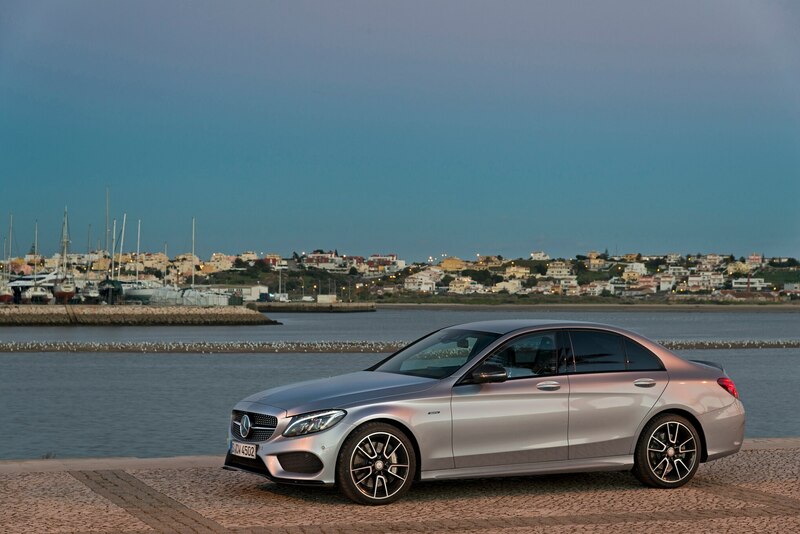 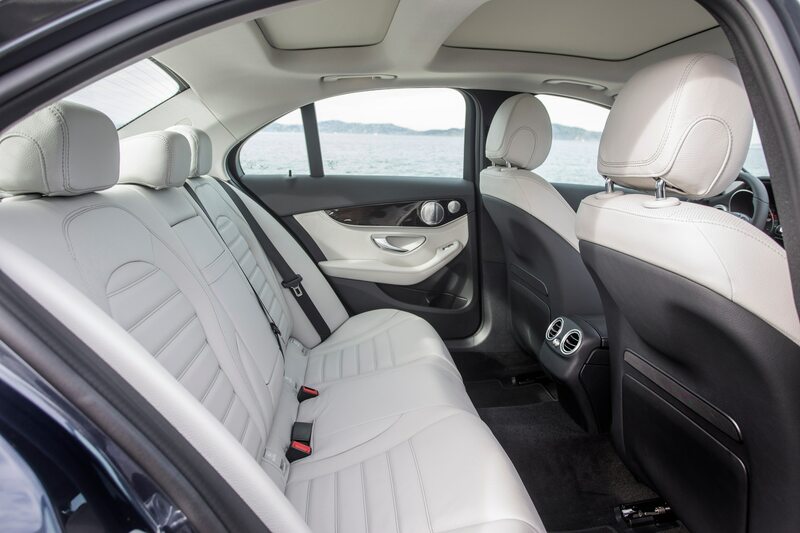 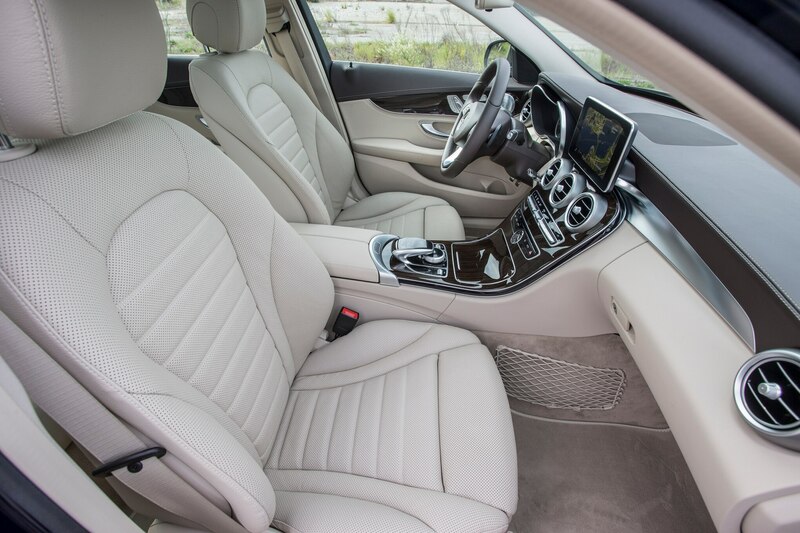 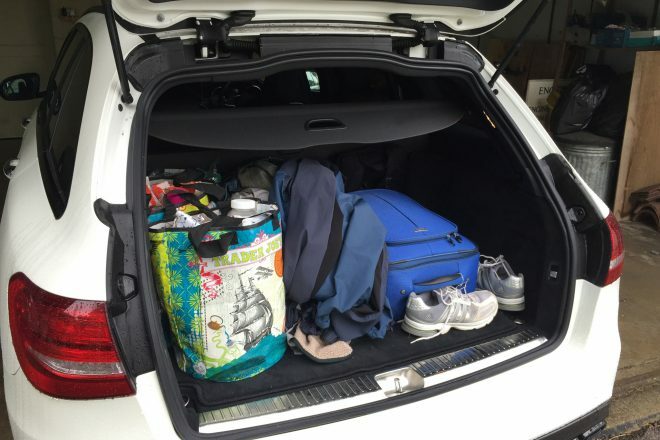 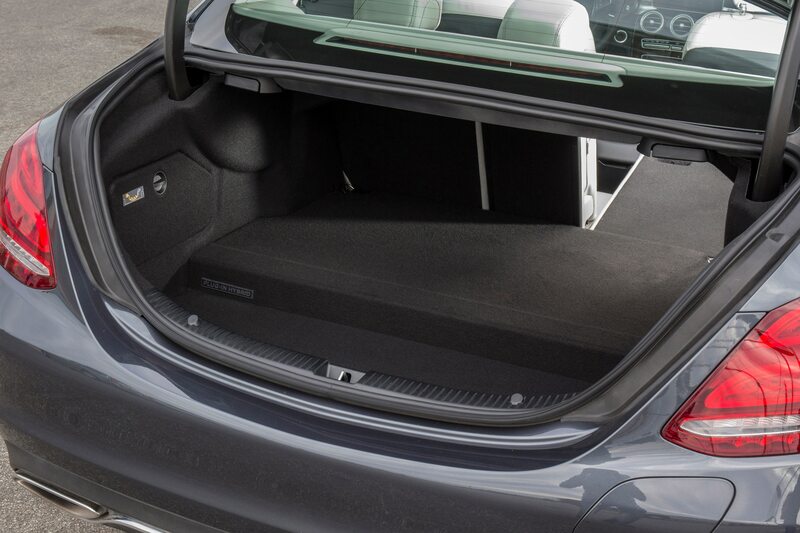 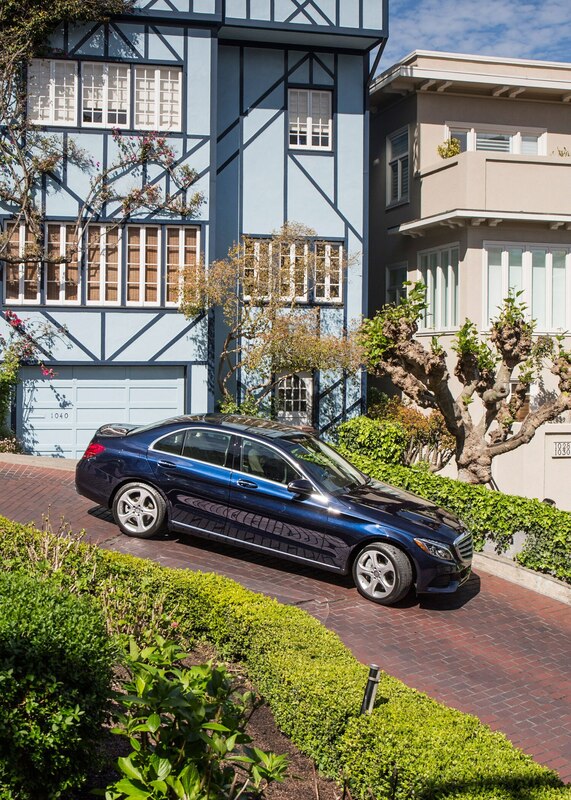 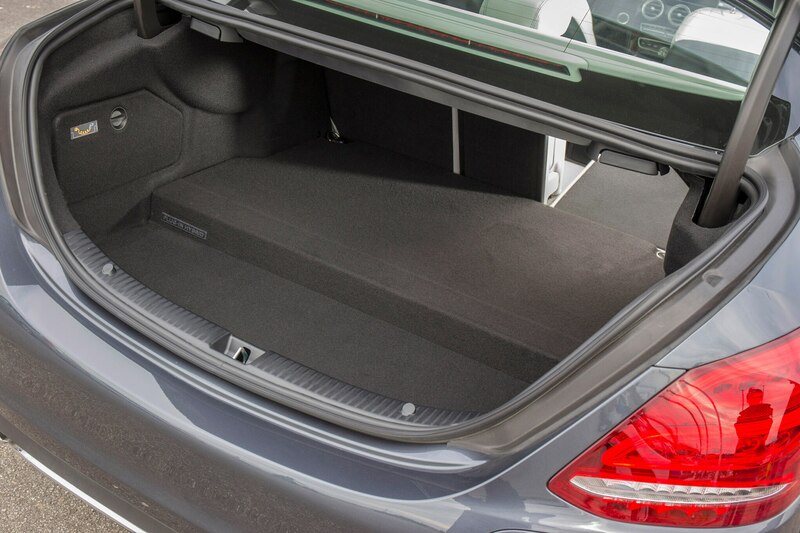 And if you make the children walk or take the bus, the back seats fold, allowing the C-Class wagon to carry an even greater amount of stuff—near-self storage size by British standards. 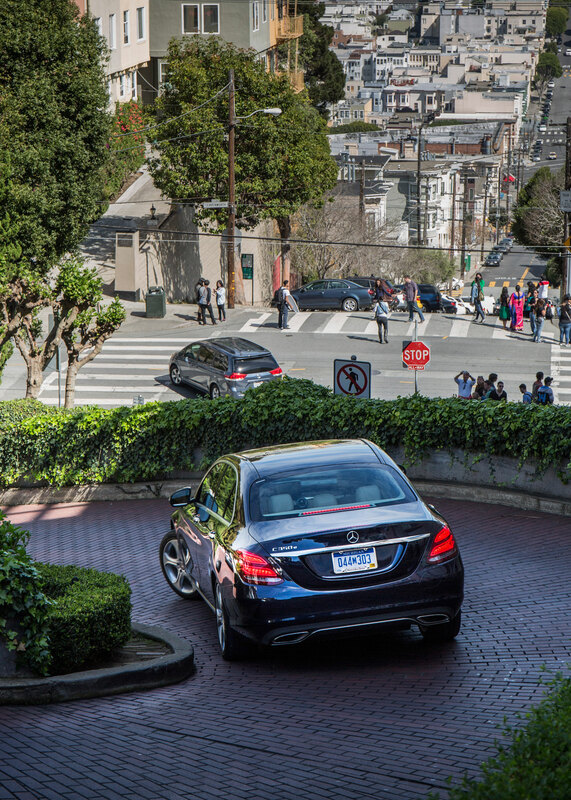 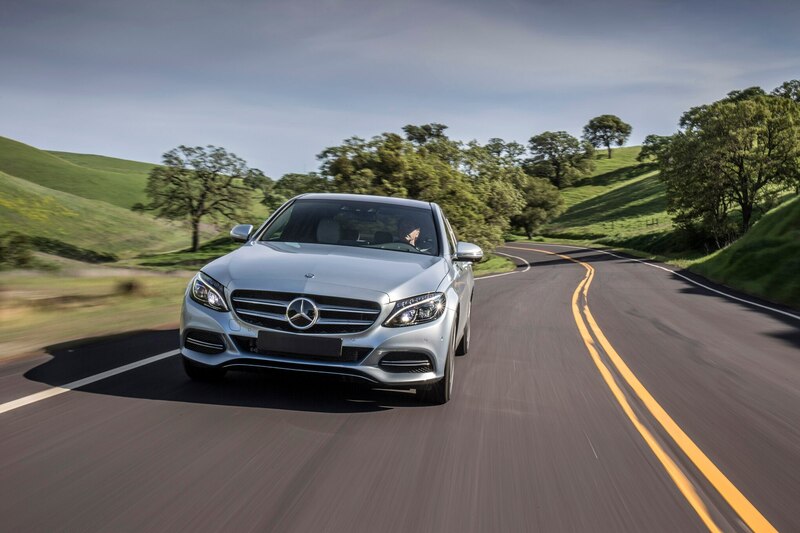 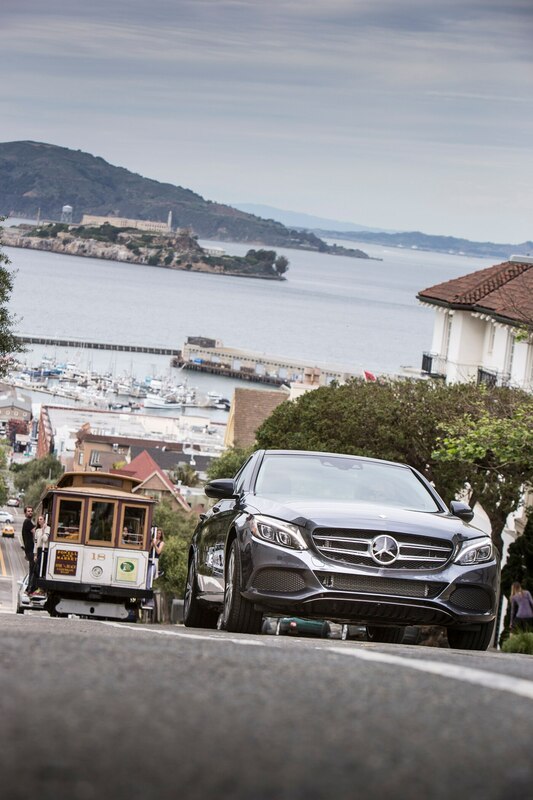 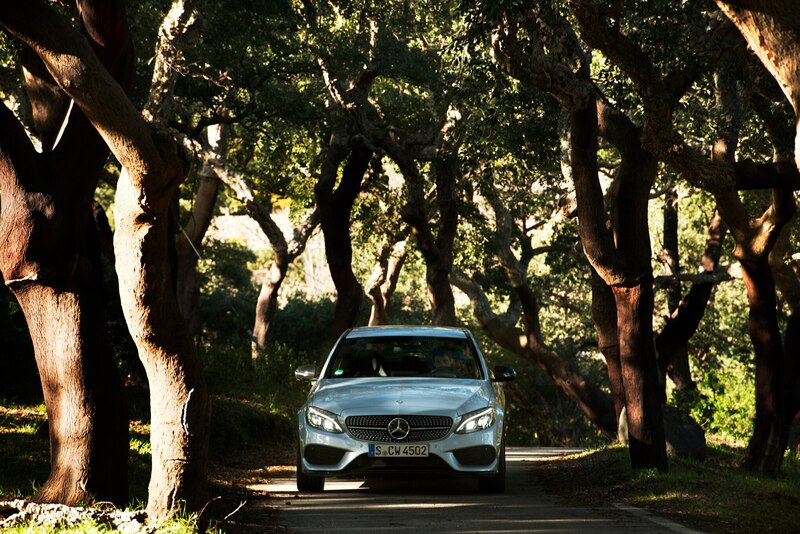 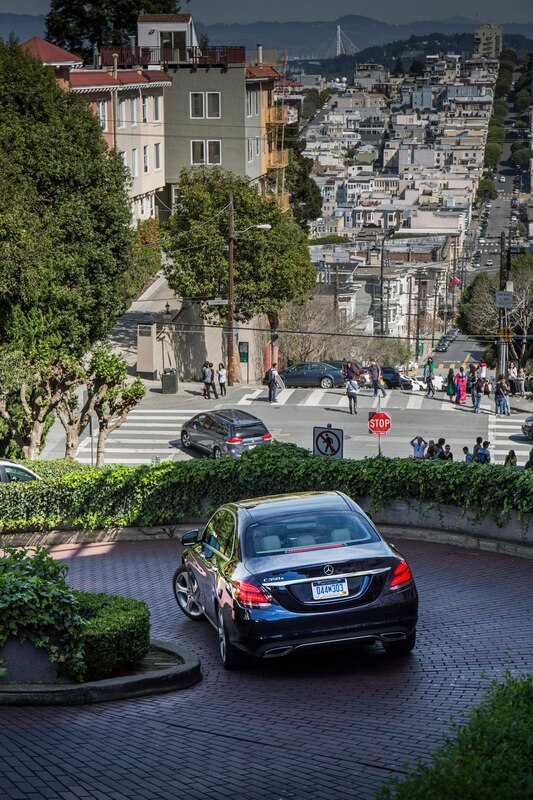 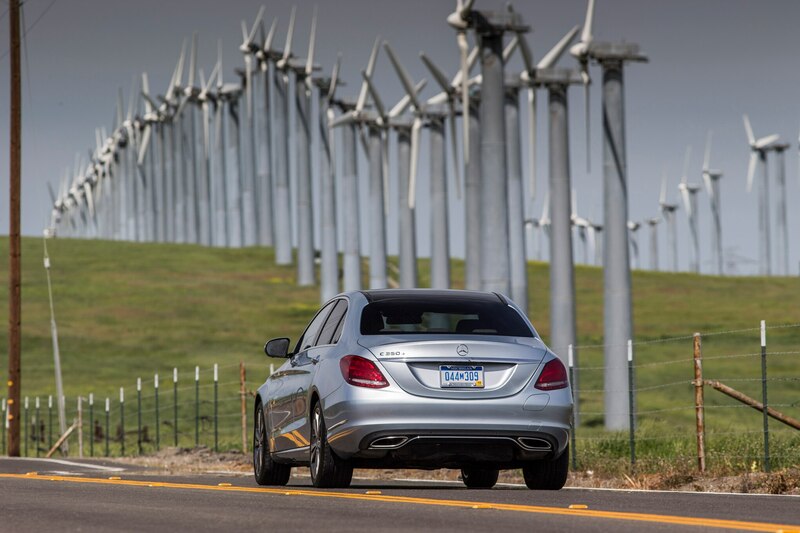 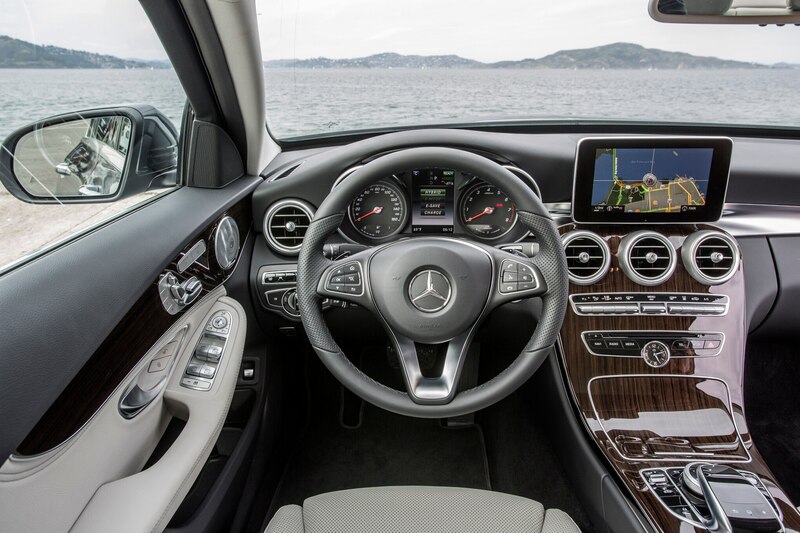 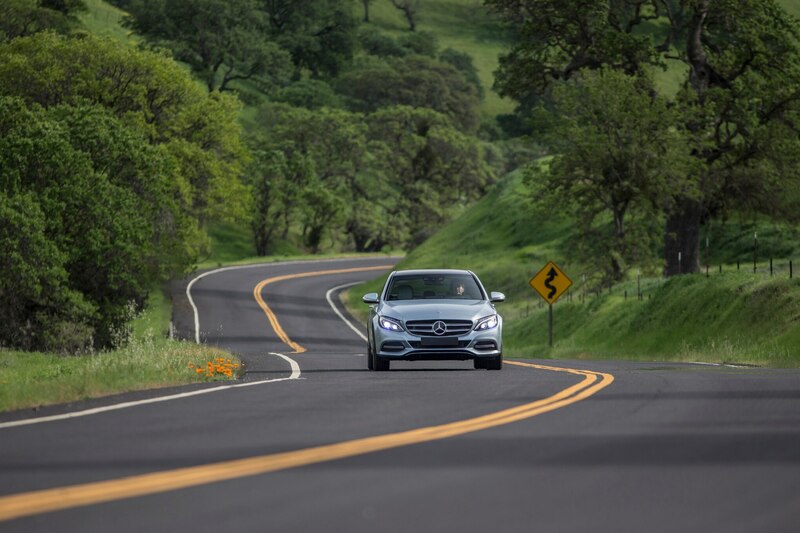 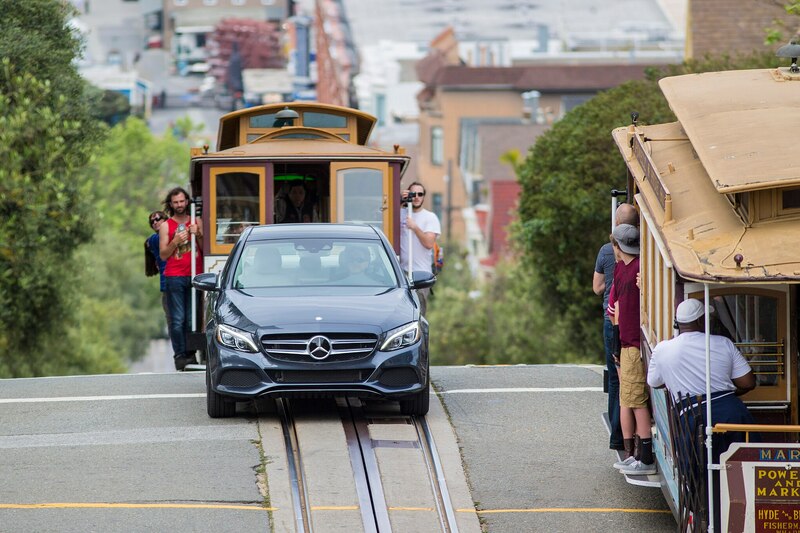 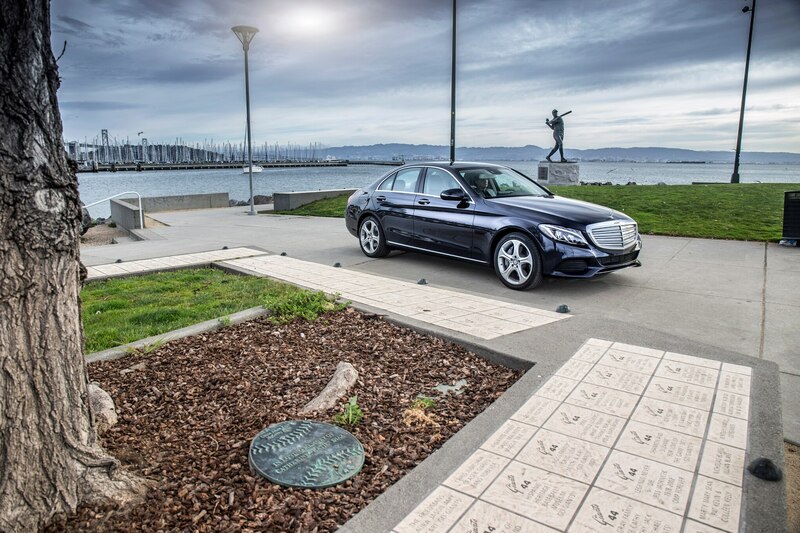 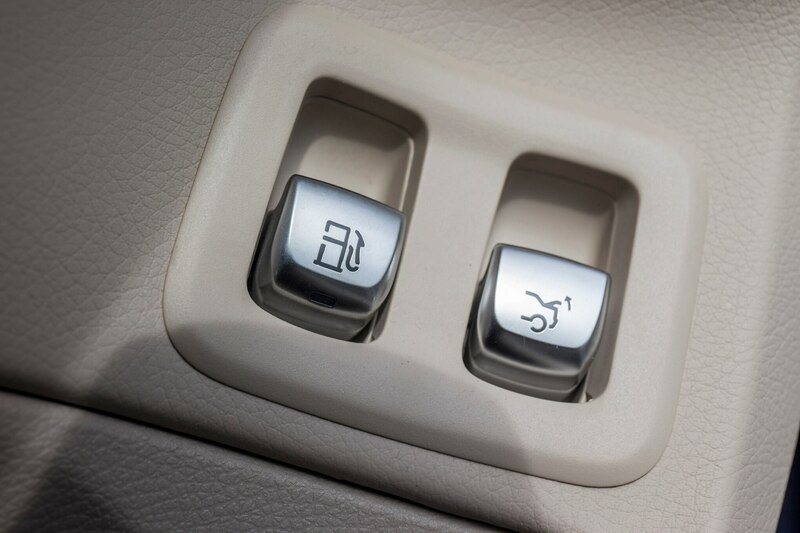 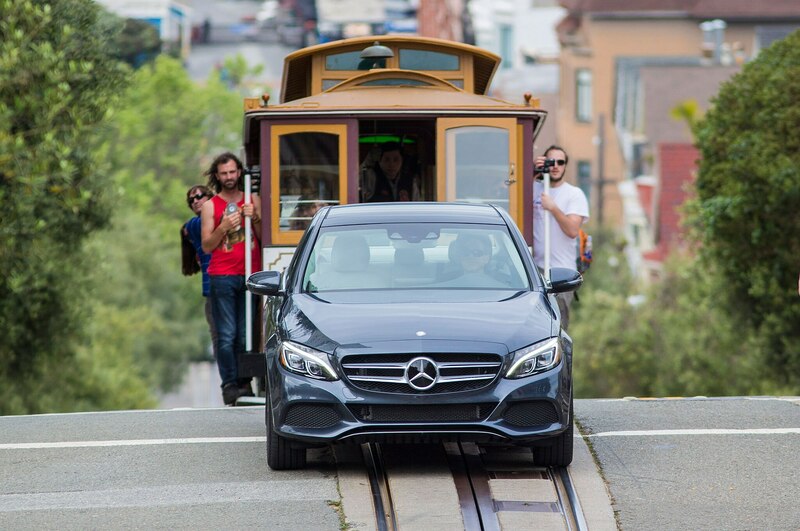 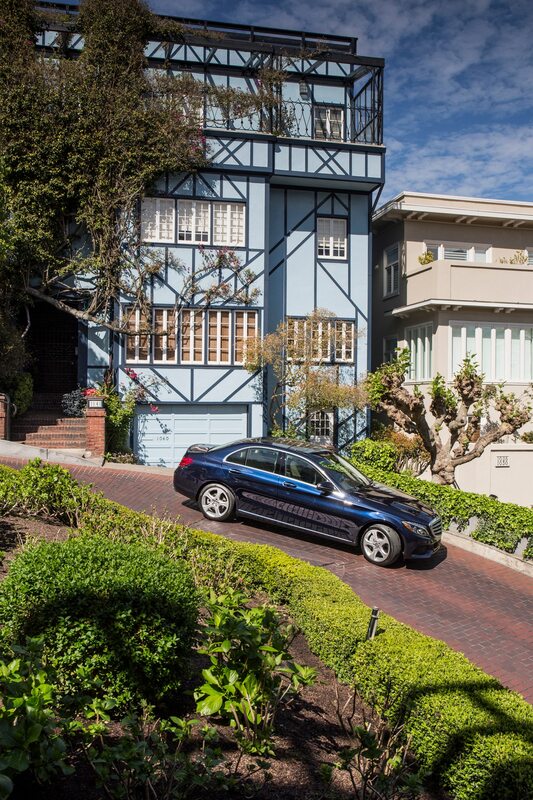 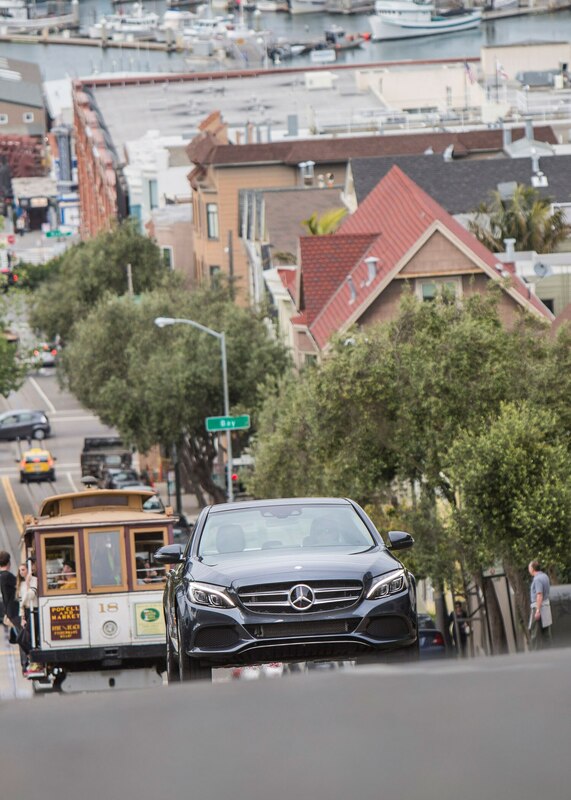 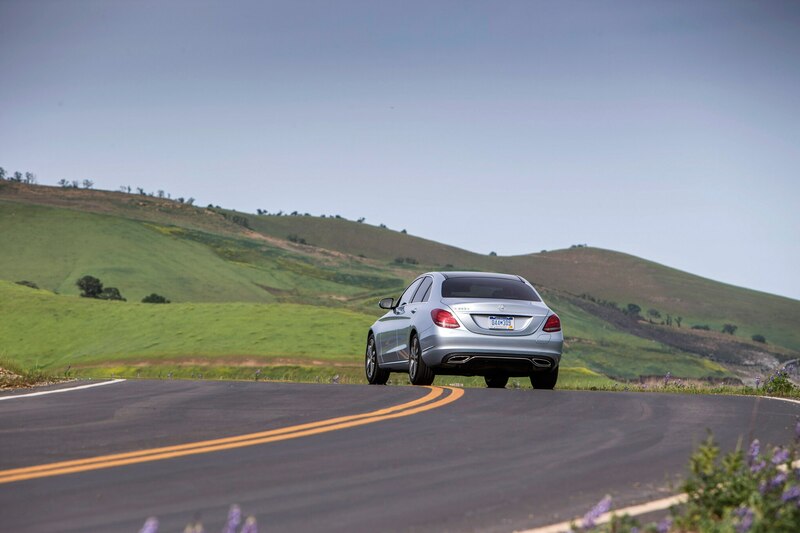 This family escapade was also perfect for testing the extensive technology fitted to the latest C-Class. 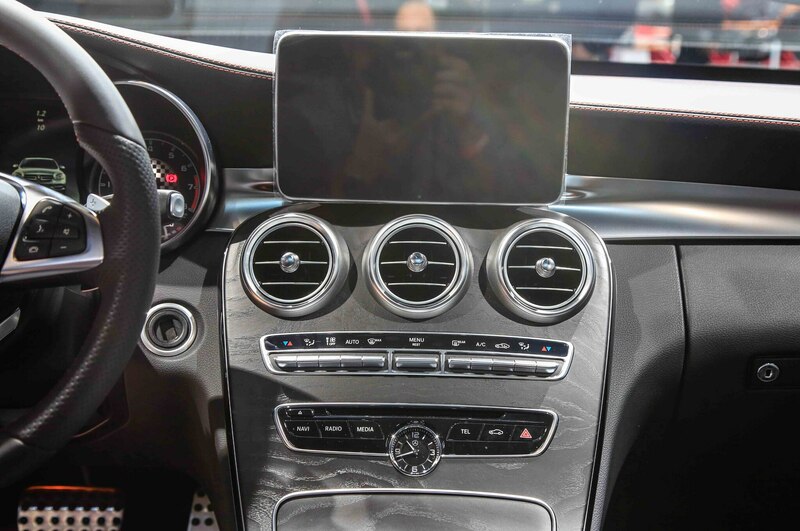 The Wi-Fi hotspot allowed the streaming of SiriusXM Hits 1—the kid’s favorite radio station in the States—from my iPad to the Mercedes via Bluetooth audio. 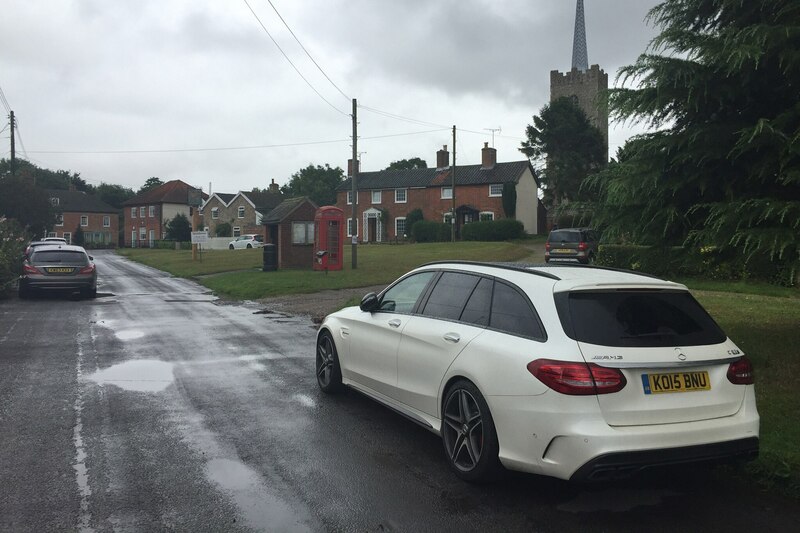 A quick session of Minecraft for the two kids on their iPads during a bout of scenery-dulling heavy rain showers also came along with the handy wireless network. 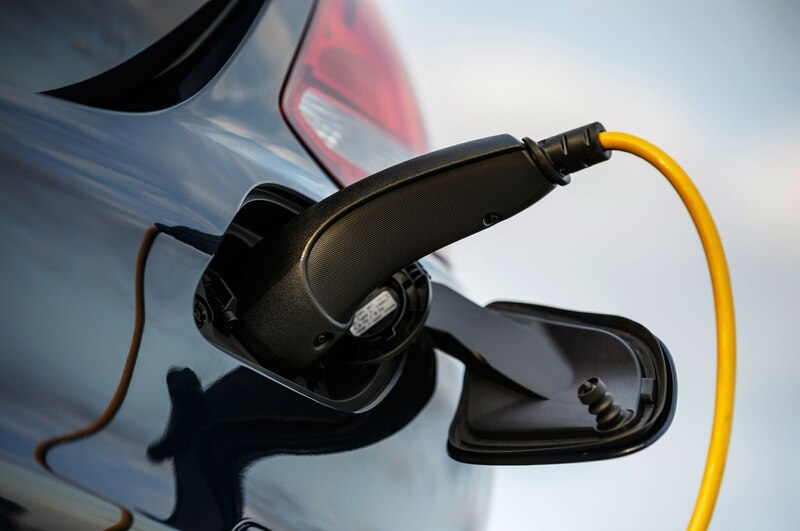 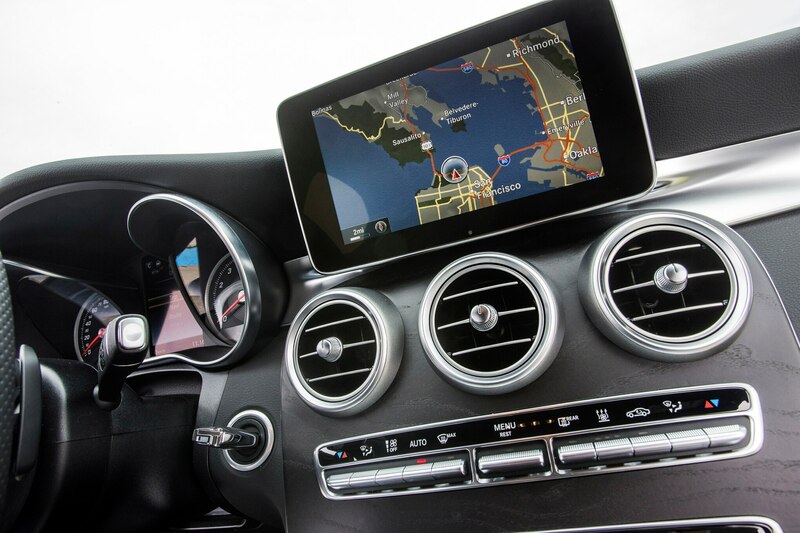 Integrated real-time traffic kept the journey on schedule for the 180-mile run each way, rerouting us as the navigation system received the regular and all-too-common congestion alerts due to the seemingly-eternal busyness of Britain. 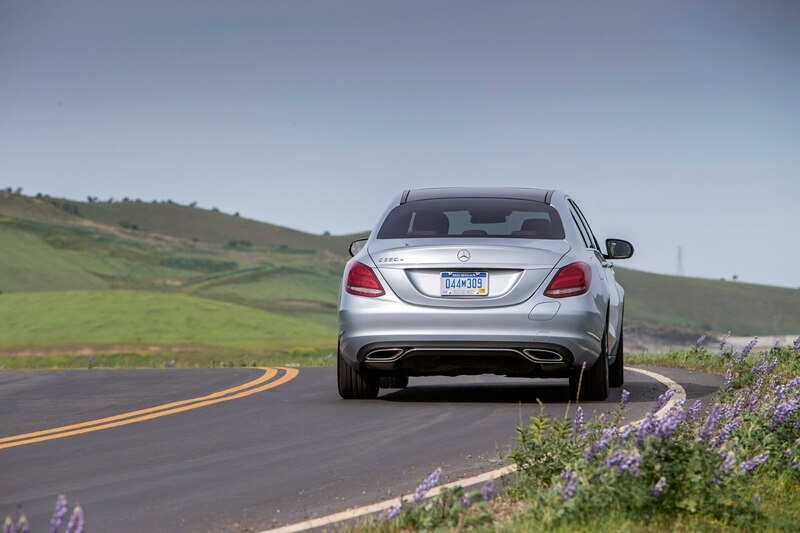 The last 30 miles was the highlight of the trip, at least from a driver’s perspective. 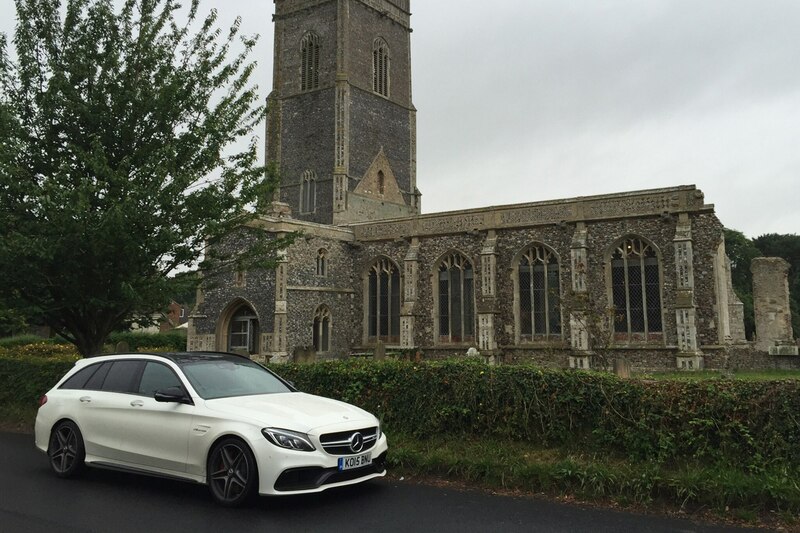 From Needham Market to Walberswick, the A1120, A12 and the B1387 wind their way through the gorgeous Suffolk countryside. 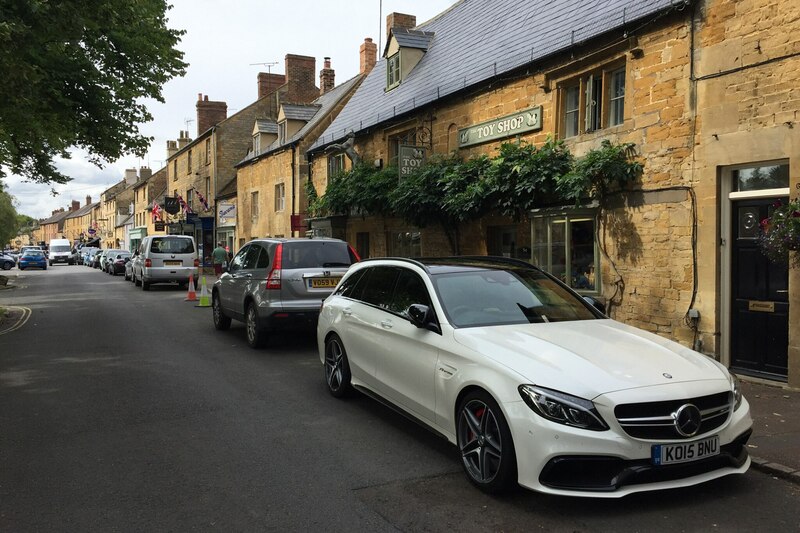 Challenging, narrow rural roads snake through lovely villages carrying strict, 30-mph speed limits. 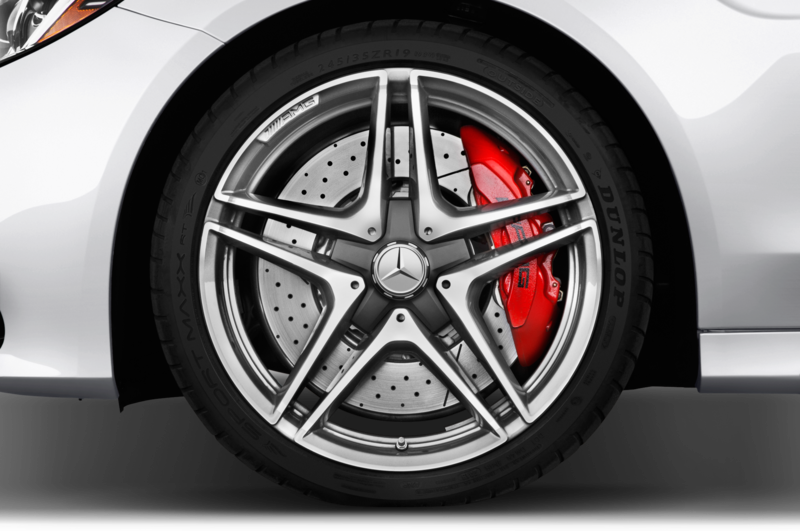 Don’t think of the stringent velocity restriction as a negative, as it’s a perfect opportunity to exploit the fabulous AMG brakes and then fire away from the quaint villages once the speed limit jumps back up to 60 mph. 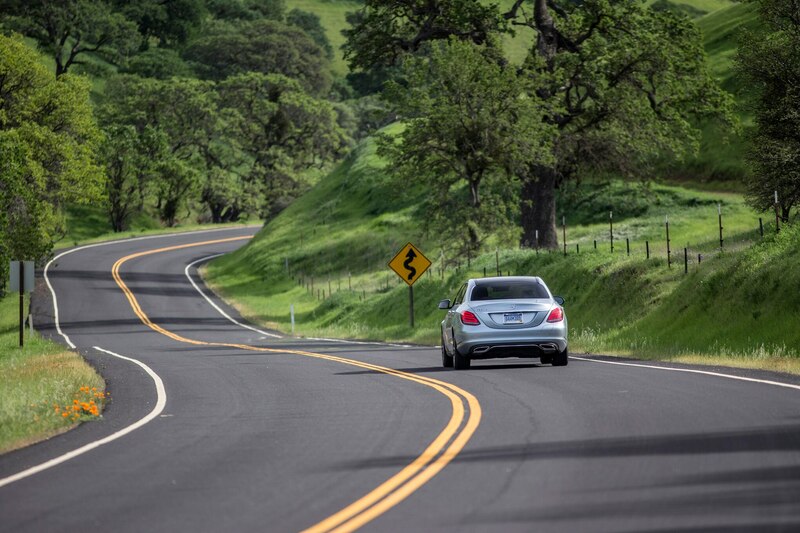 The roads are so tight and twisty that it’s not exactly easy to actually reach 60 mph in many sections. 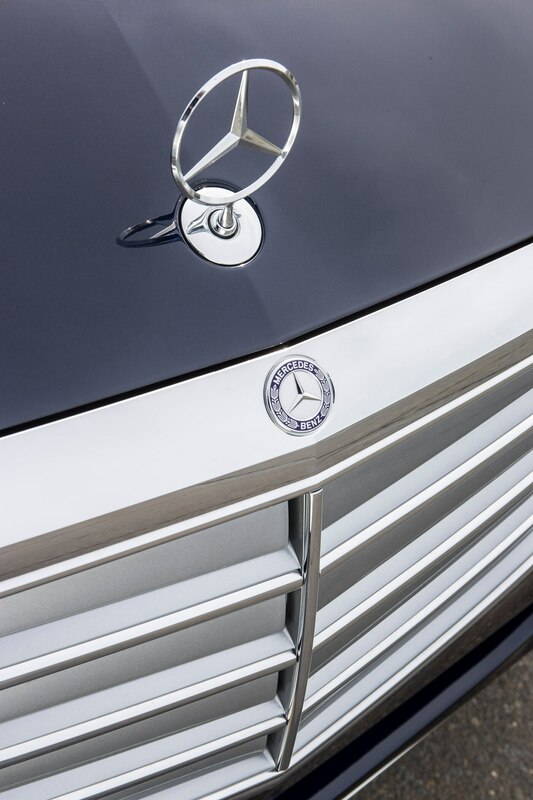 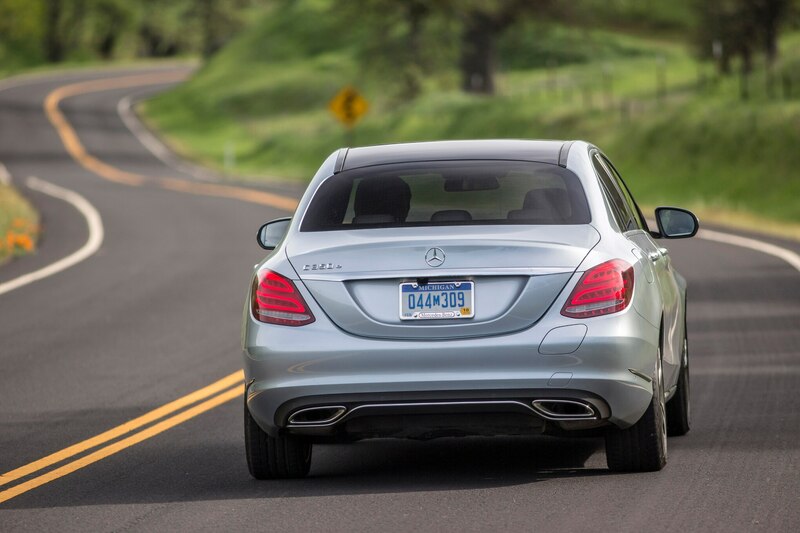 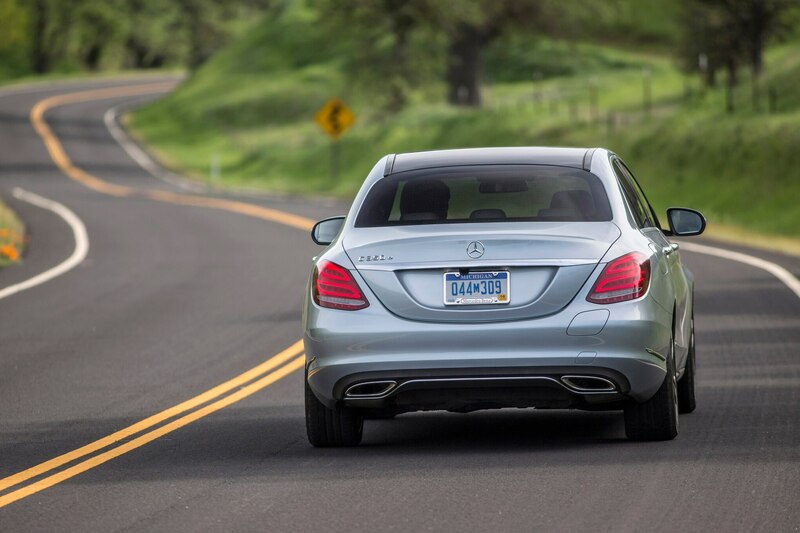 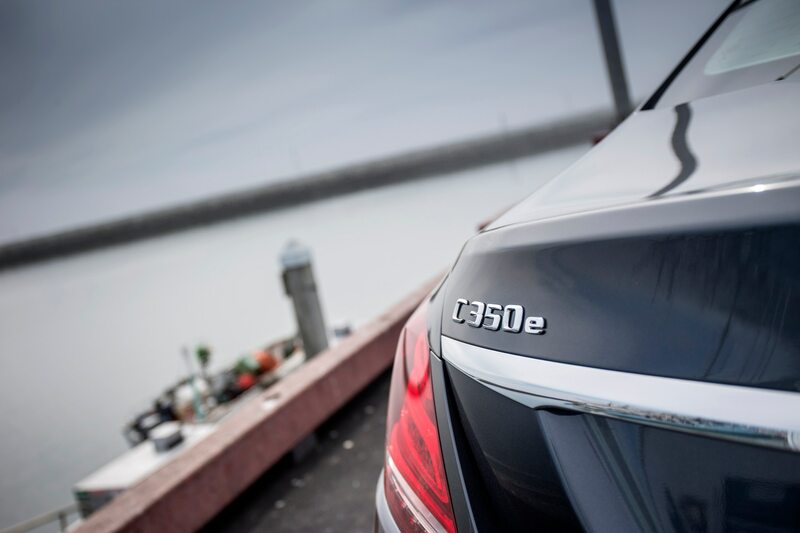 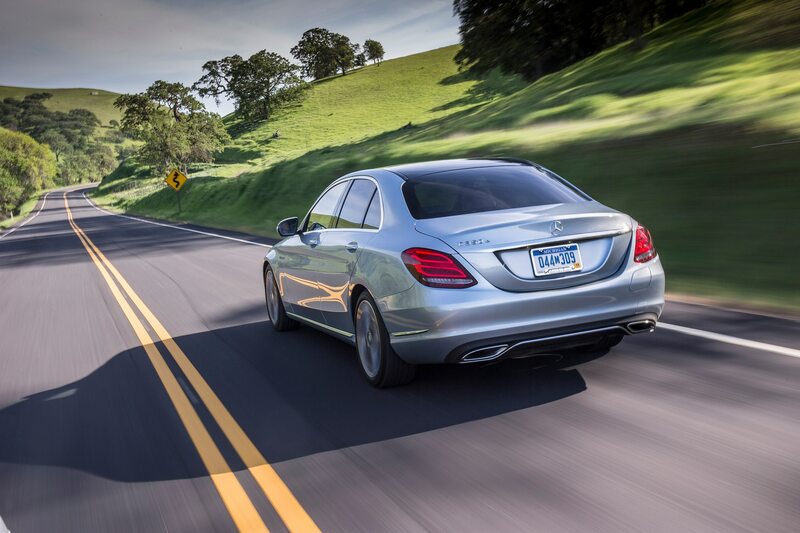 Only the thirst of the twin-turbo V-8 for premium unleaded when pushed slows you down. 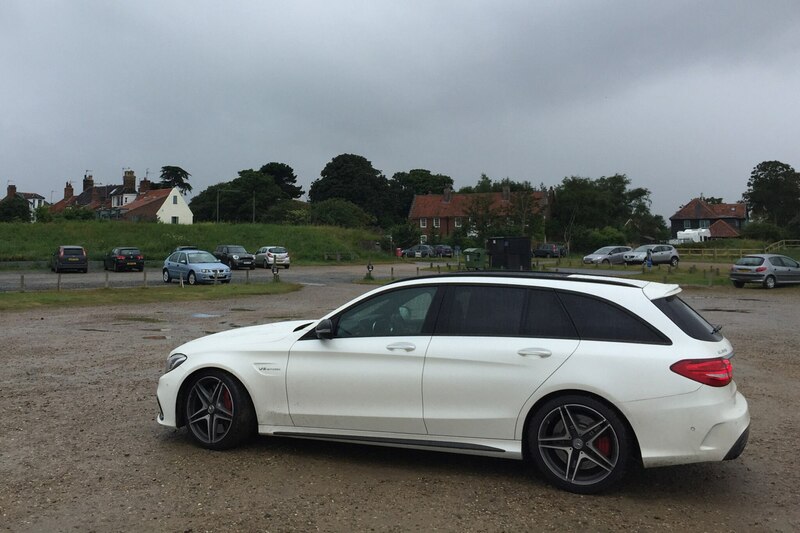 Our fuel economy was actually quite impressive during the 85-90 mph motorway run, averaging 25 mpg. 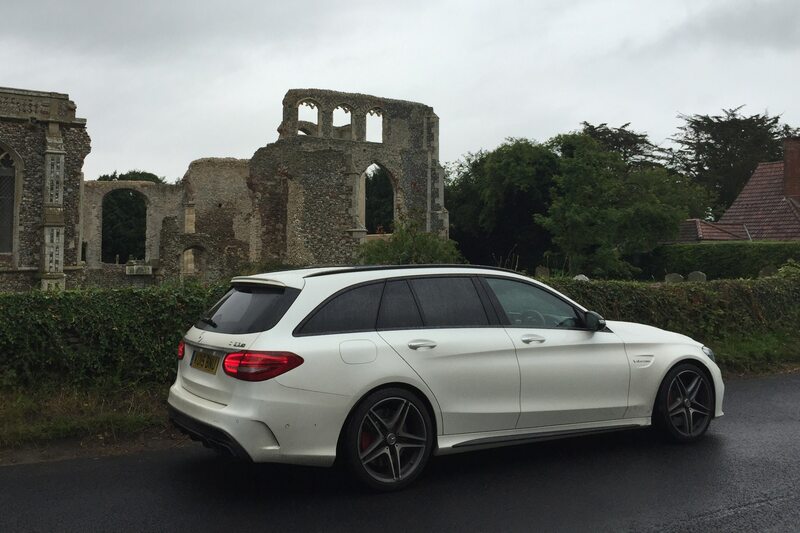 That number quickly dropped to an overall average of 22 mpg for the total journey after we passed Needham Market. 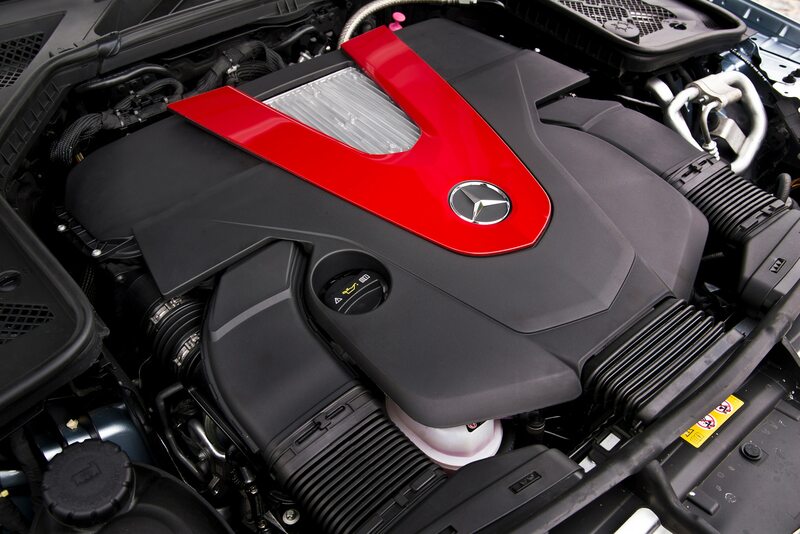 But that’s what happens when you feed the beast. 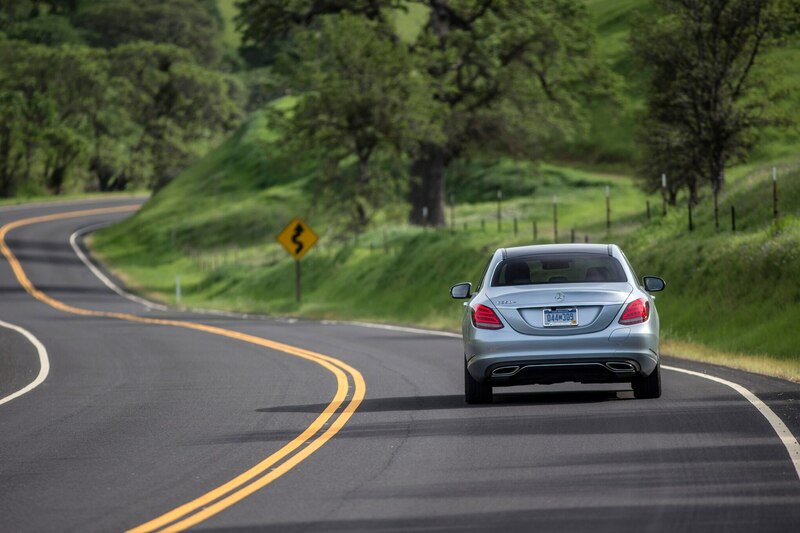 It’s worth it, even at $6.00 a gallon. 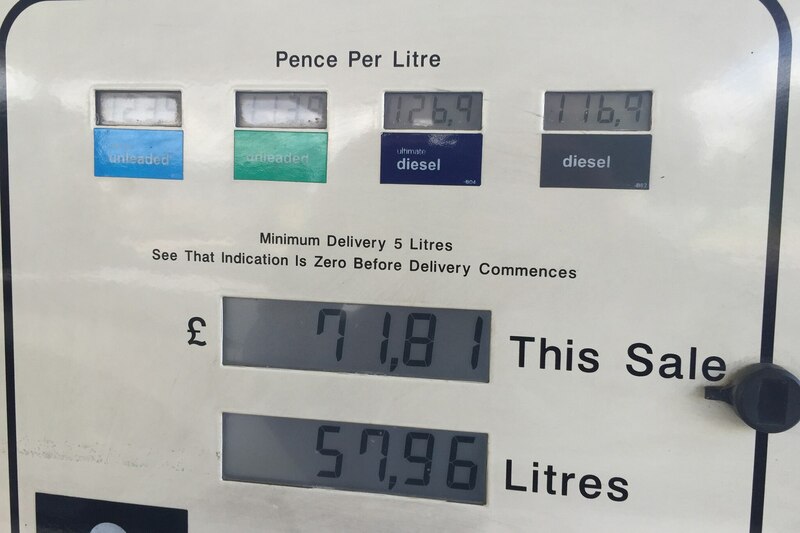 Outside of the cost of fuel in the UK, the complaints after we returned to the Midlands of England were minor. 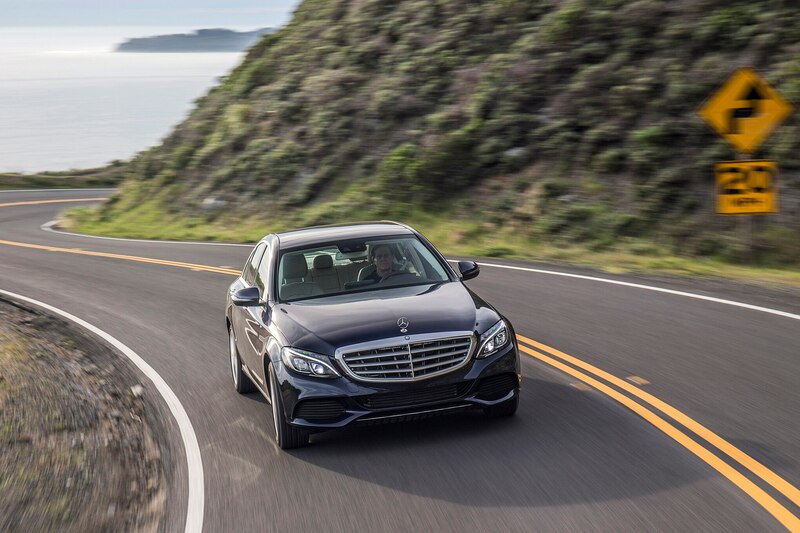 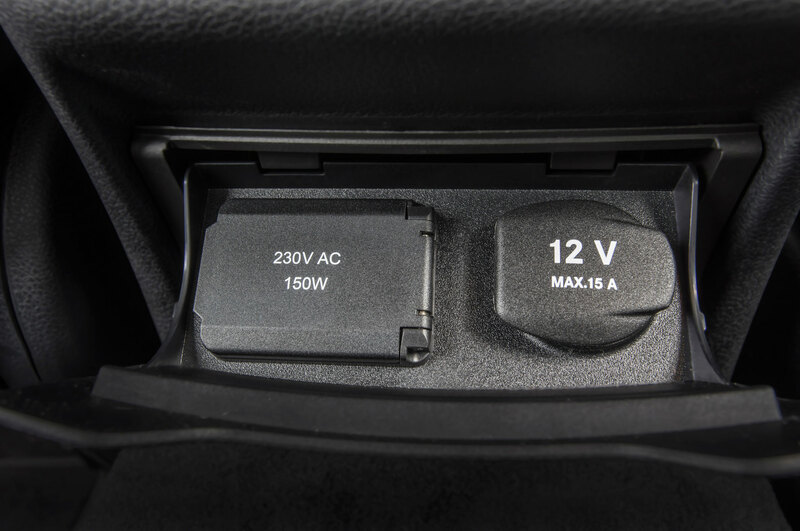 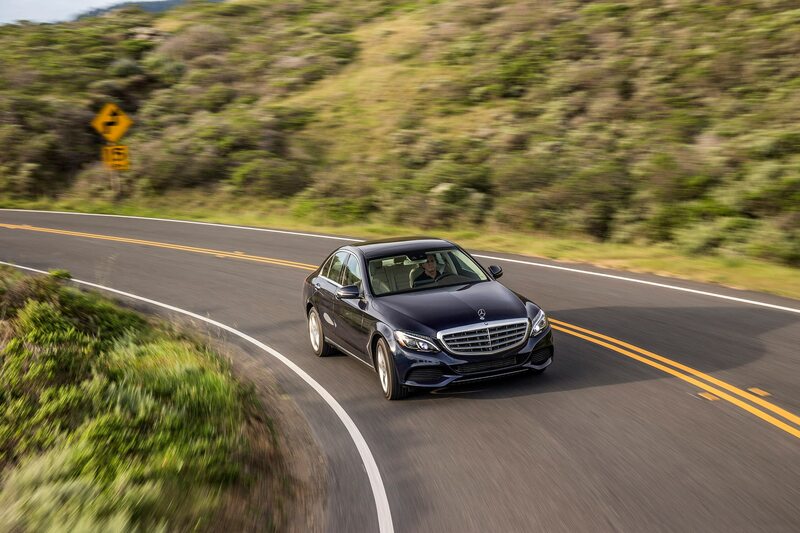 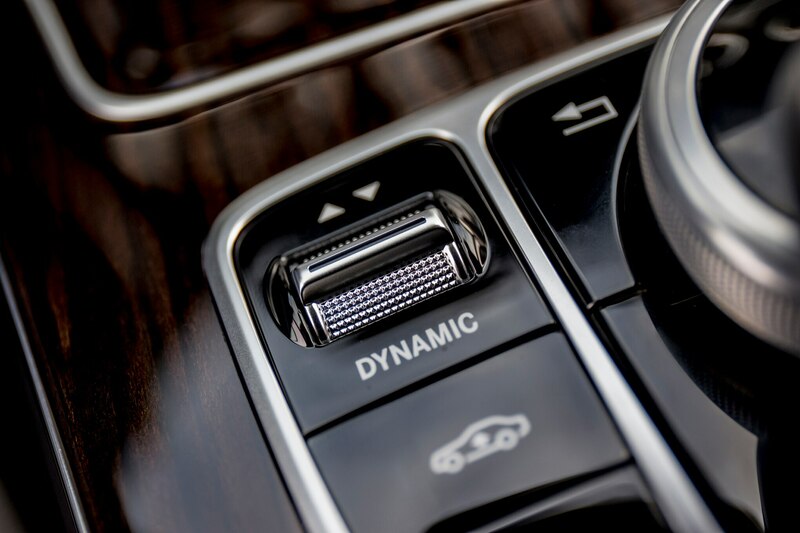 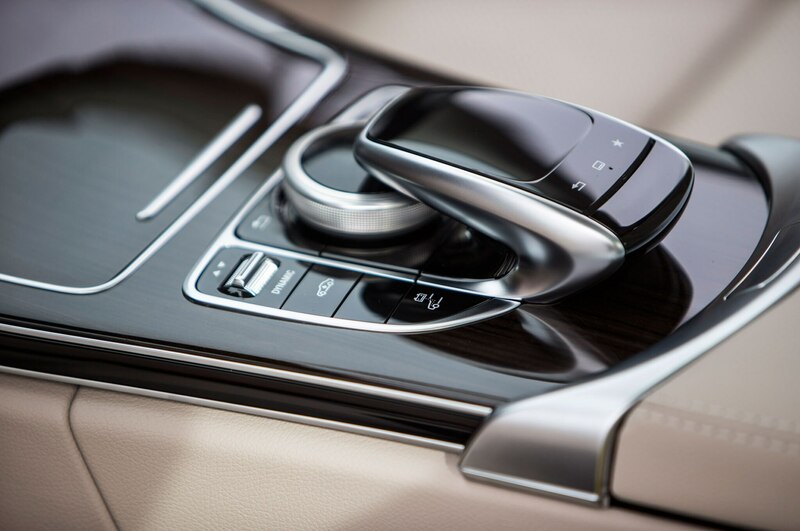 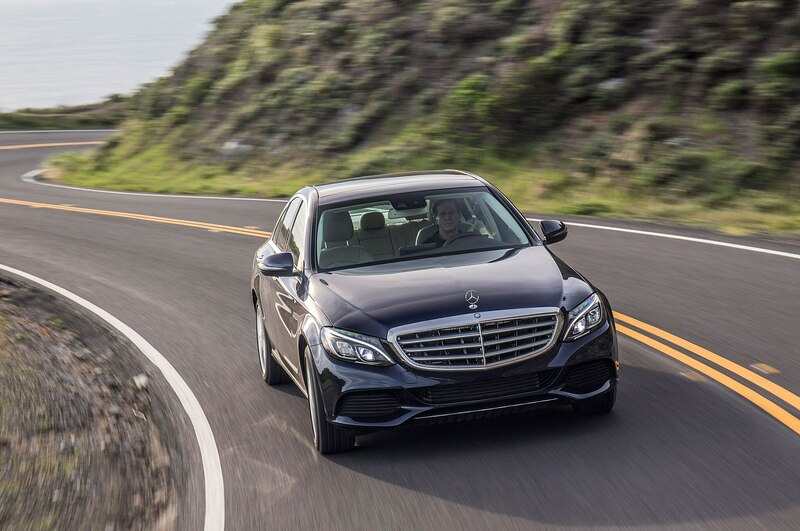 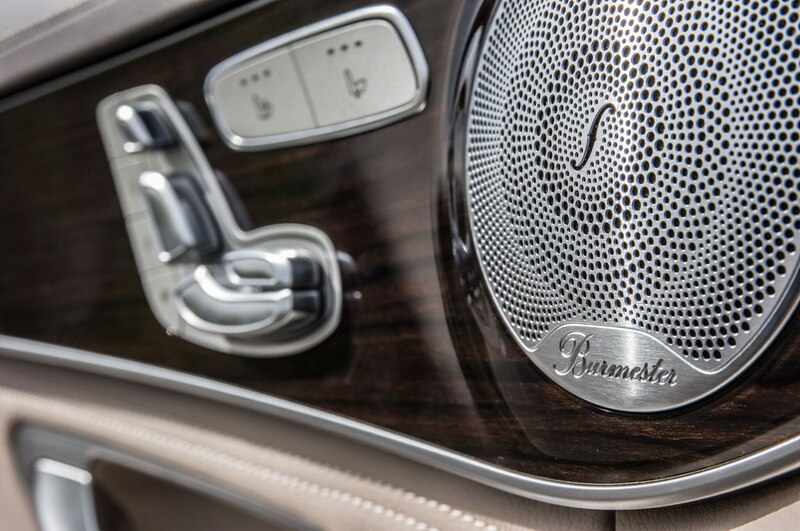 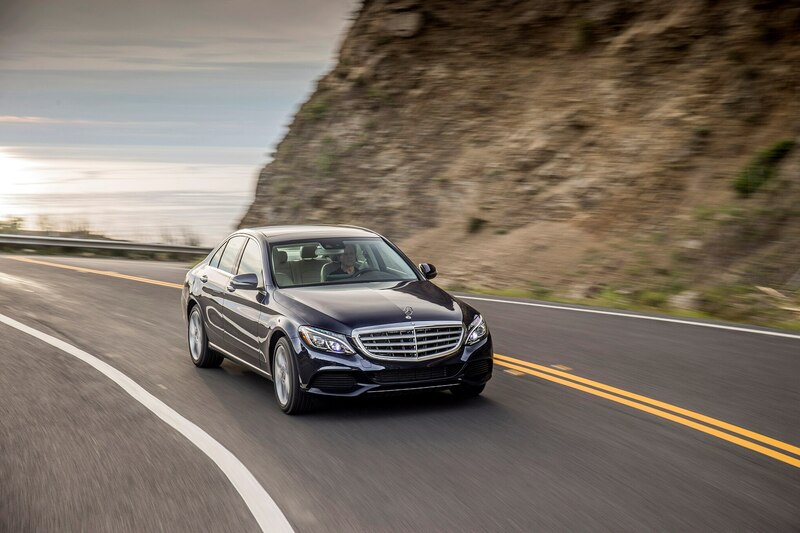 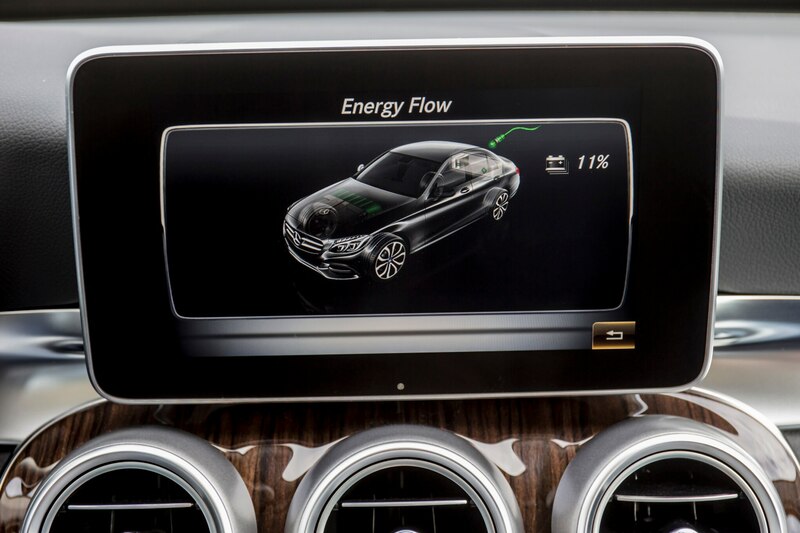 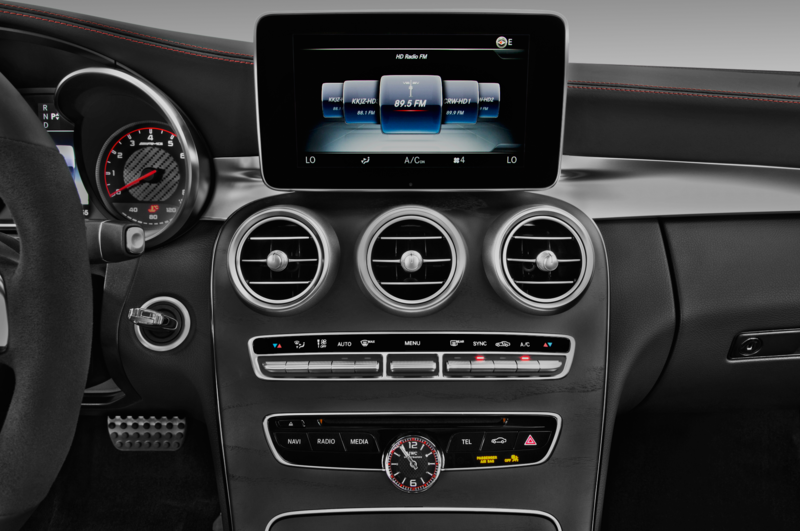 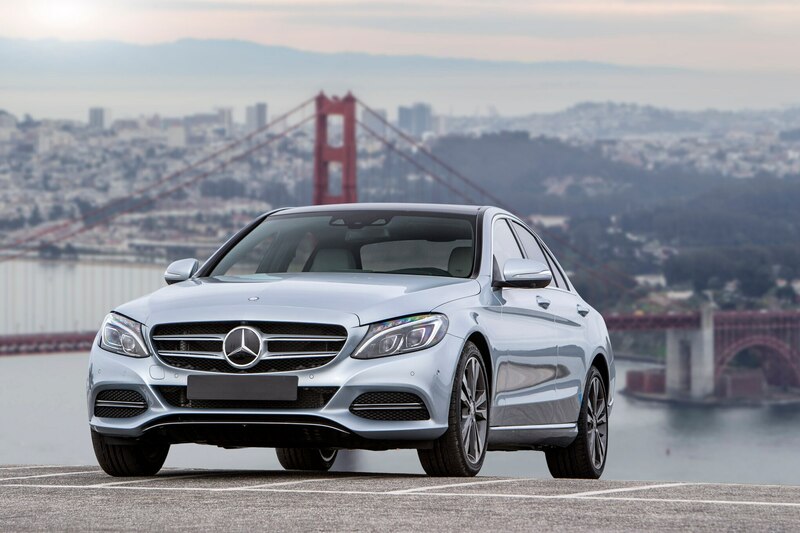 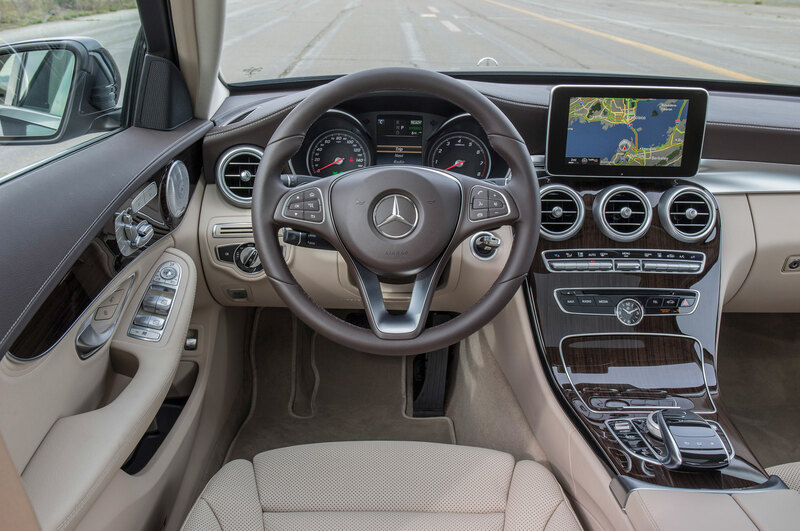 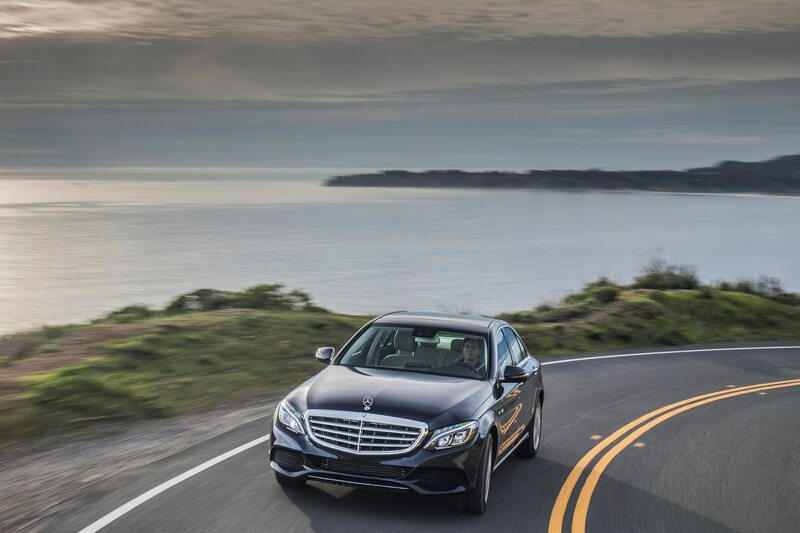 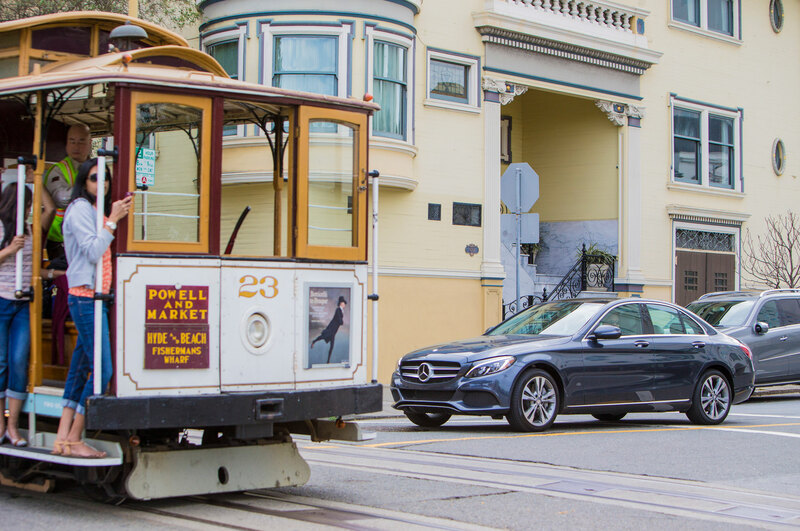 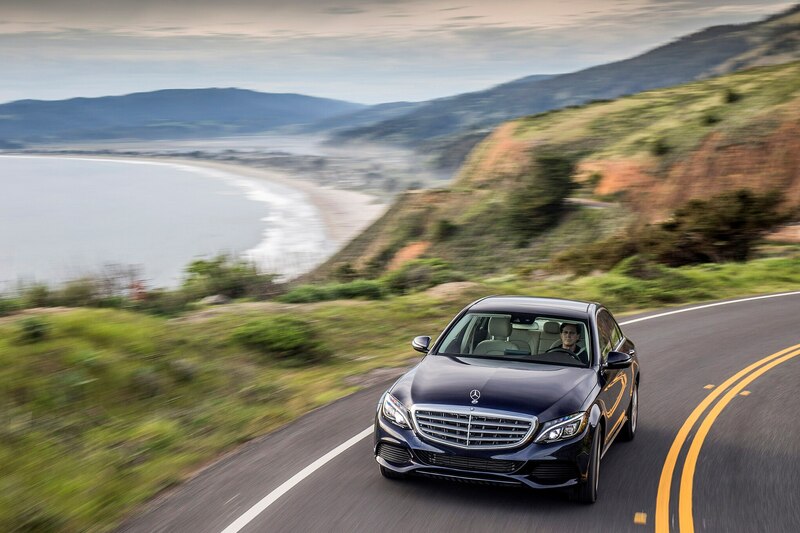 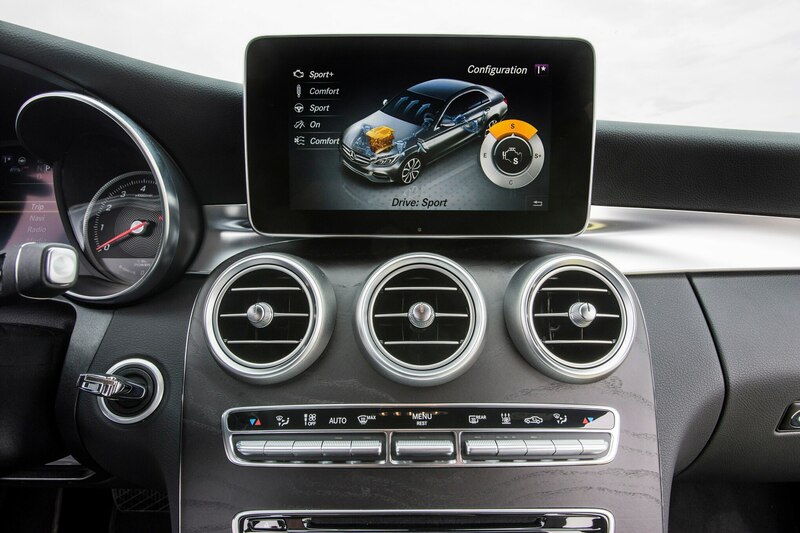 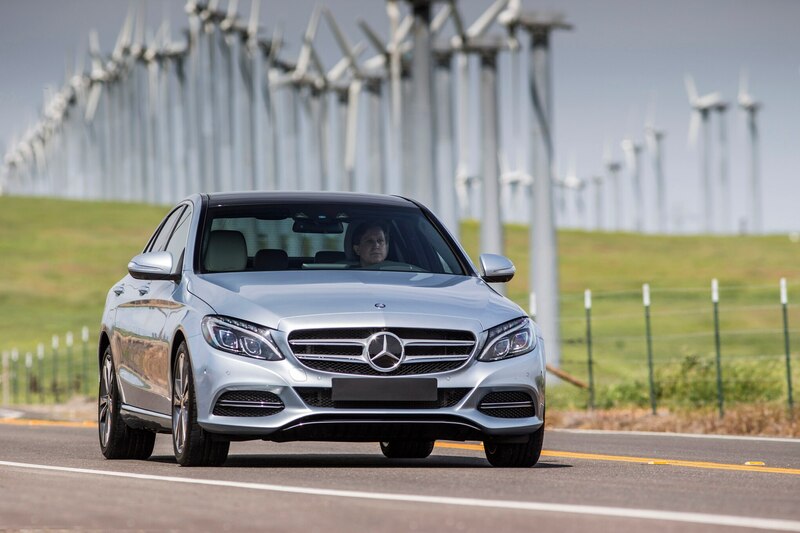 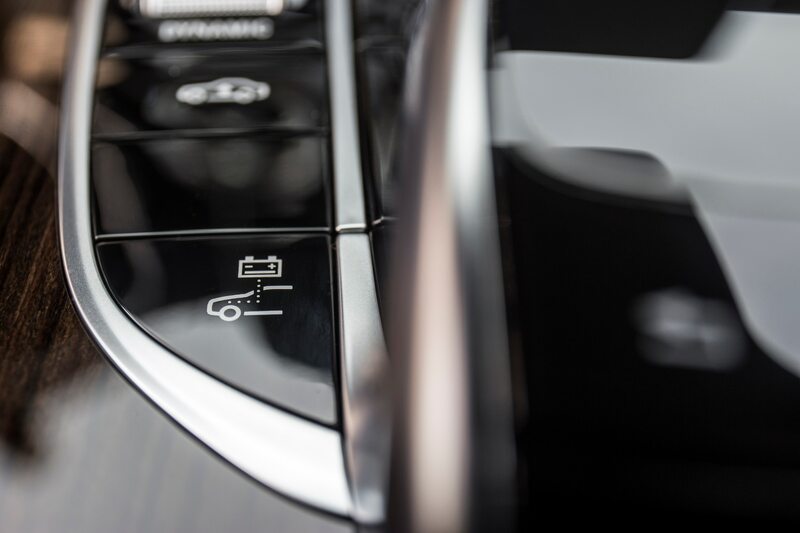 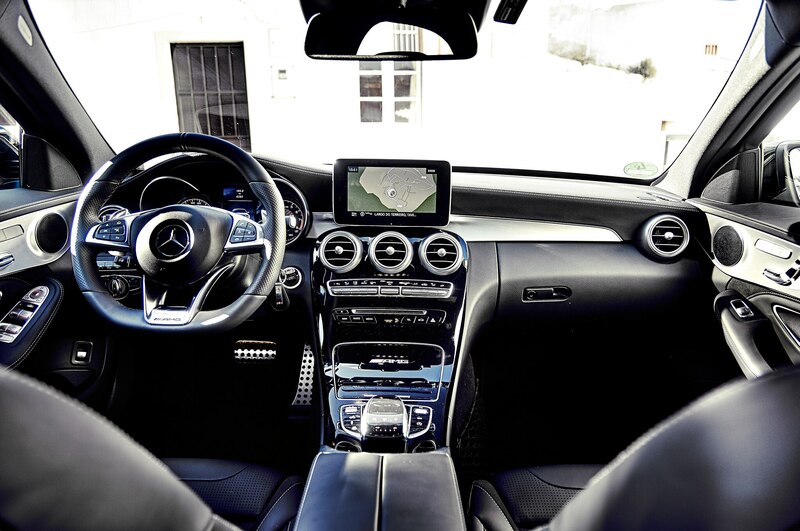 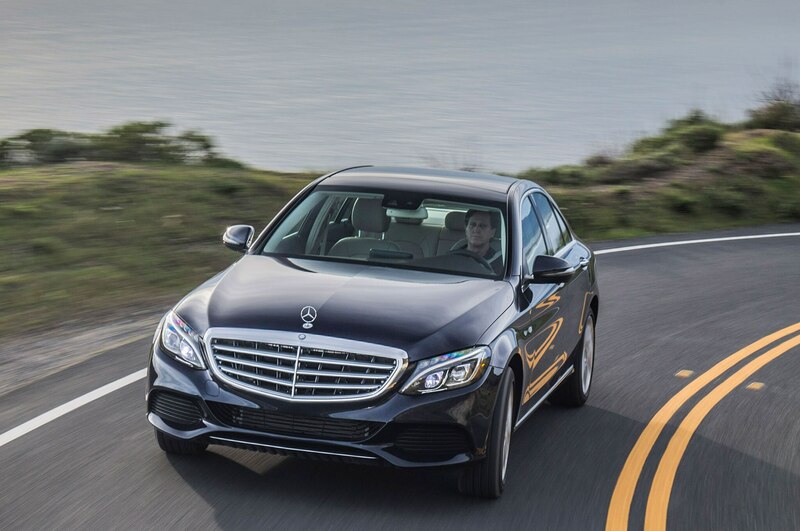 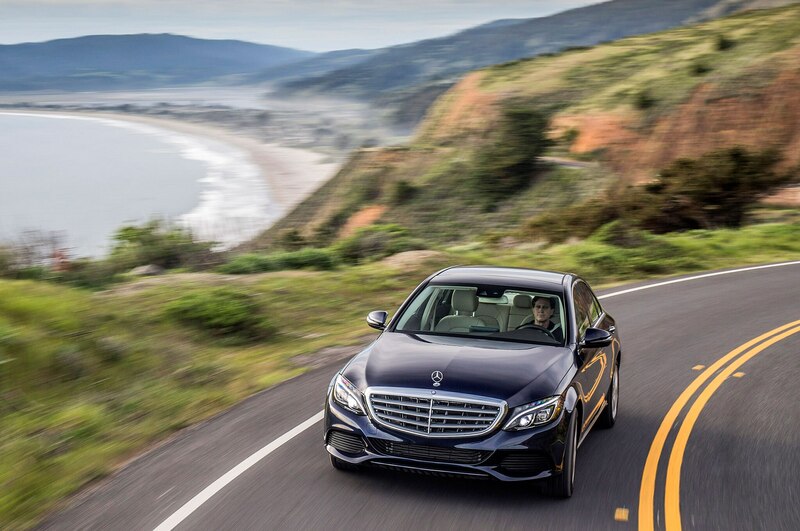 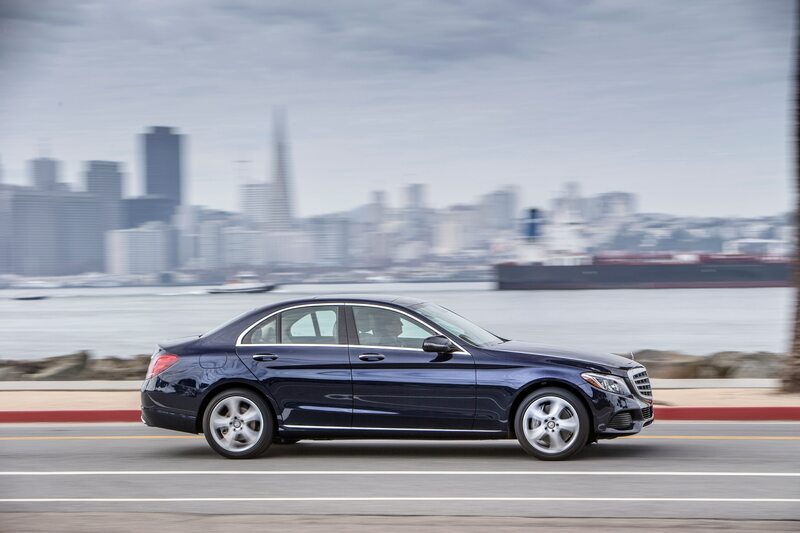 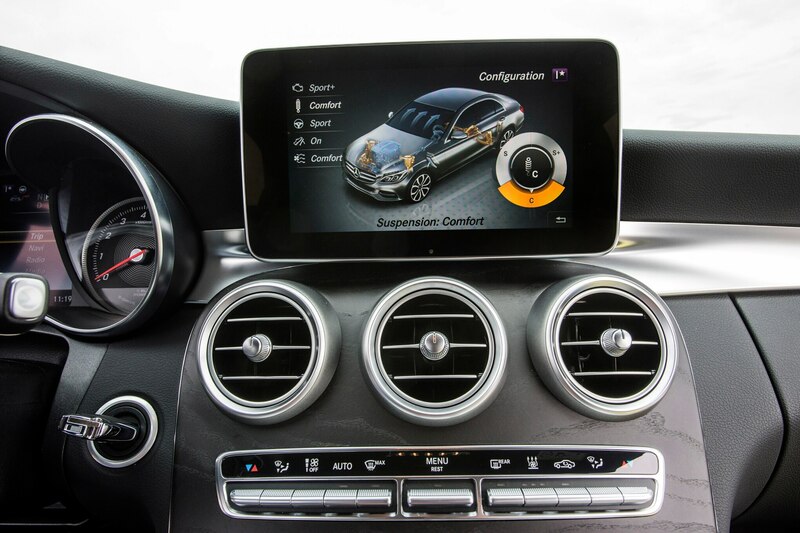 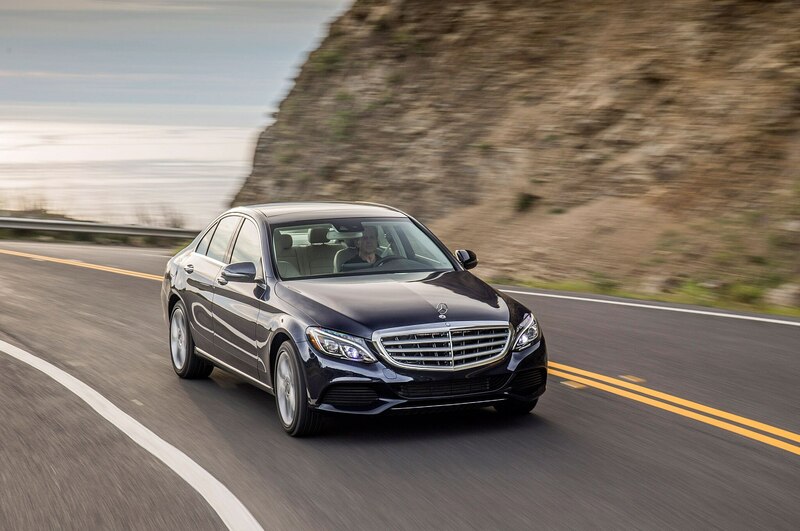 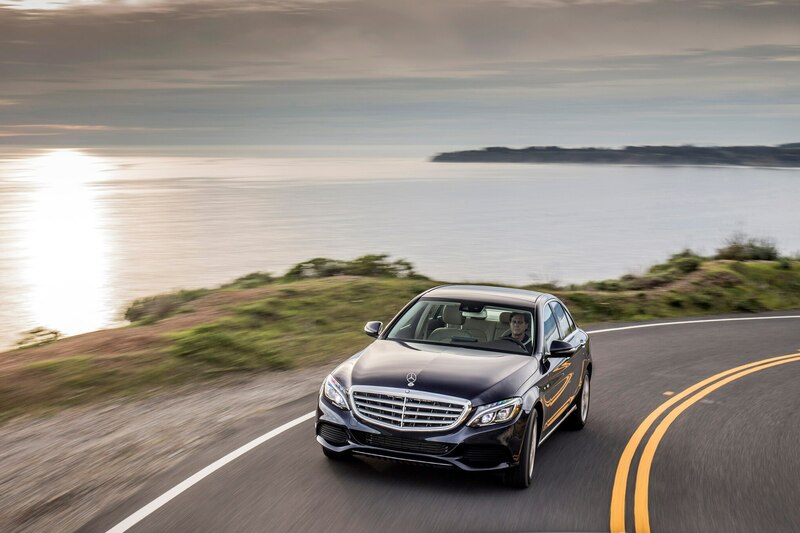 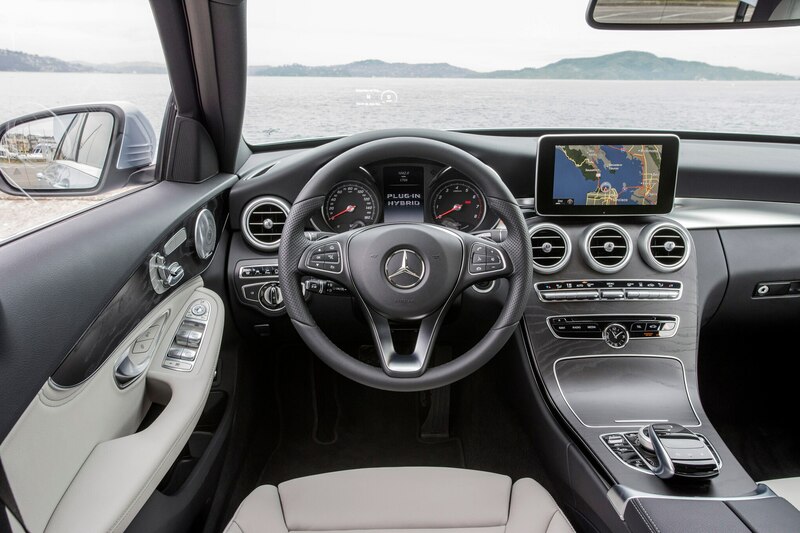 Like with the new E-Class, the lack of dedicated audio system preset buttons and the burying of certain functions into the infotainment system can frustrate. 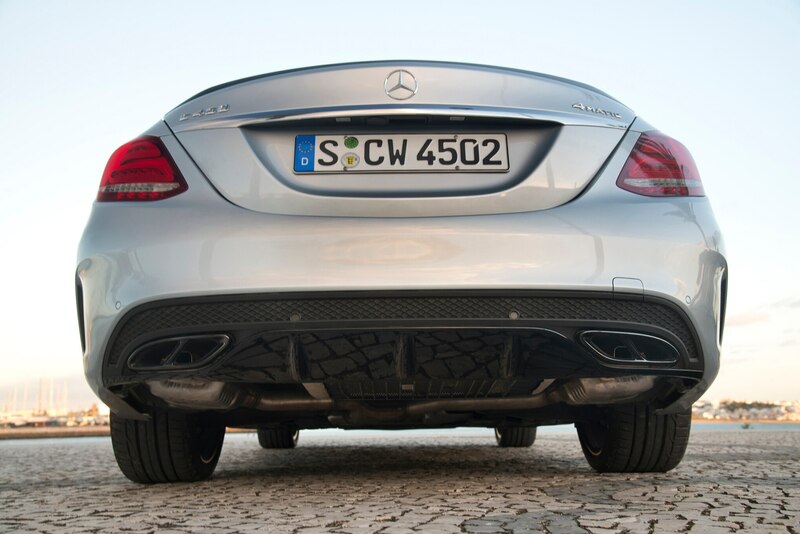 I also wonder if the top-spec “S” version of the C63 is an unnecessary upgrade. 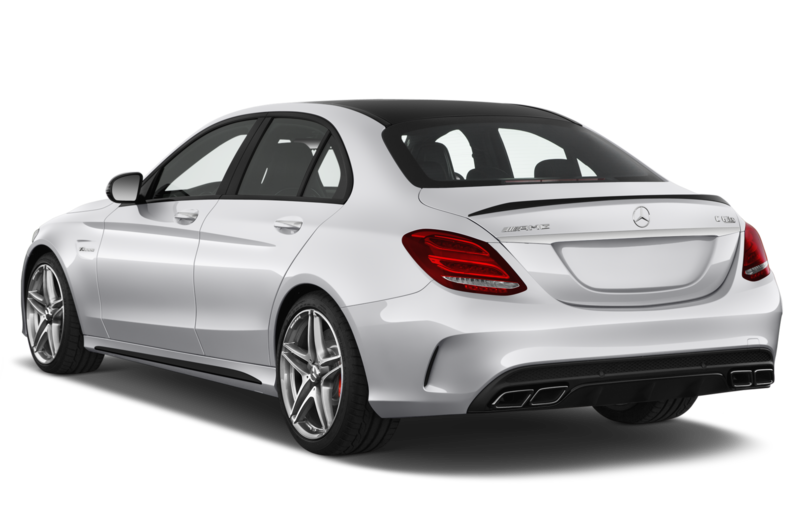 The extra 34 hp and 37 lb-ft of torque and the electronic versus mechanical limited-slip differential are nice extras but I’m not sure you’d really notice their absence the majority of the time. 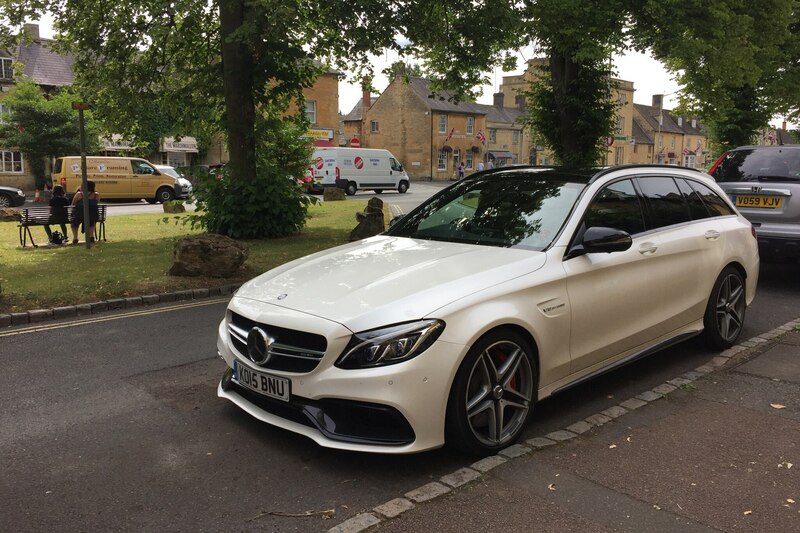 Key to the base C63, at least in England, is that it doesn’t come standard with the somewhat overly aggressive Recaro AMG performance seats. 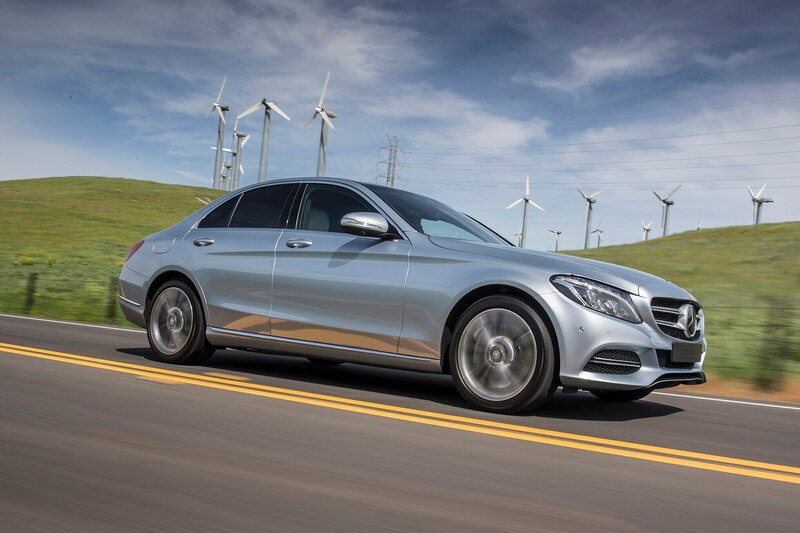 Plus, the less-powerful model carries 18-inch versus 19-inch wheels. 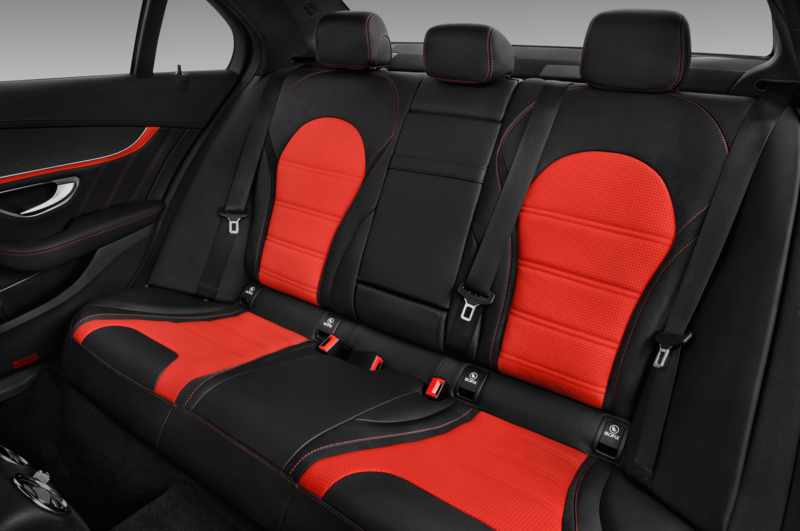 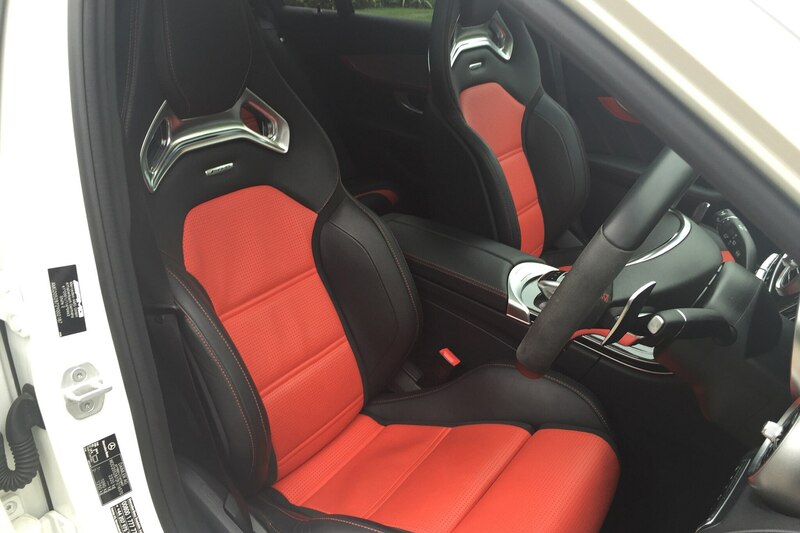 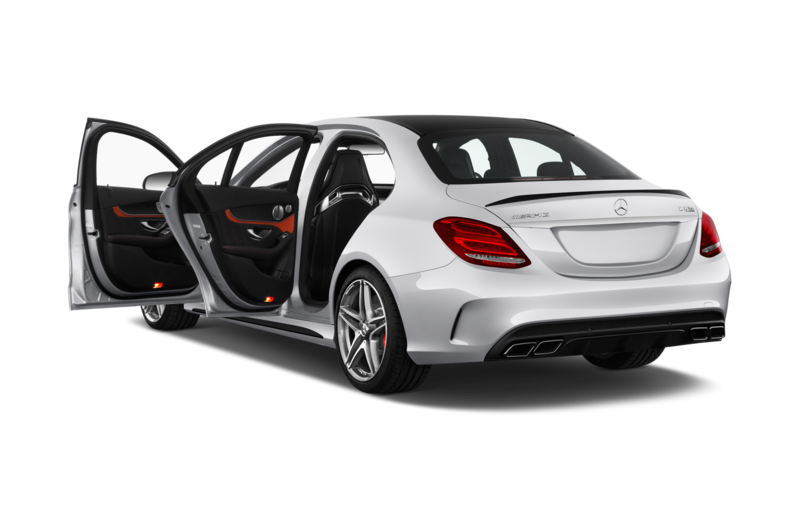 Both C63 models come standard with 3-way adjustable suspension but the softest ‘comfort’ mode is truly the only usable setting in the UK. 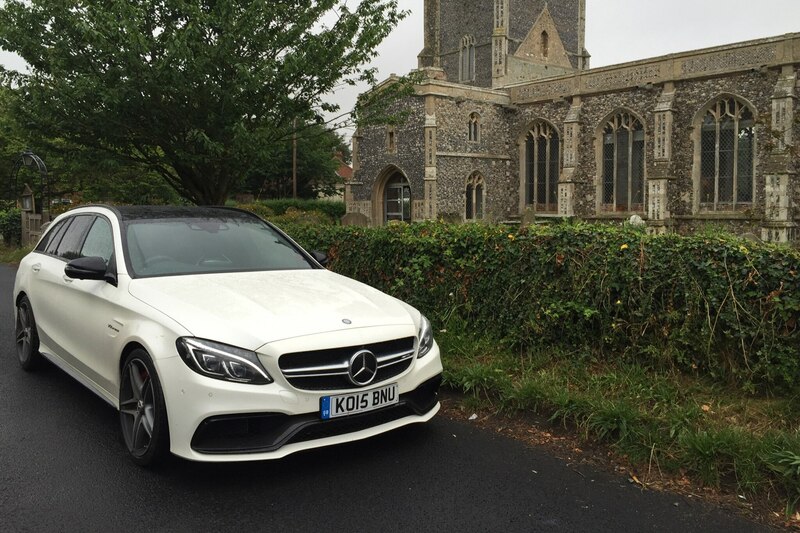 Unfortunately, the C63 S carries a stiff and slightly-crashy ride off of the motorway or smooth A road, even in the cushiest setting. 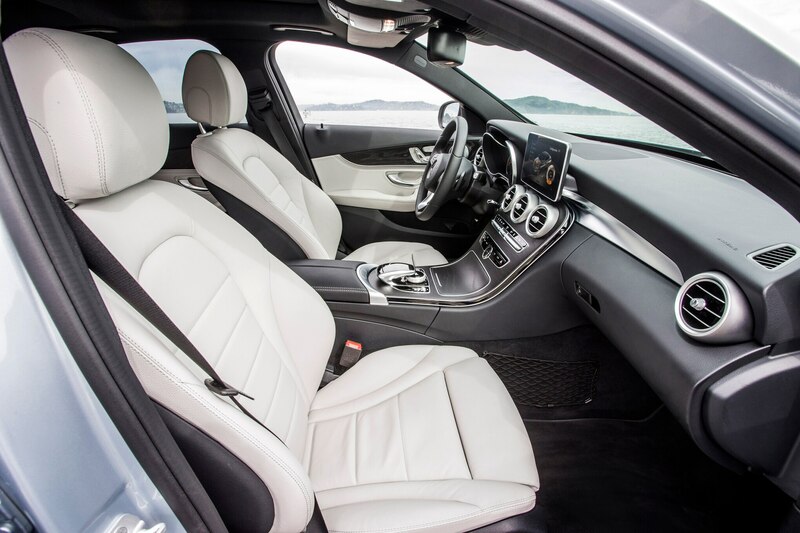 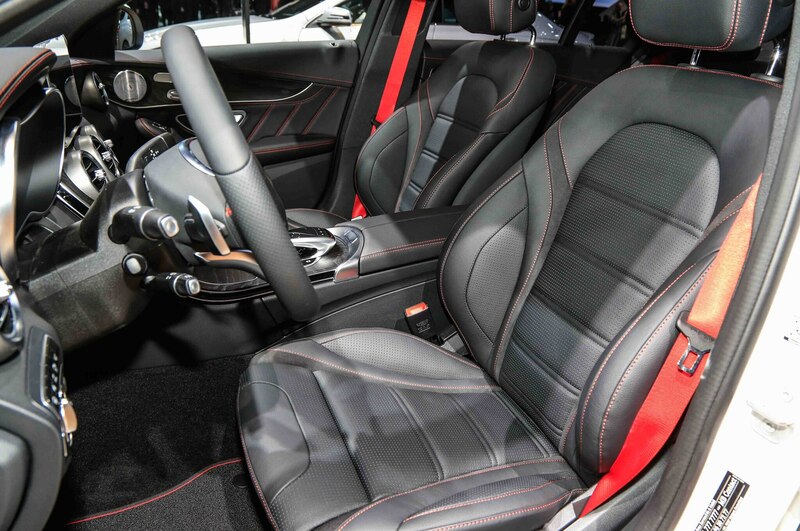 Swapping the hard Recaro seats for conventional AMG sport seats and running smaller wheels with taller tires would surely help. 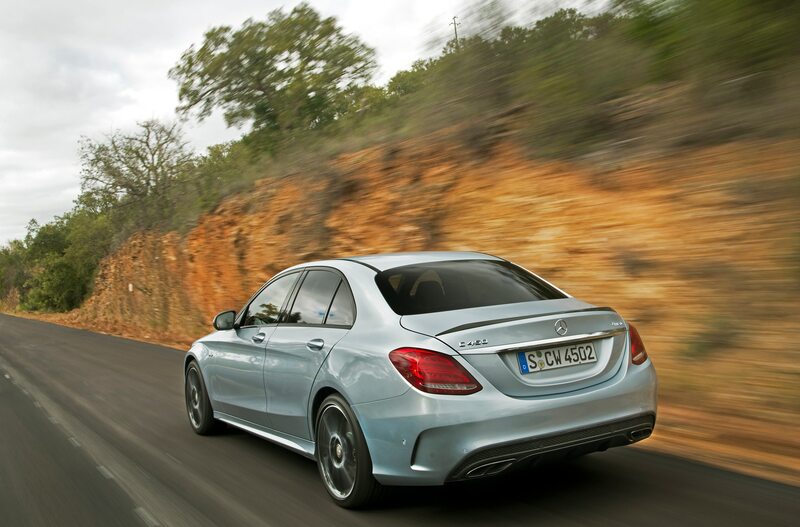 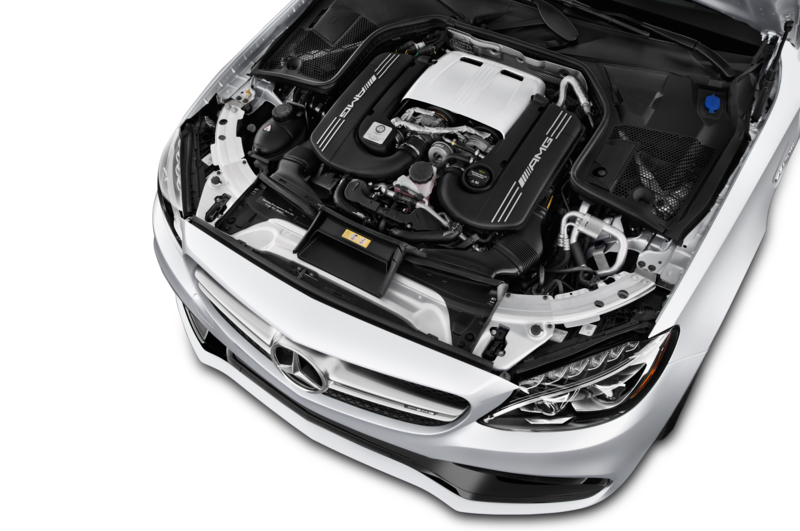 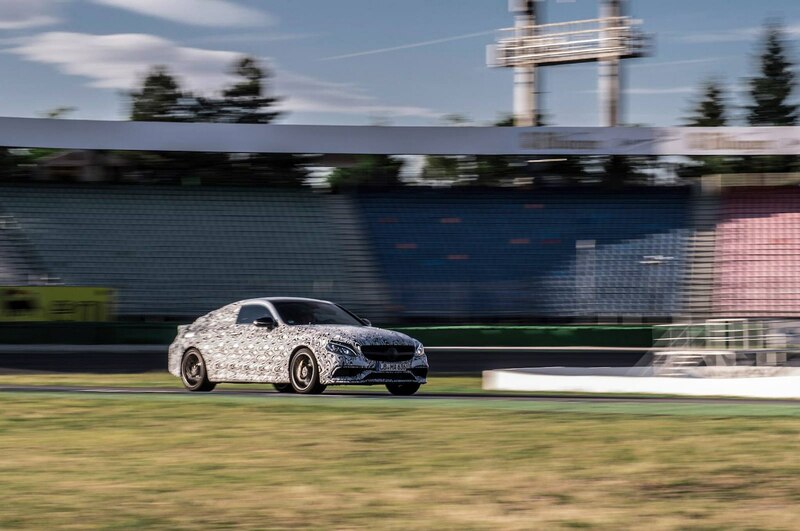 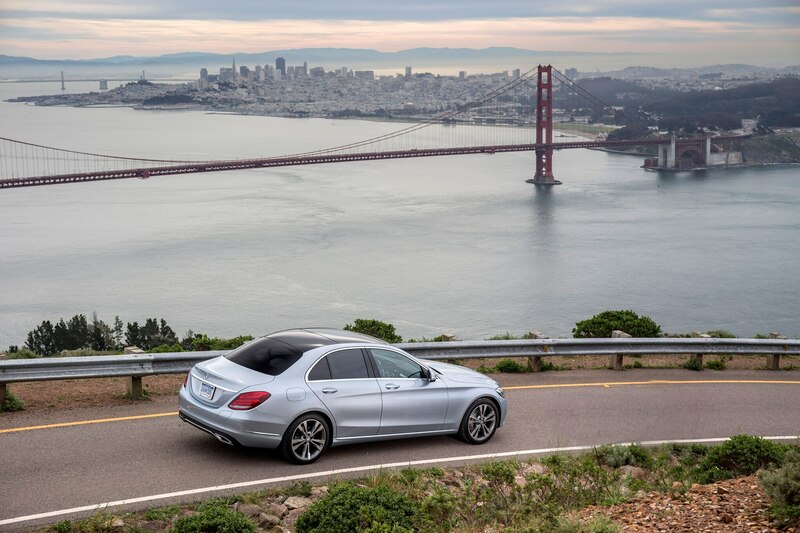 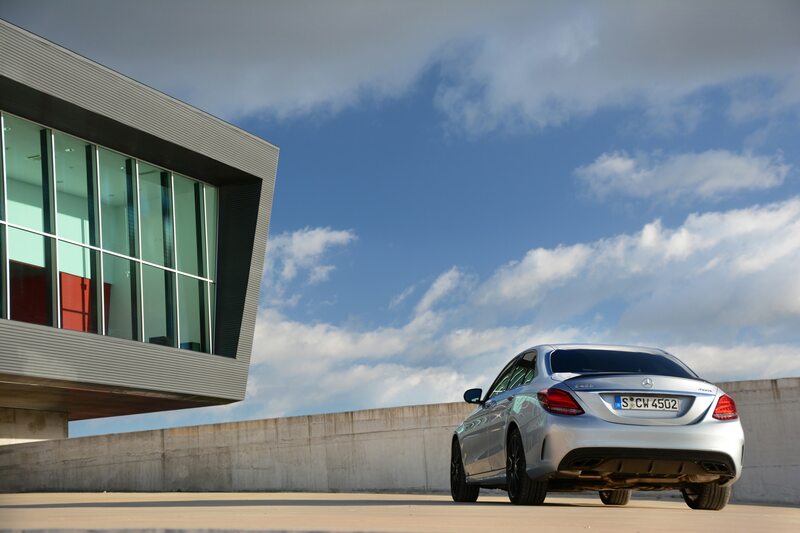 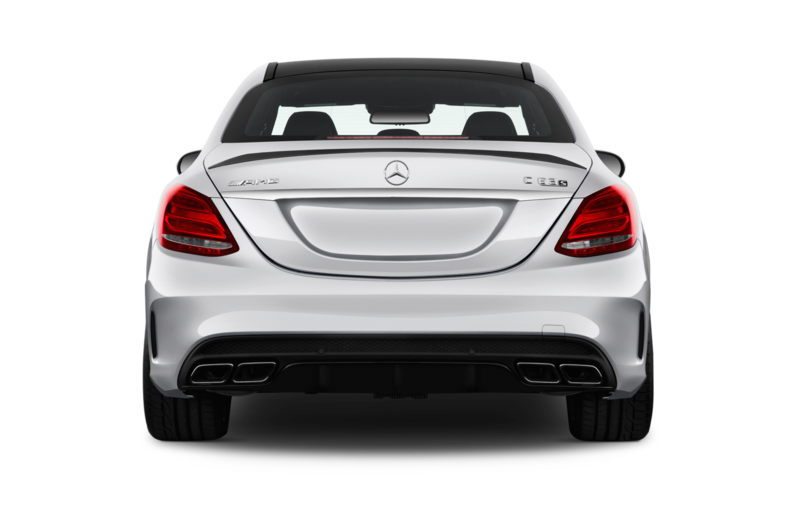 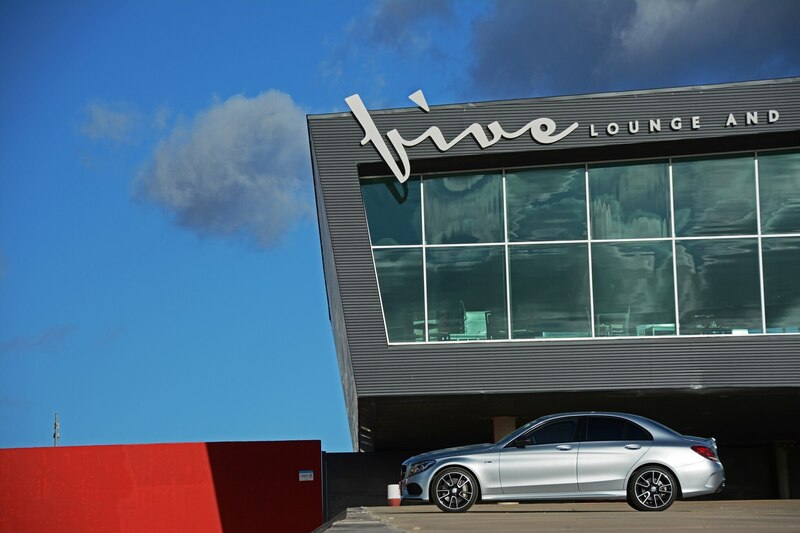 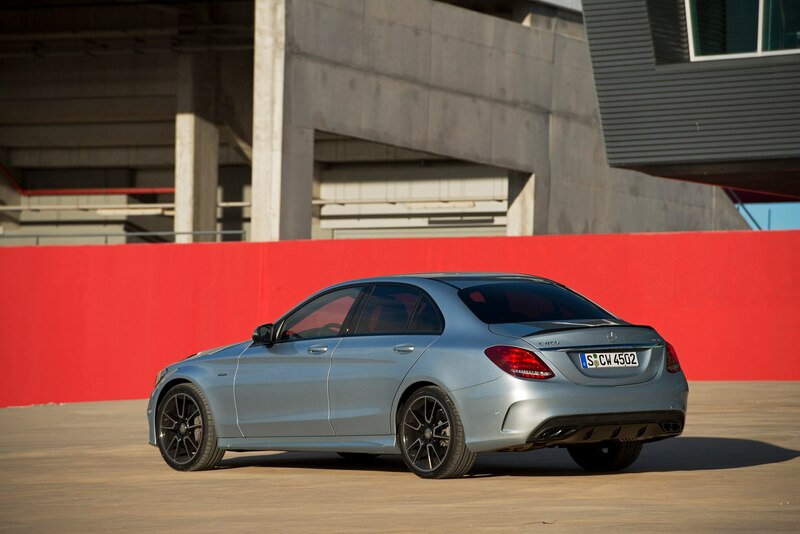 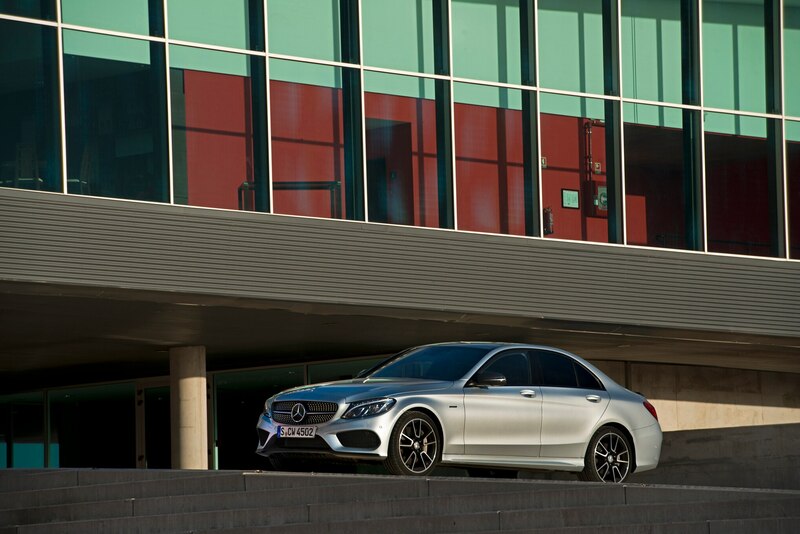 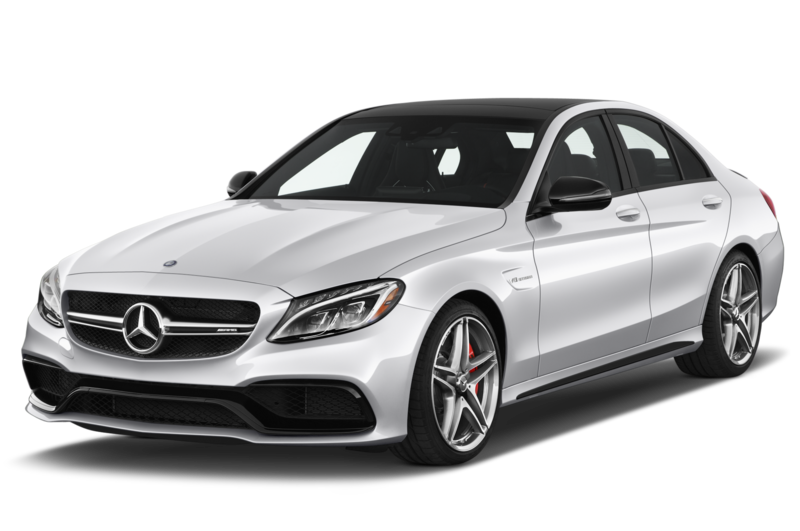 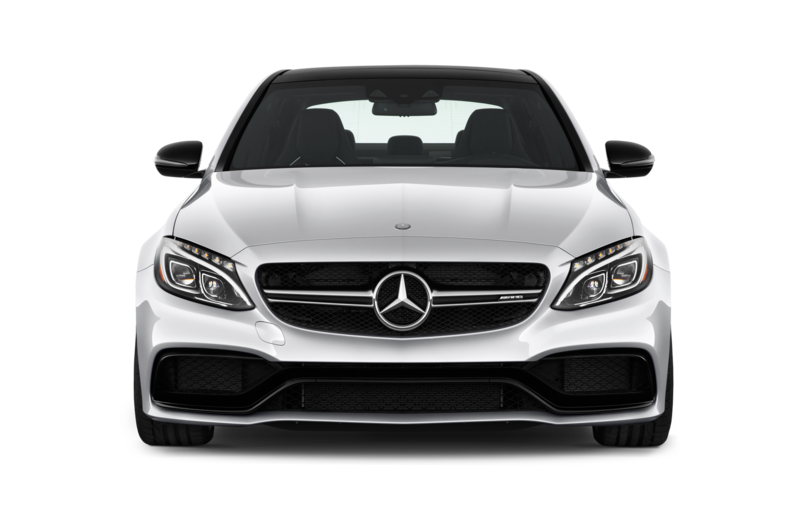 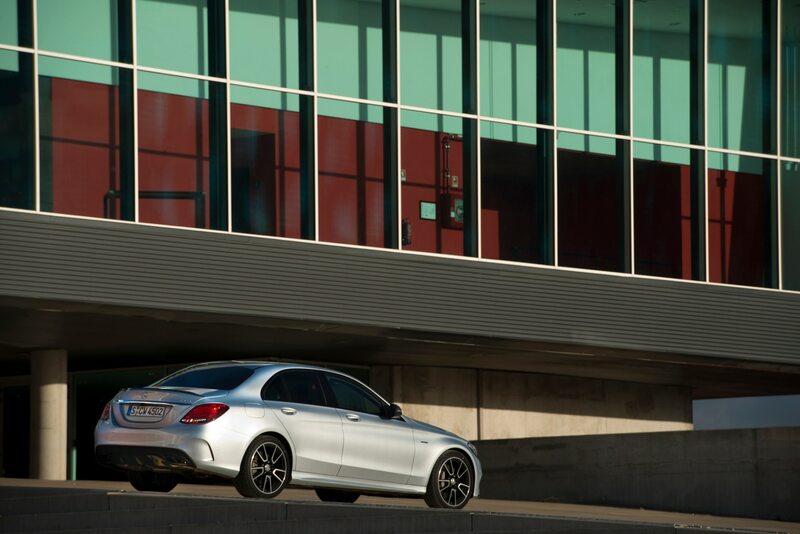 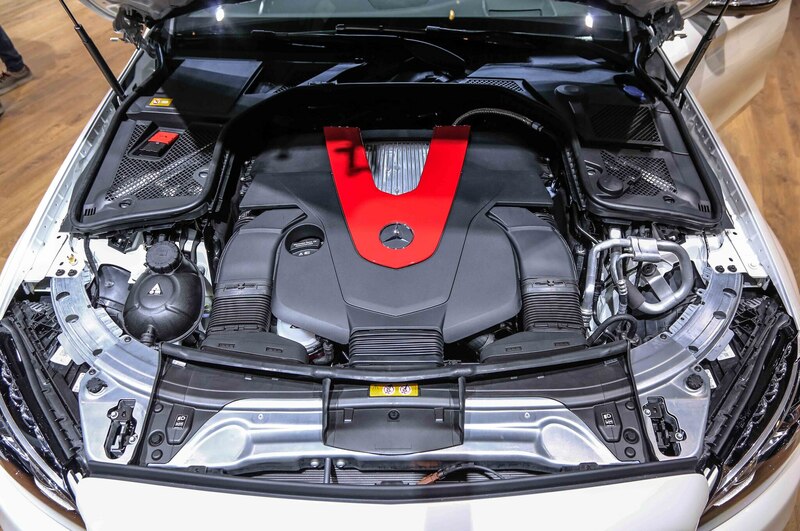 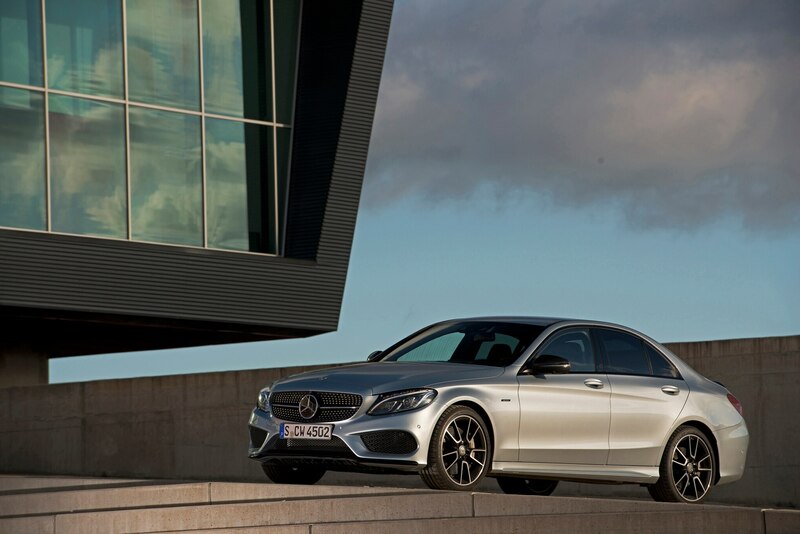 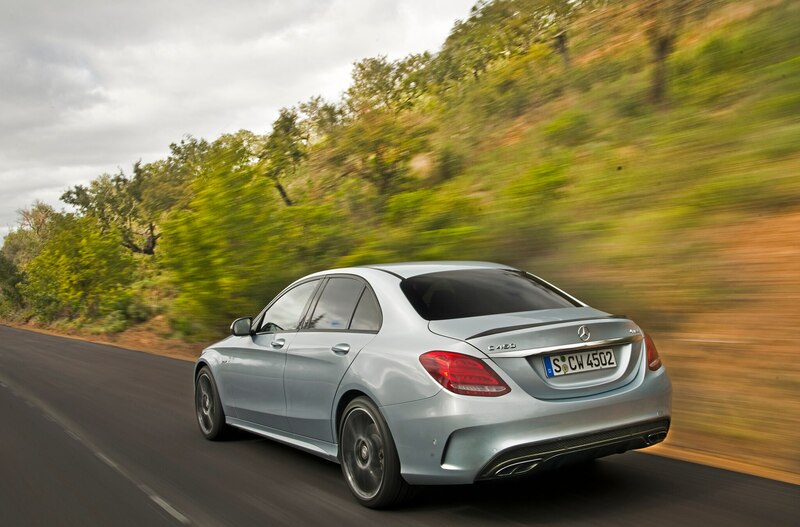 Plus, the standard C63 is more of a sleeper with its silver brake calipers and subtler, body-color exterior details. And it’s 10% cheaper. 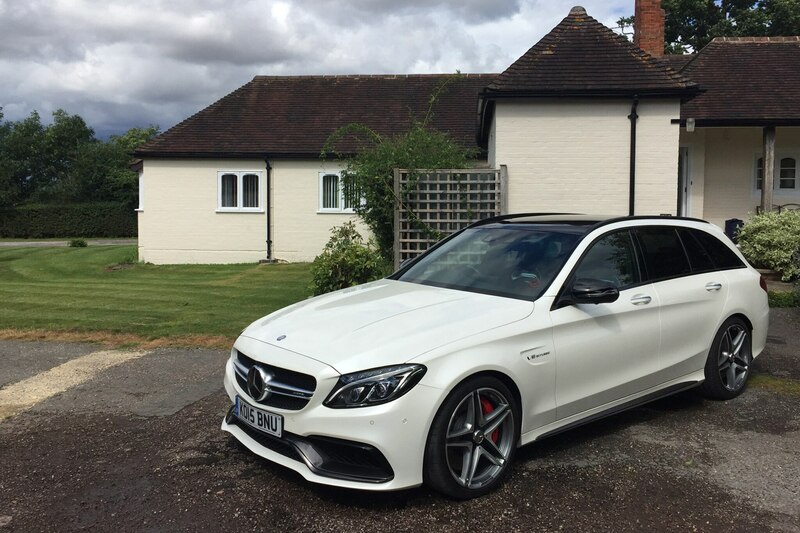 Speaking of money, the wagon versions of the two C63 models cost only 2% more than their sedan equivalents in the UK—a smoking deal. 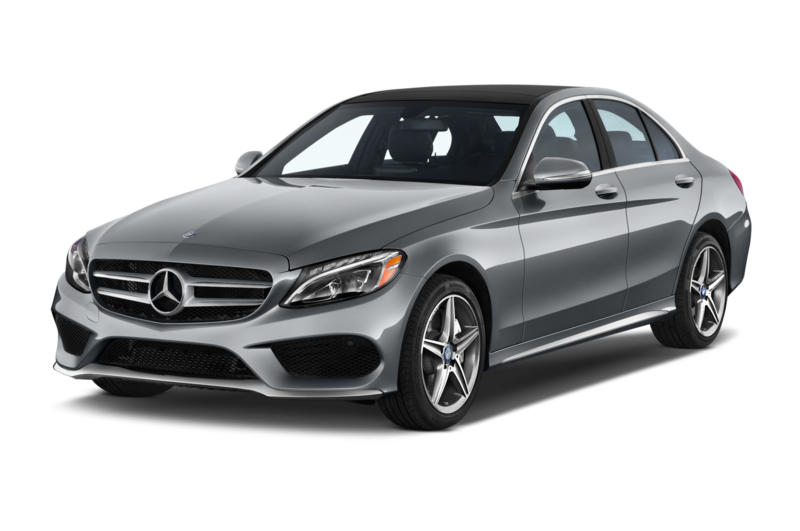 I can’t see the logic in buying the less-attractive and less-functional sedan, quite frankly. 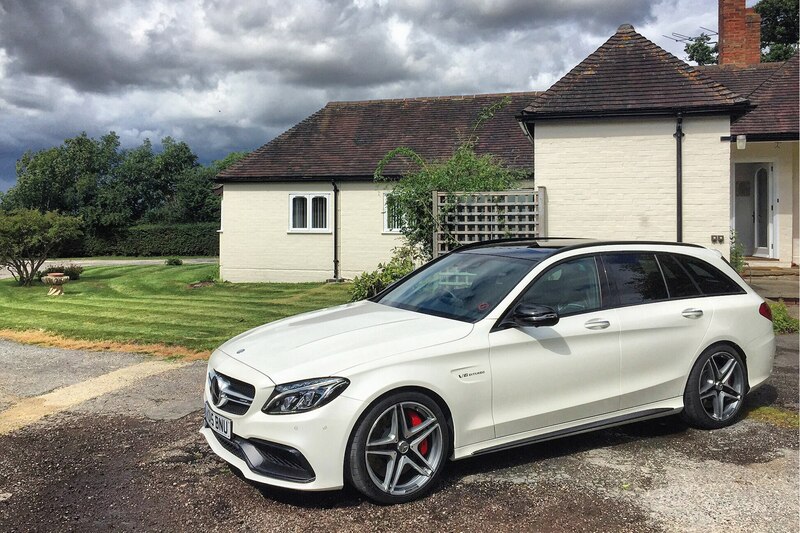 Pulling out a calculator reveals that the Mercedes-AMG C63 Wagon would start at roughly $67,500 if it ever came to the USA, with the top-spec “S” version $75,500. 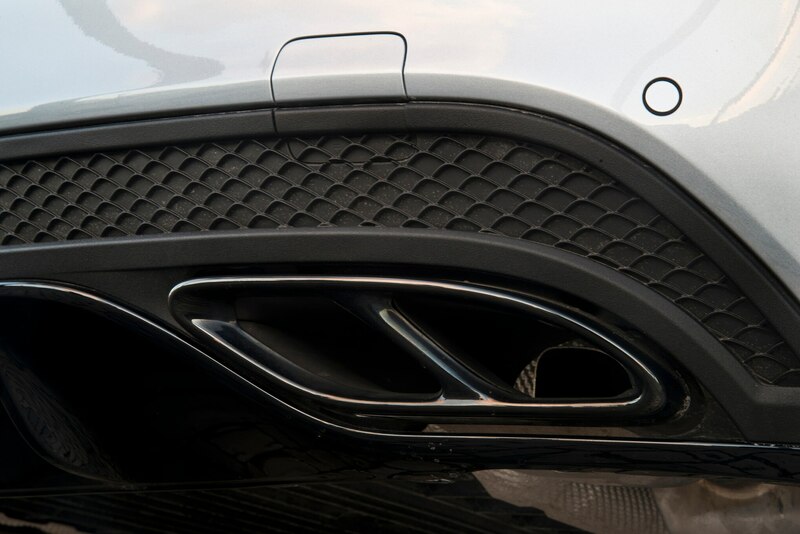 But don’t hold your breath. 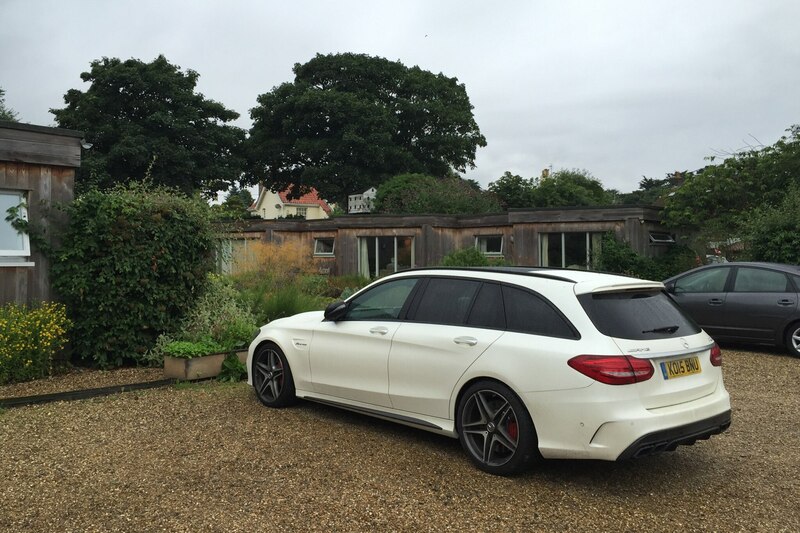 Despite the fact that the go-fast AMG wagon ticks the boxes for nearly everything I’m looking for in an everyday, useable performance automobile, the majority of the buyers in our great country would rather have an AMG version of a Mercedes crossover or a lemming-like SUV over at the Porsche or BMW dealership. 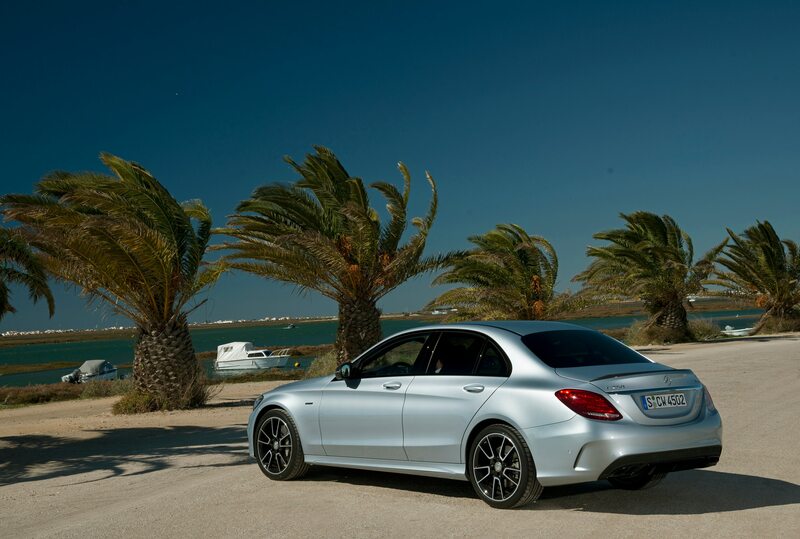 They don’t know what they’re missing. 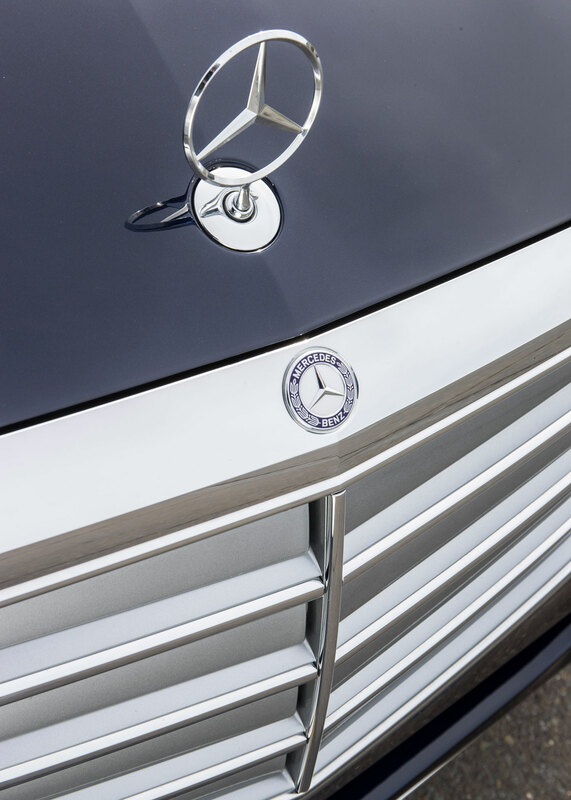 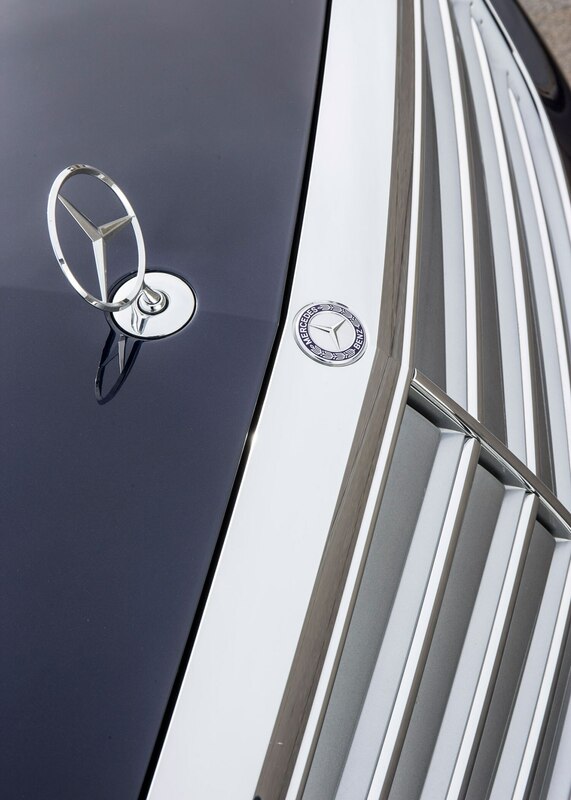 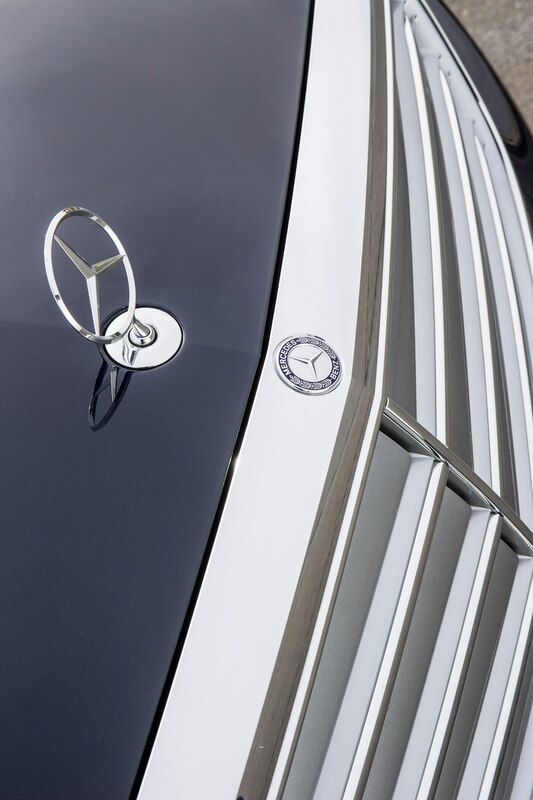 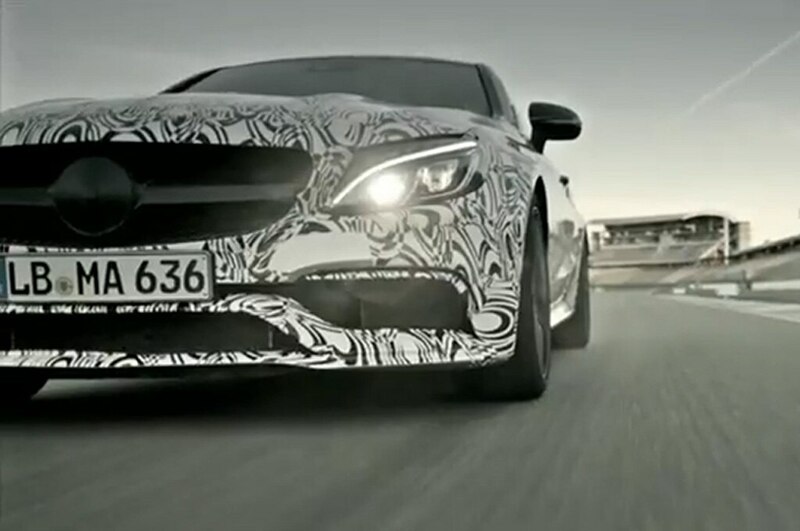 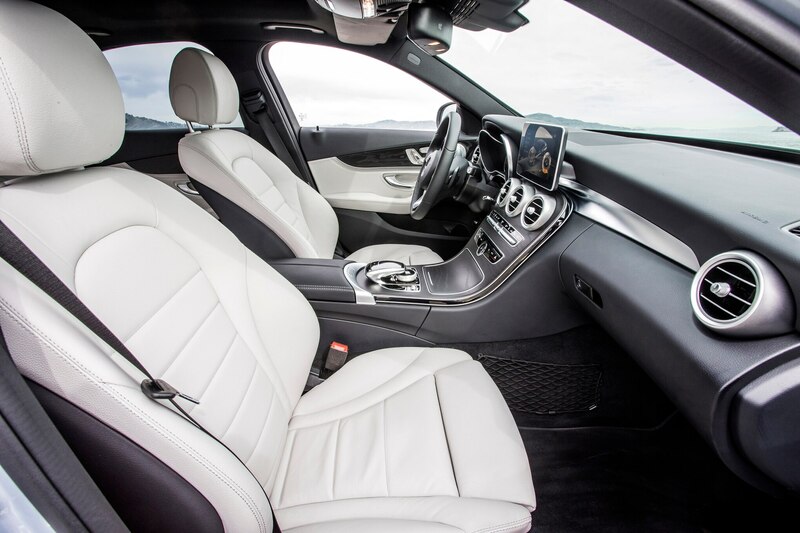 AMG leader talks about his brand and its ongoing expansion. 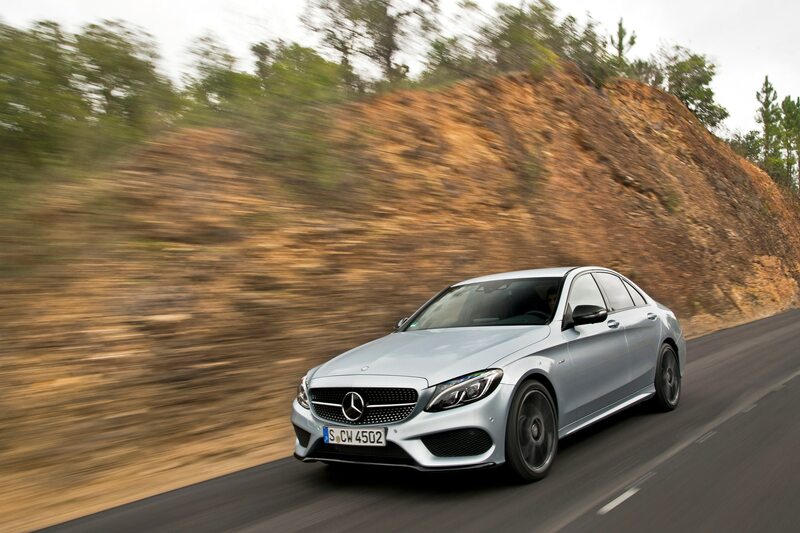 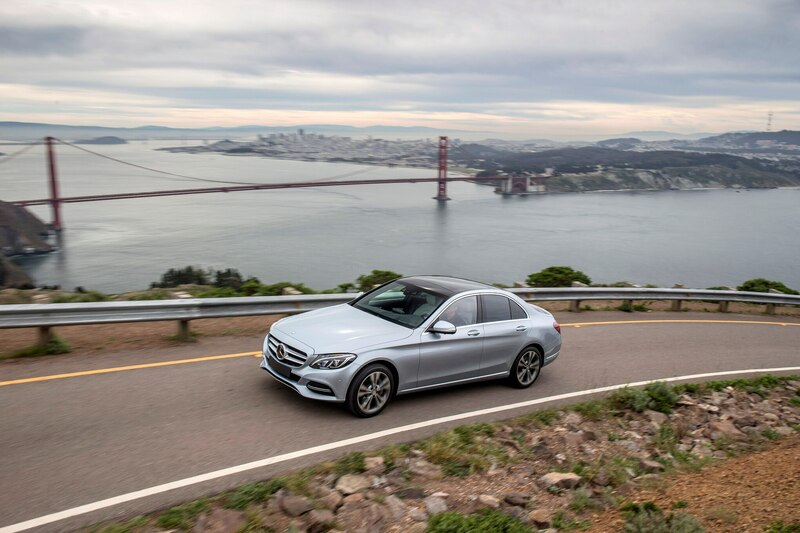 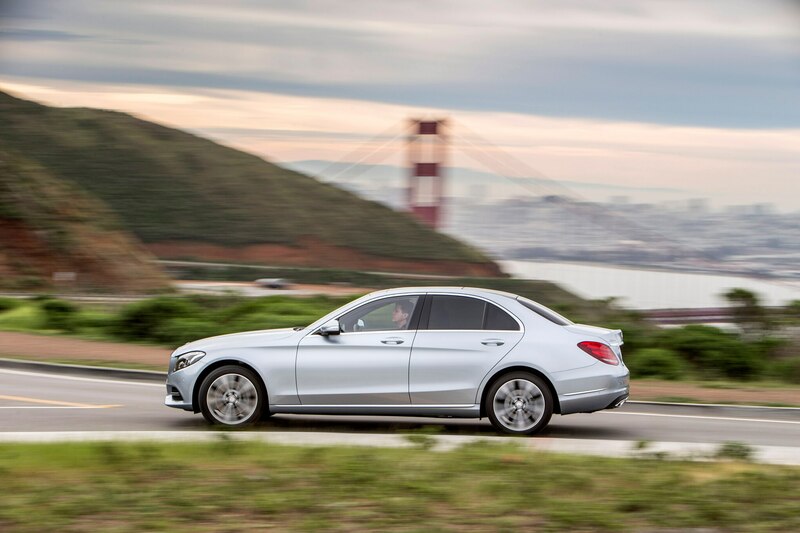 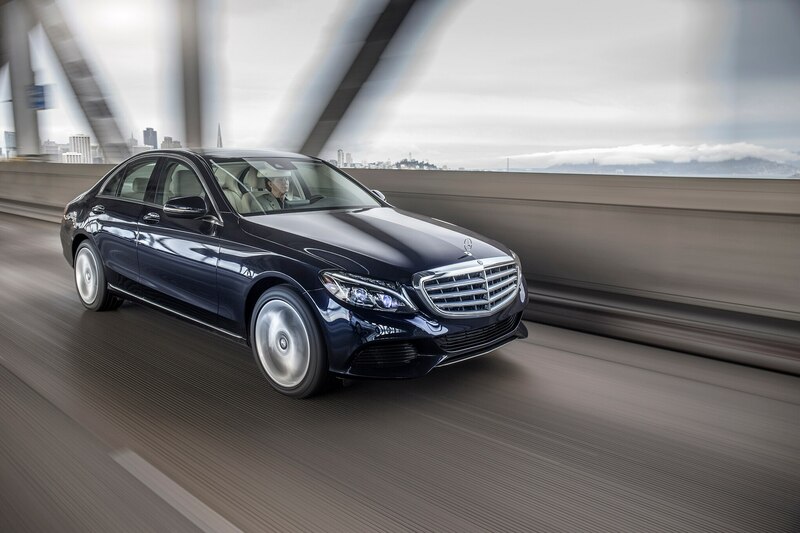 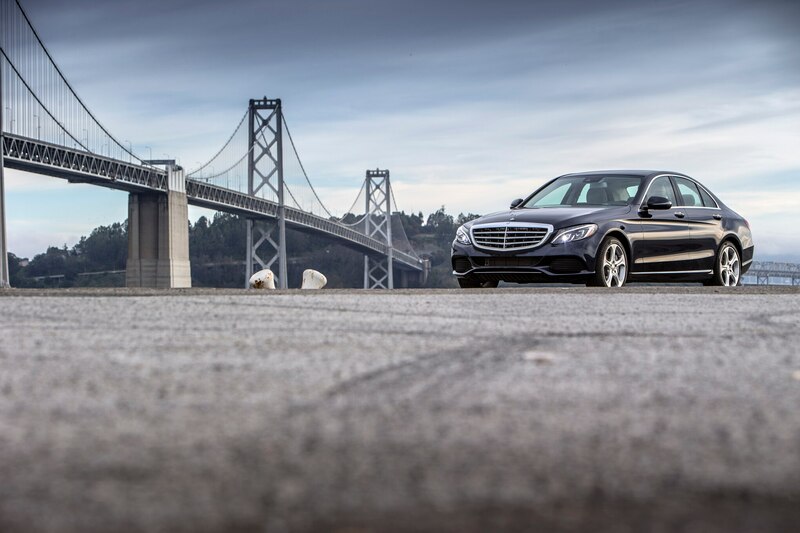 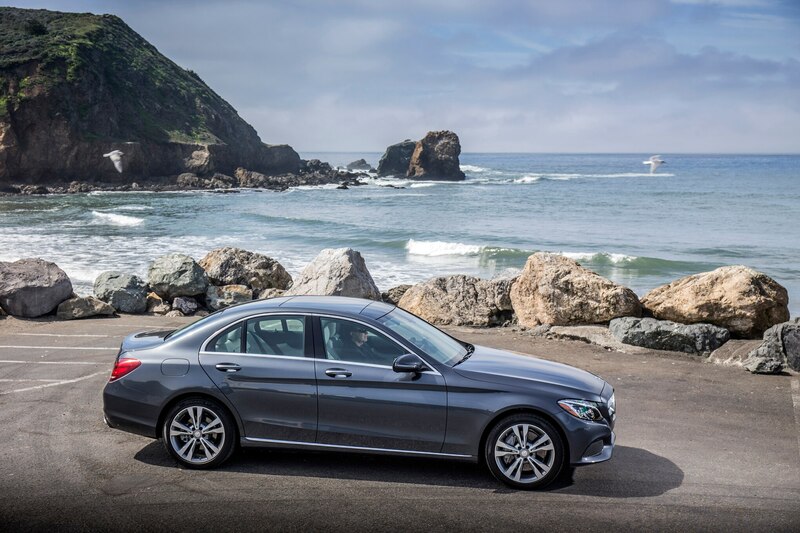 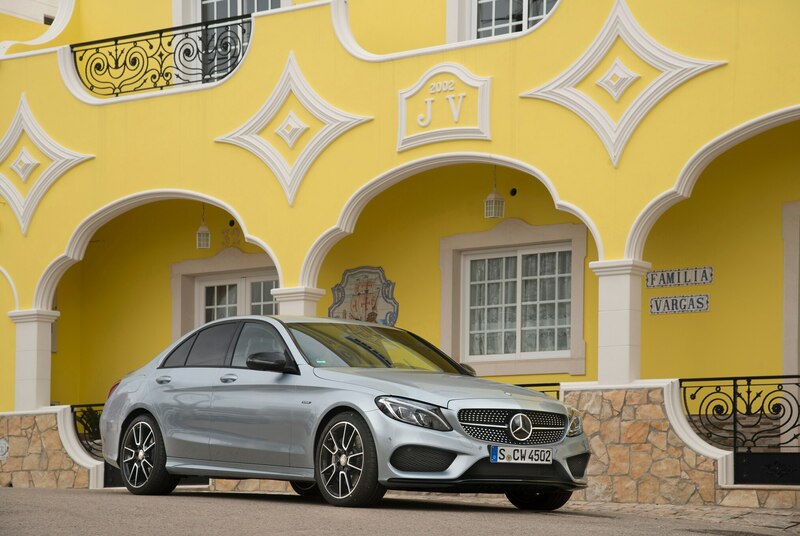 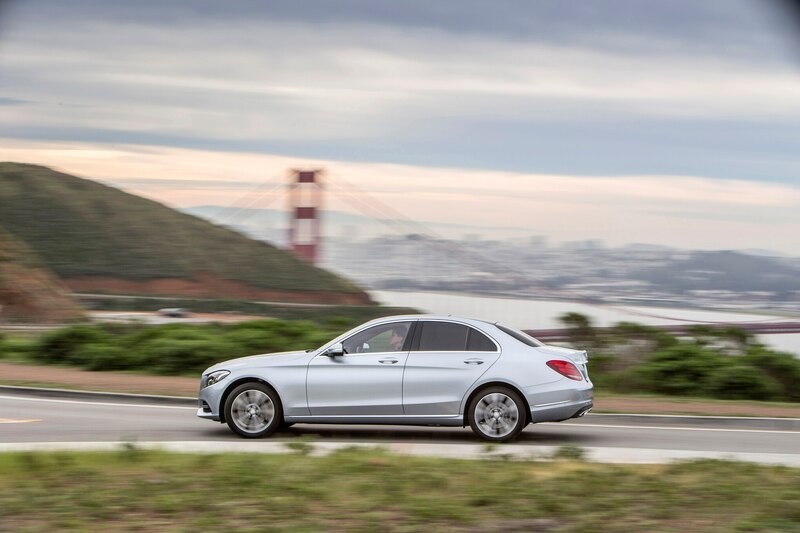 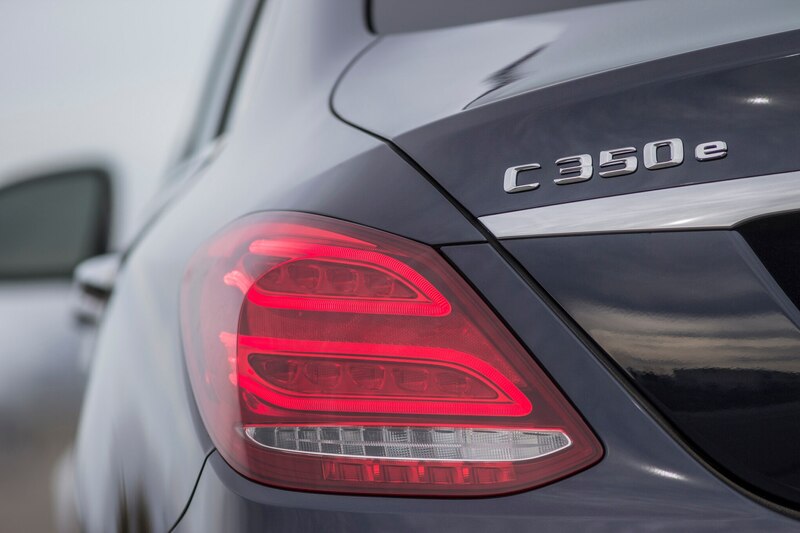 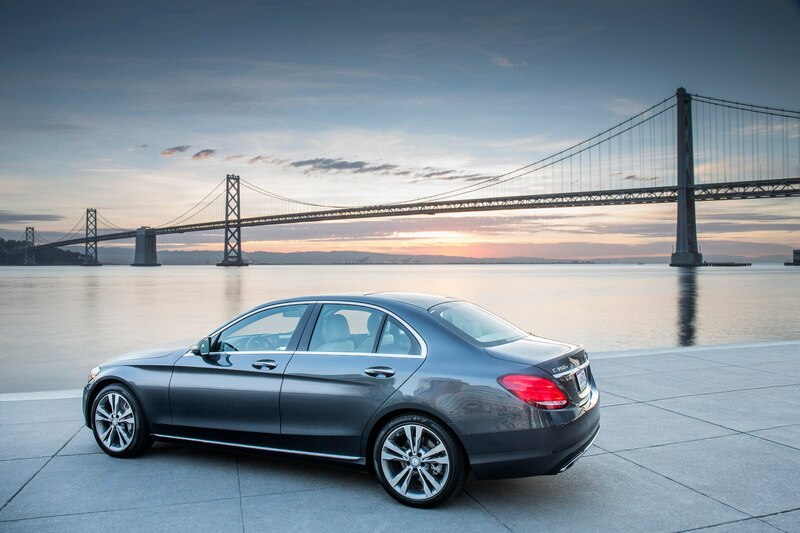 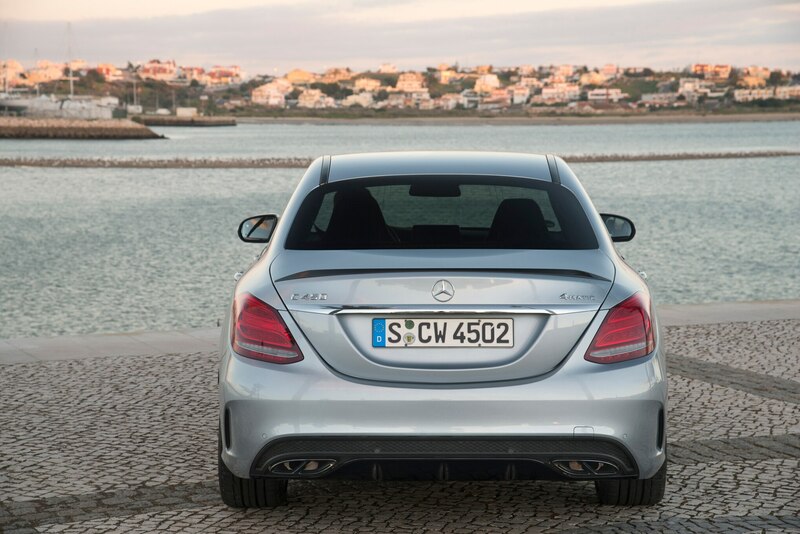 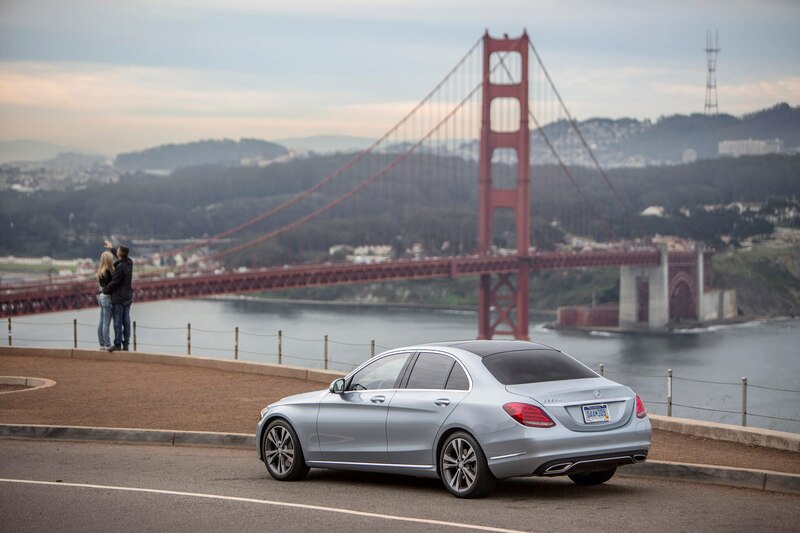 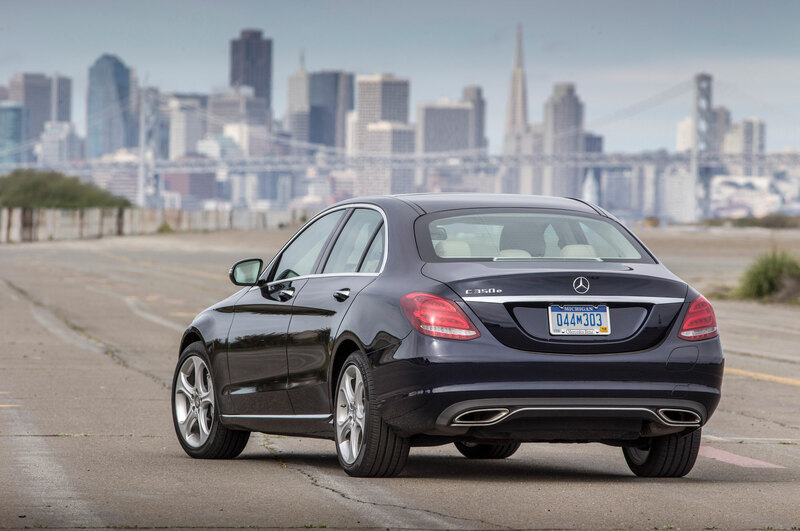 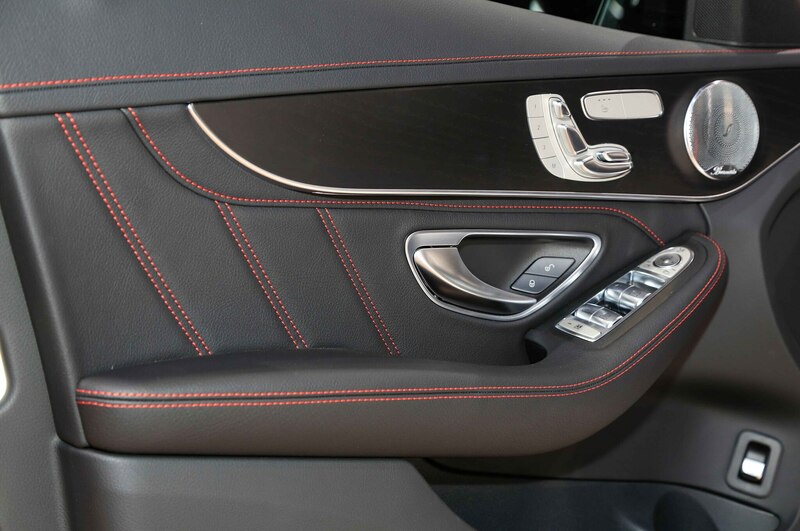 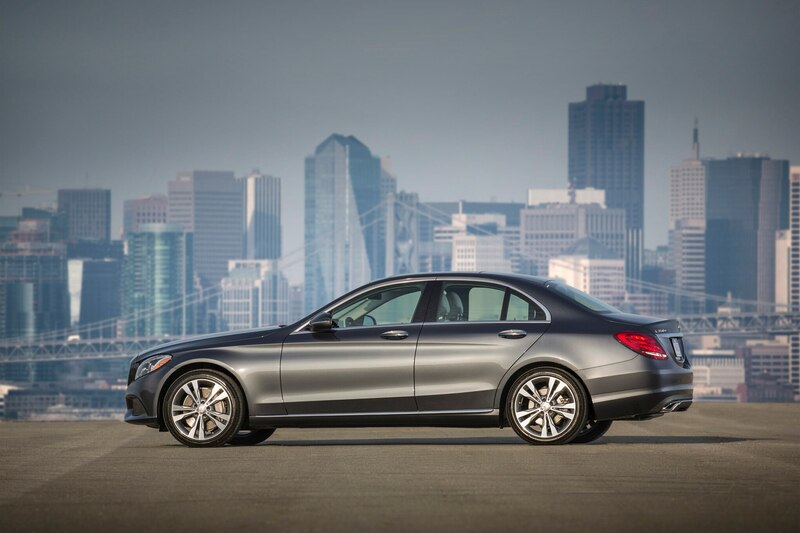 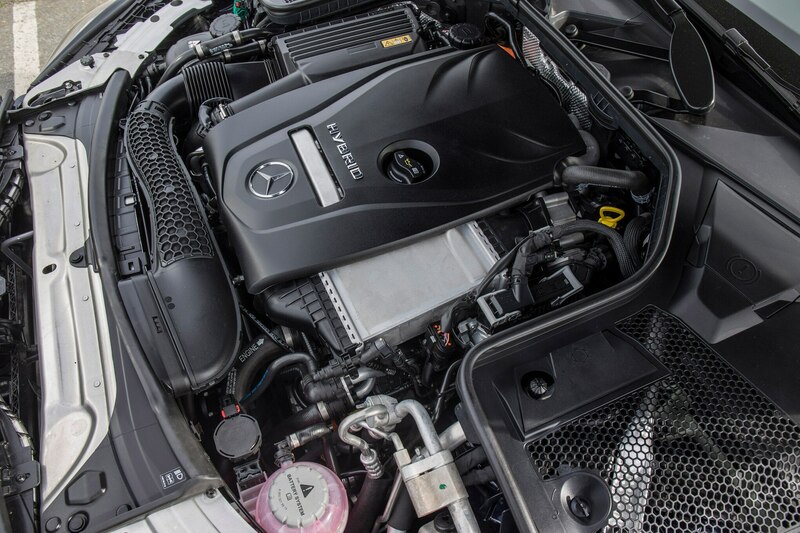 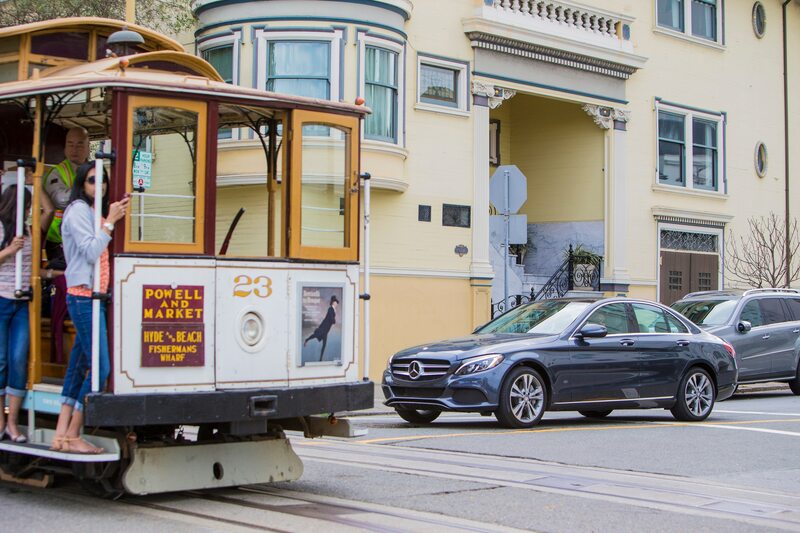 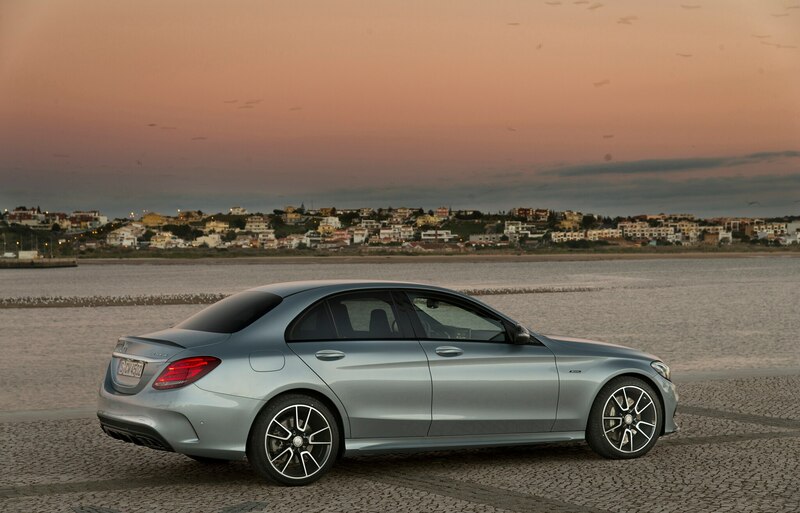 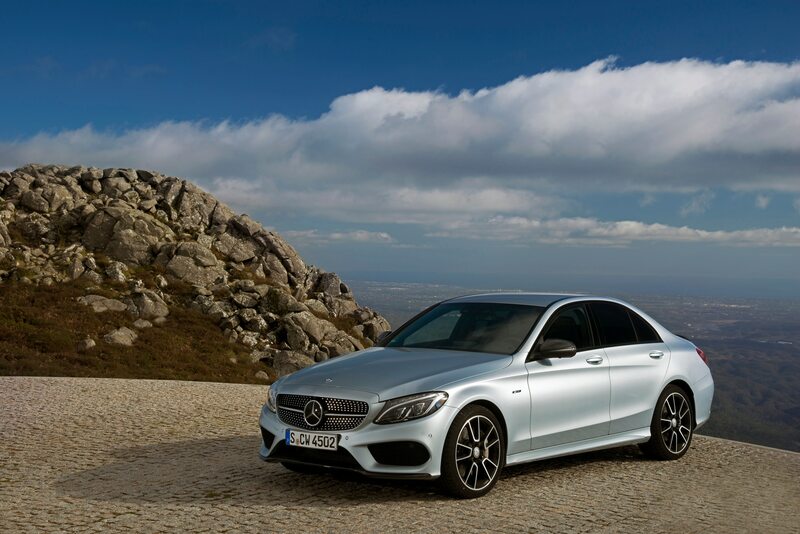 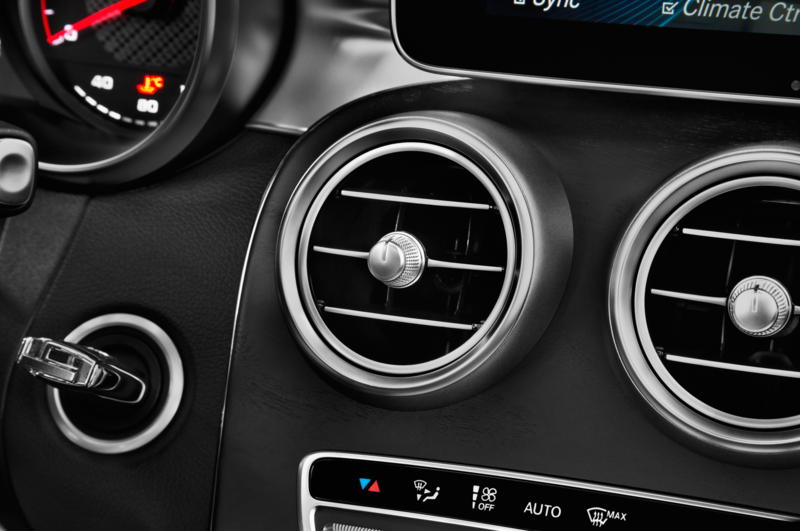 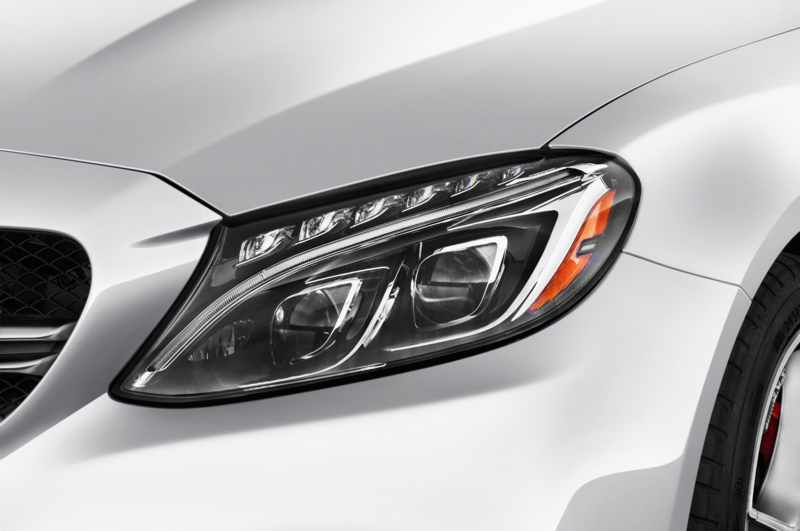 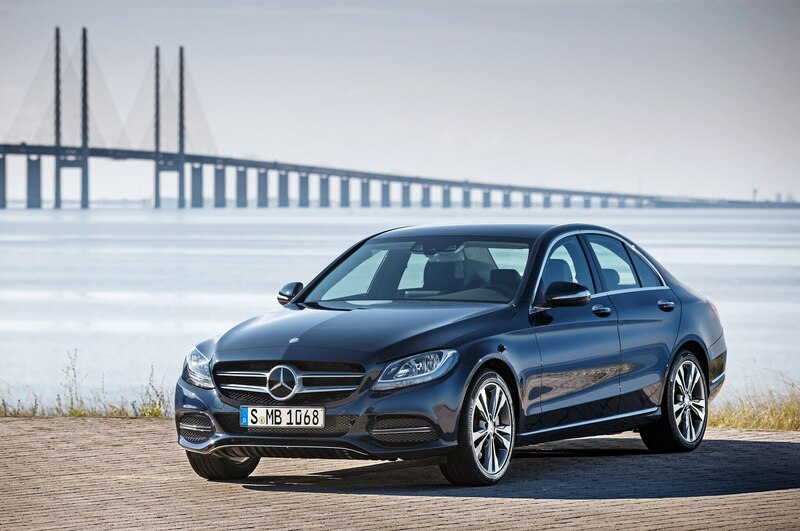 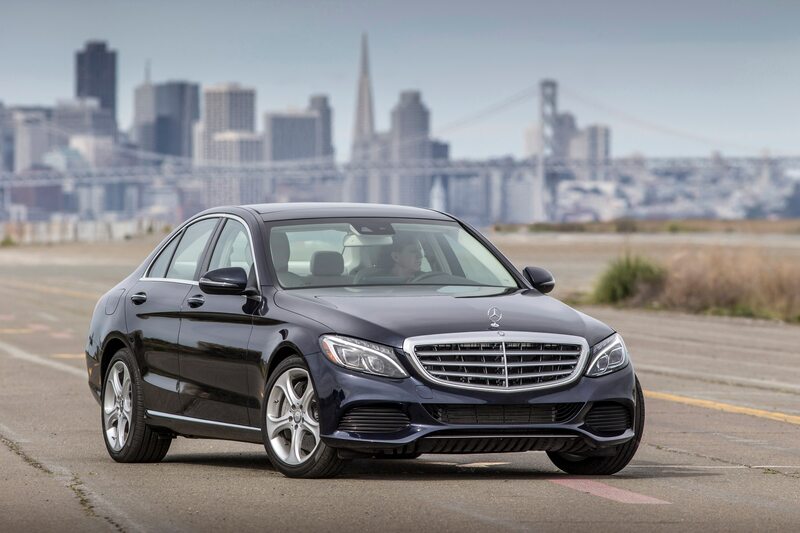 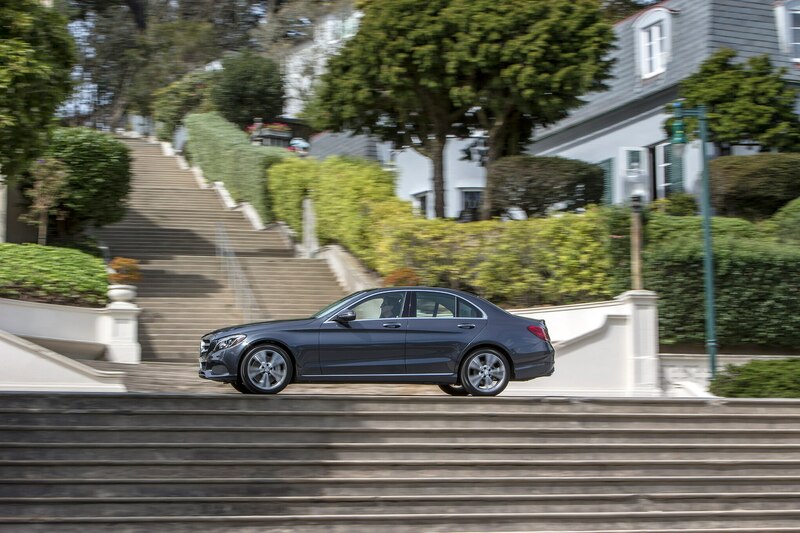 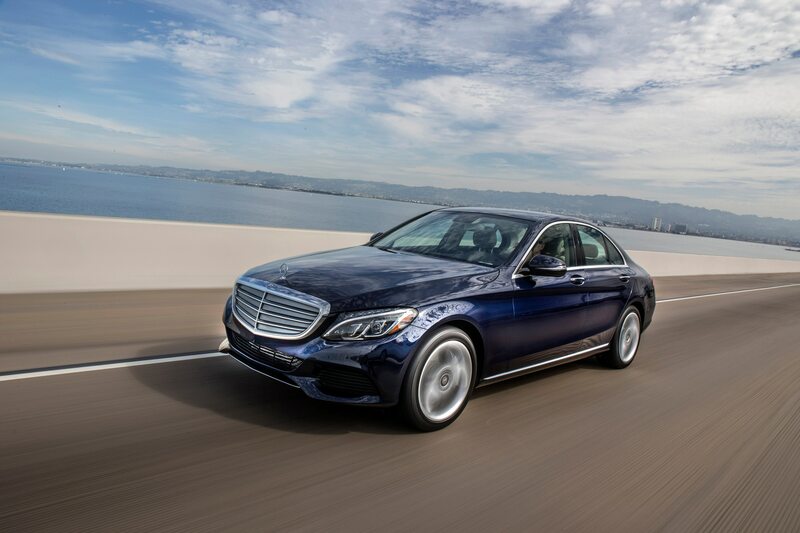 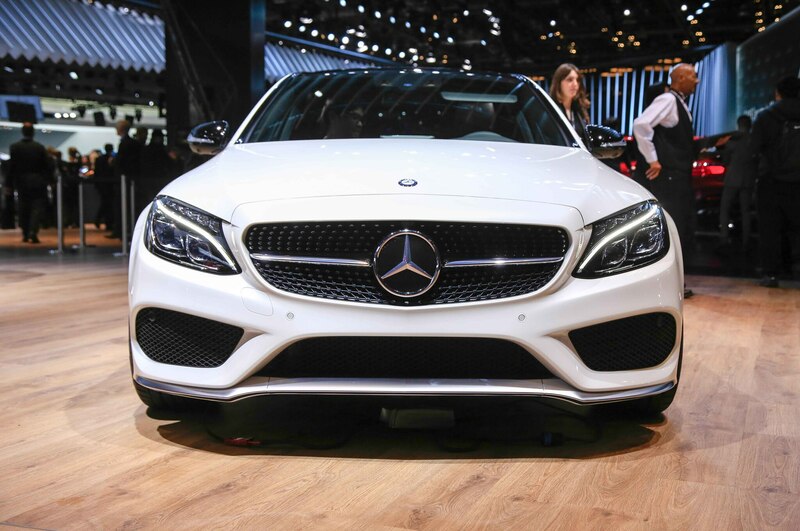 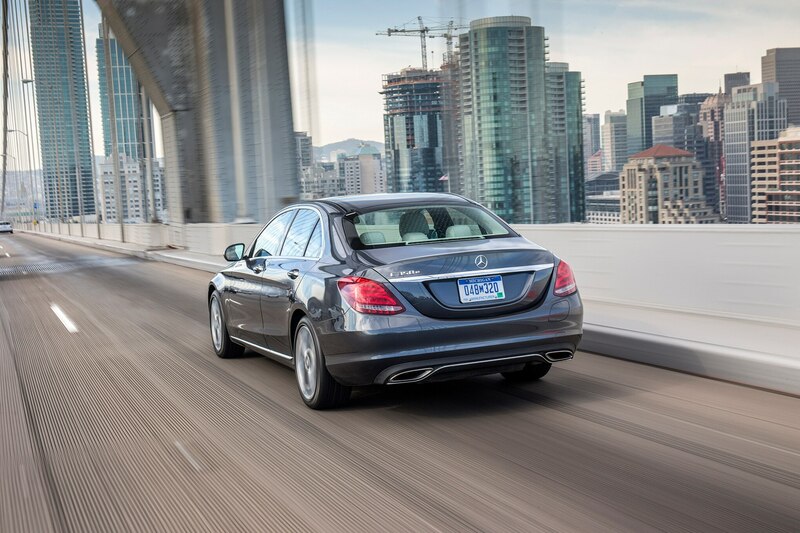 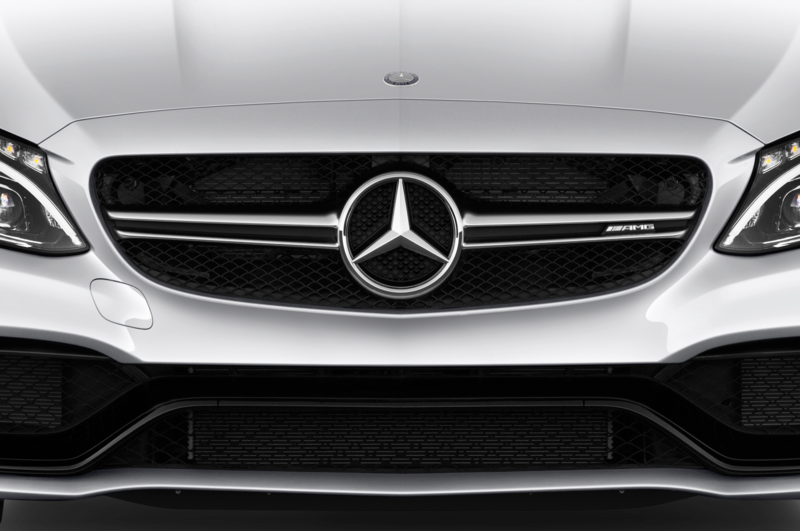 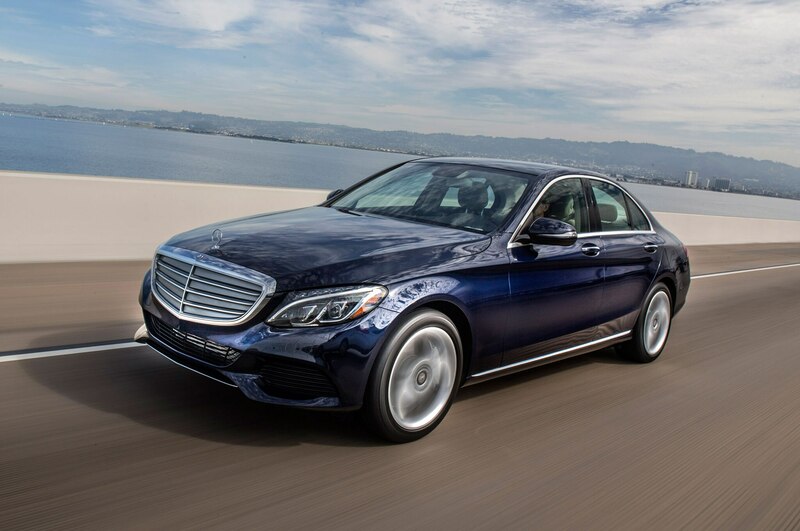 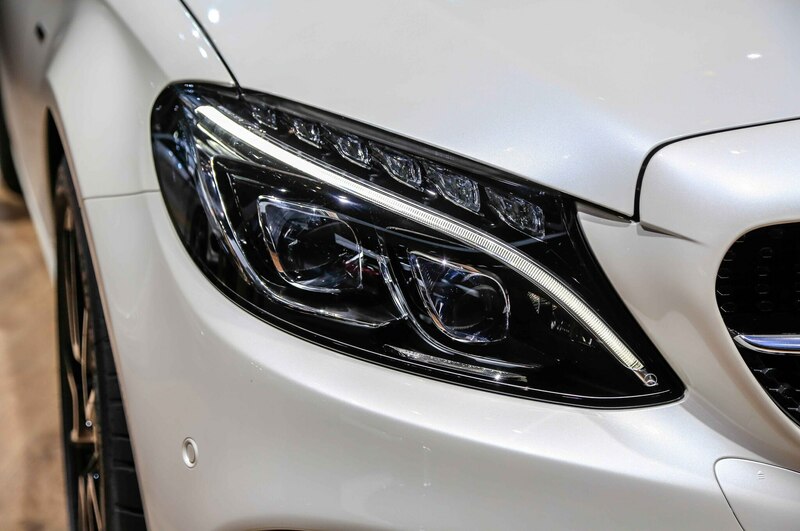 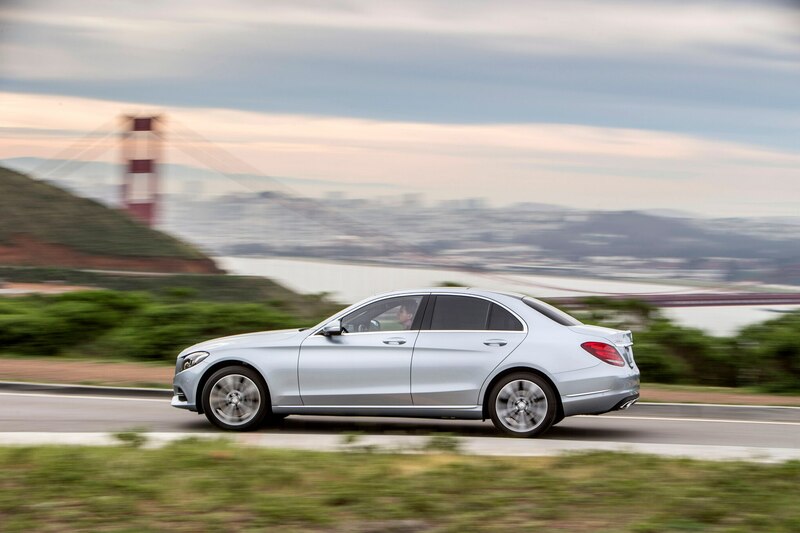 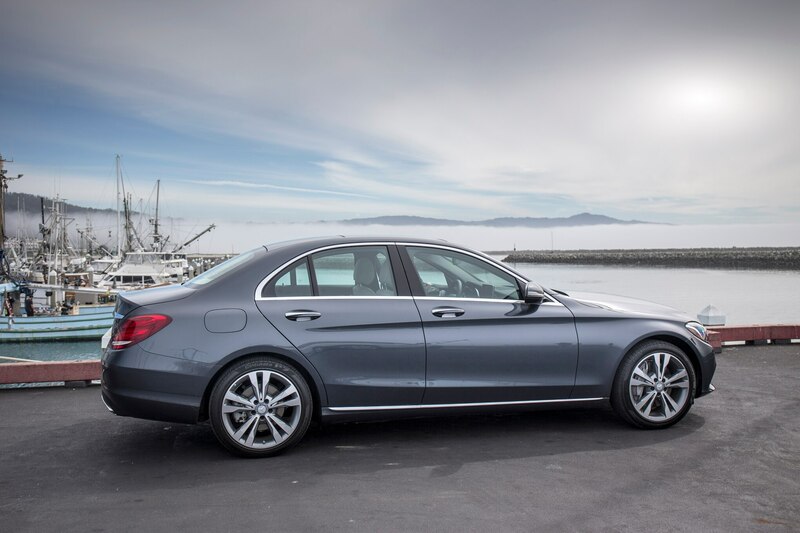 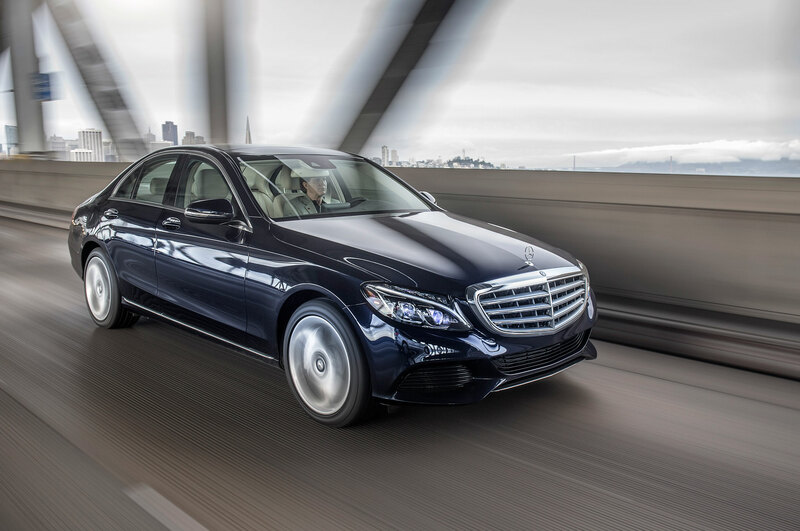 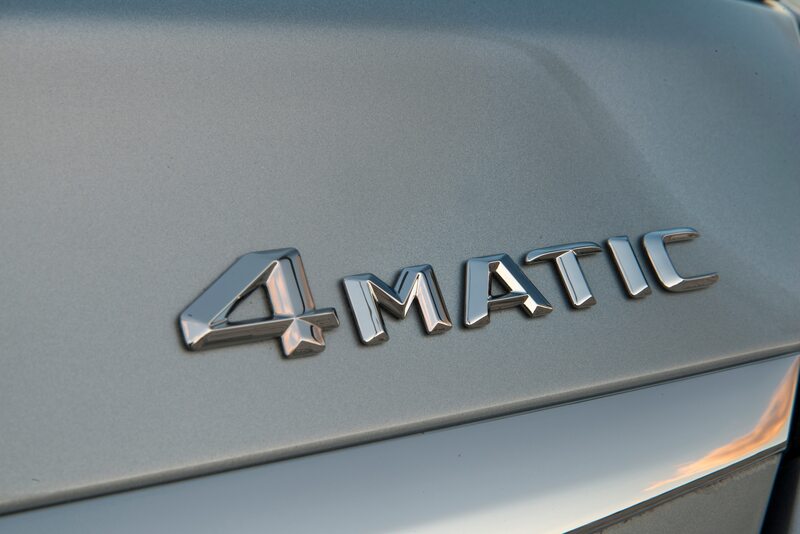 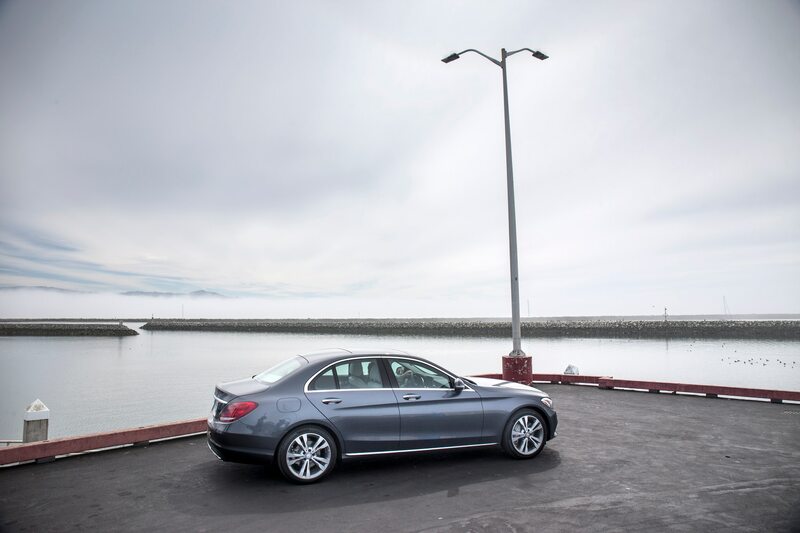 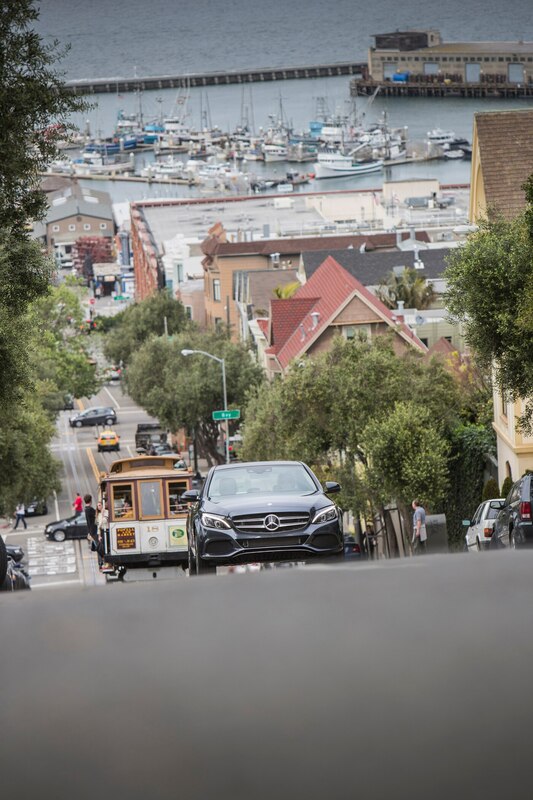 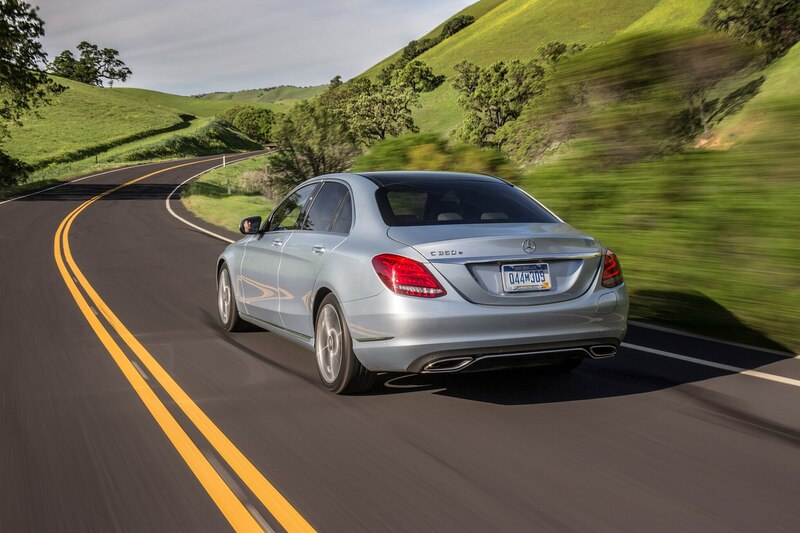 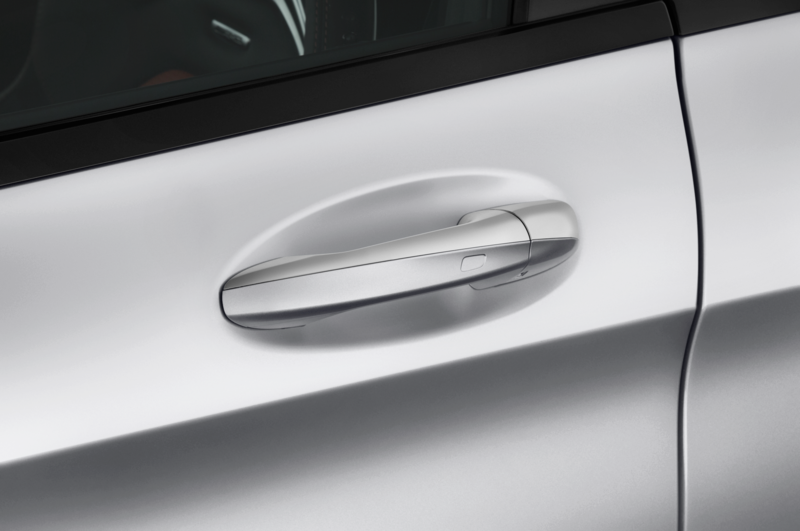 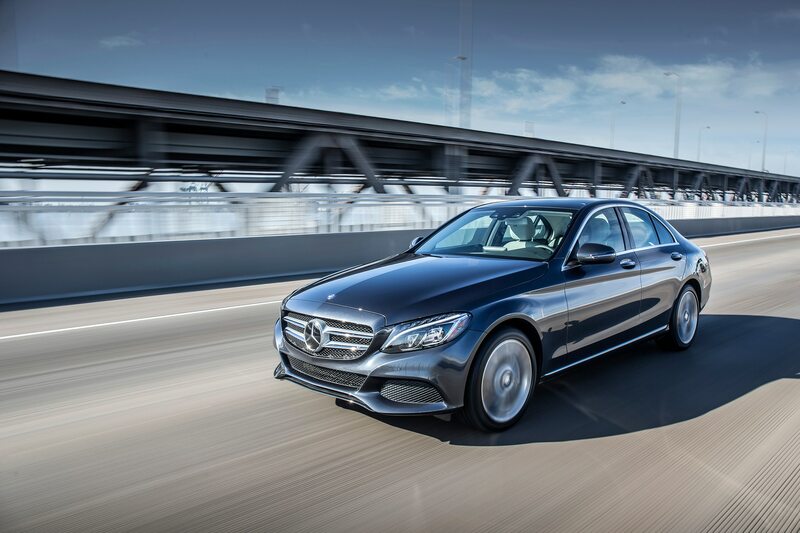 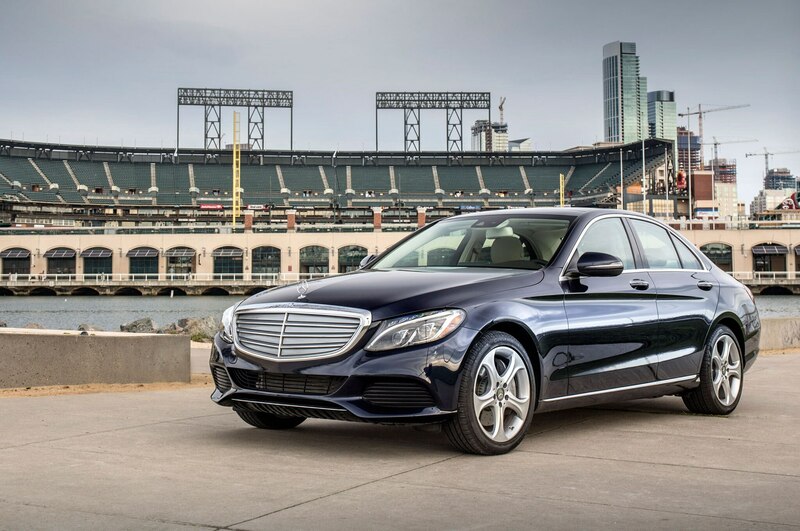 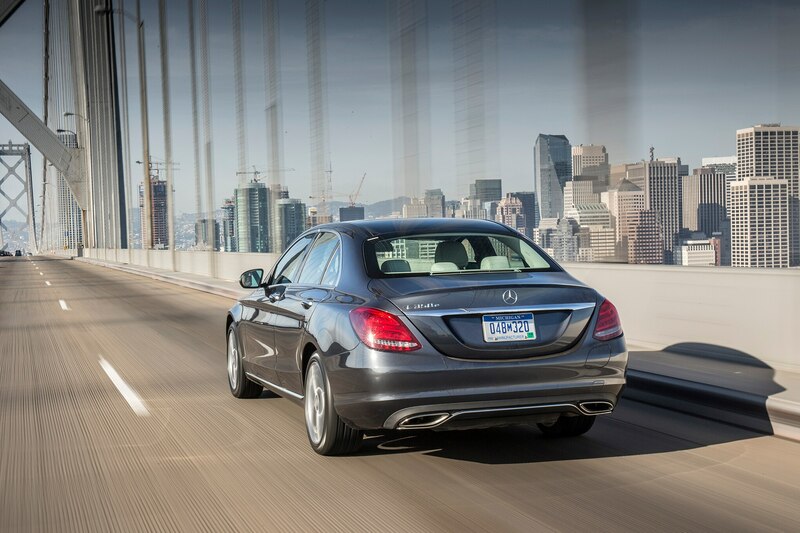 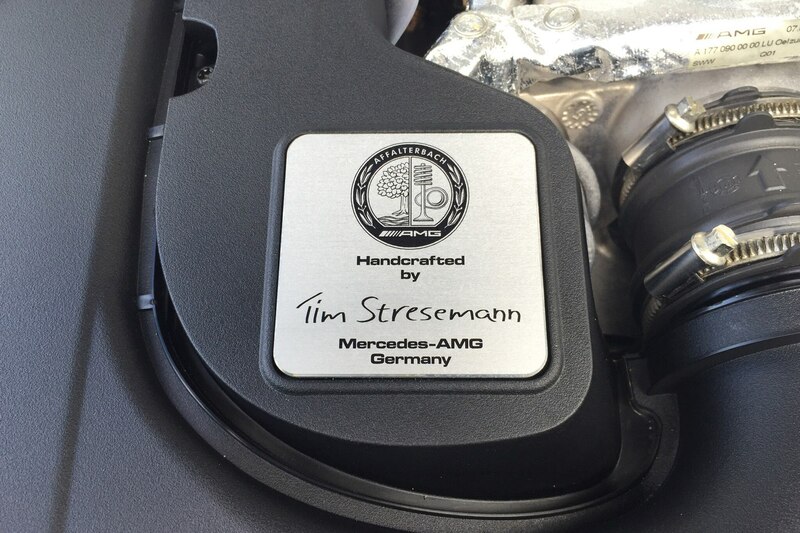 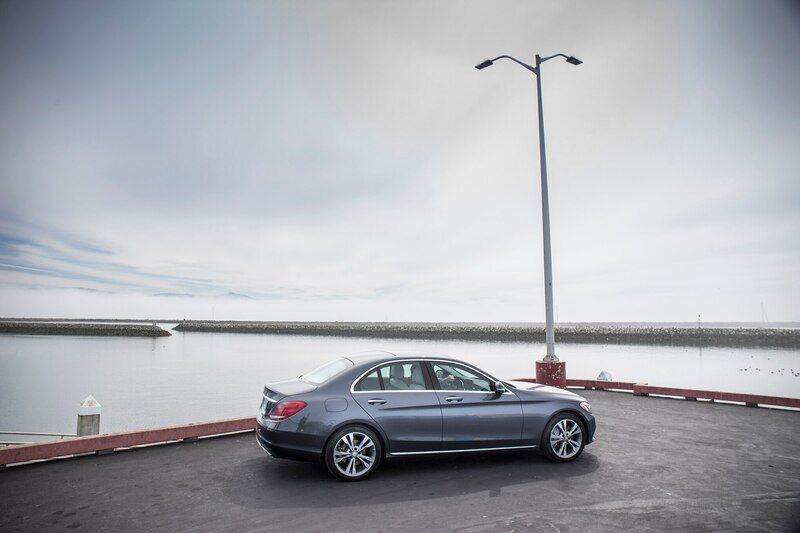 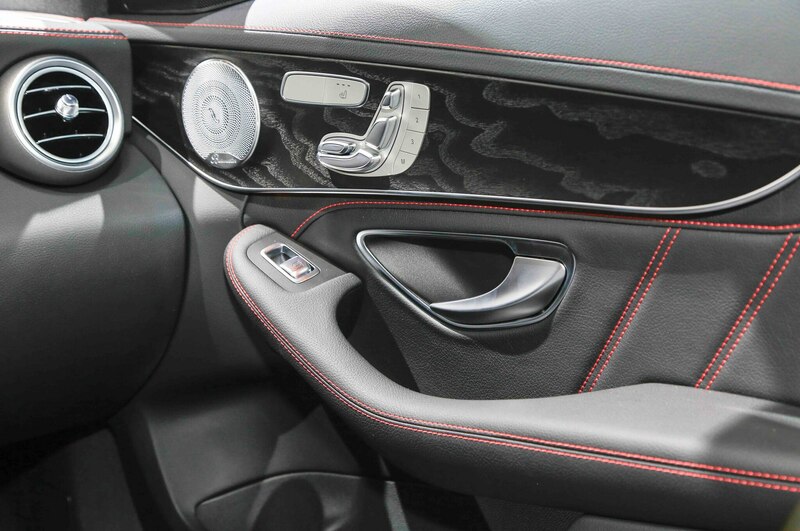 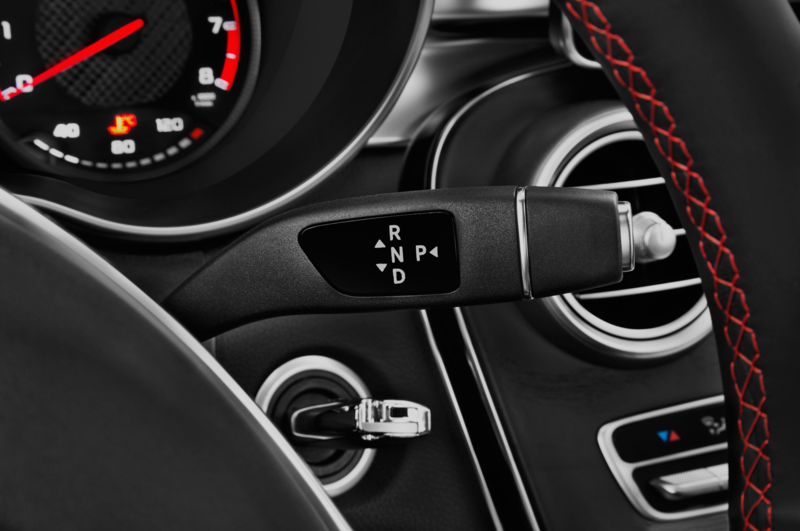 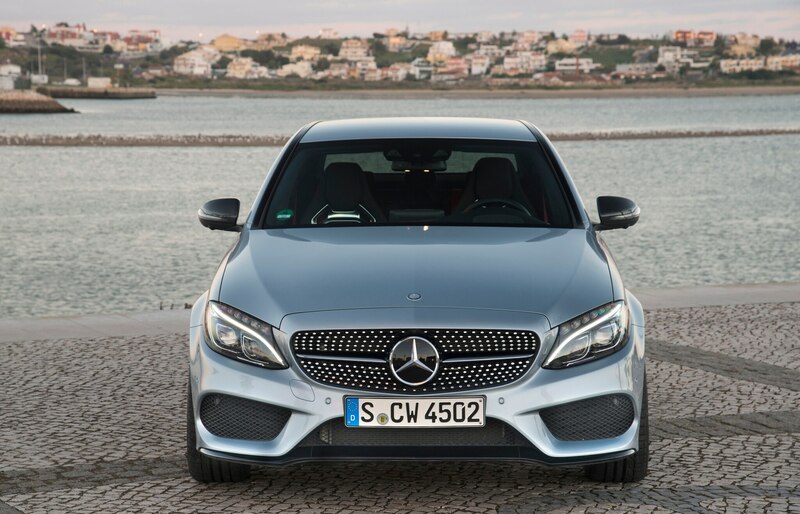 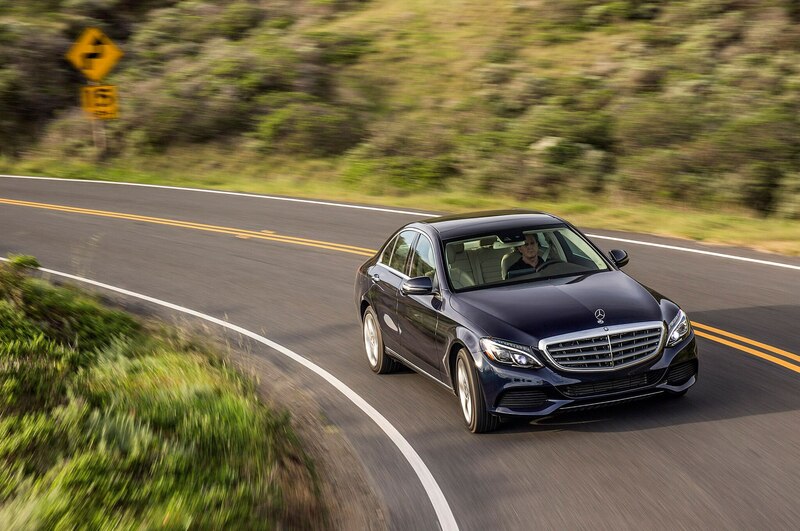 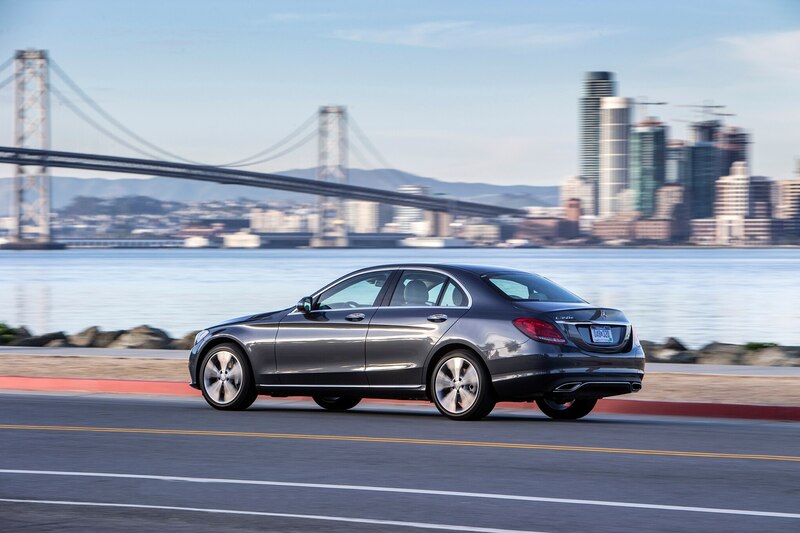 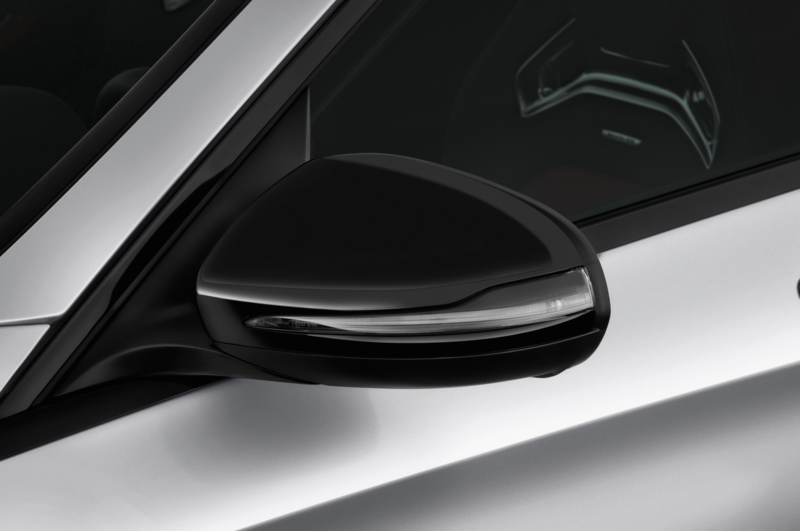 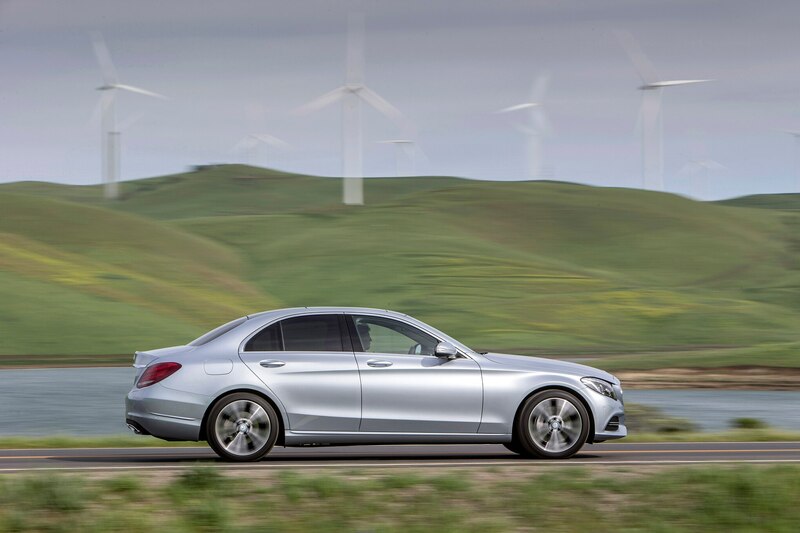 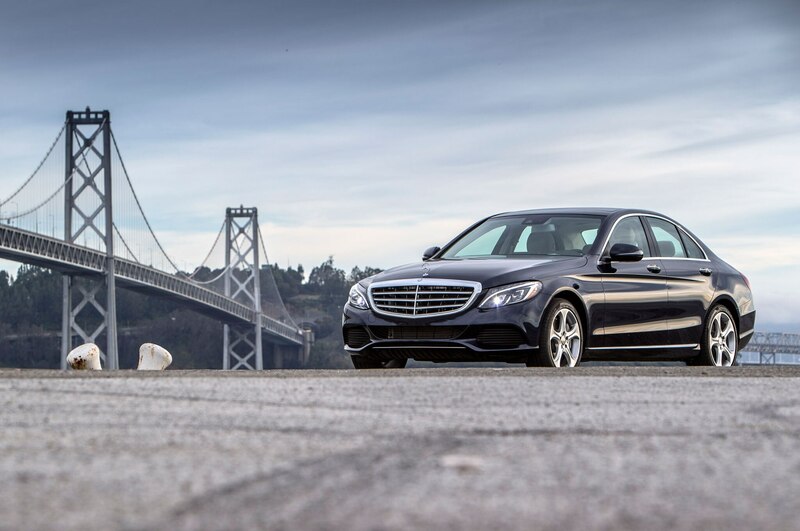 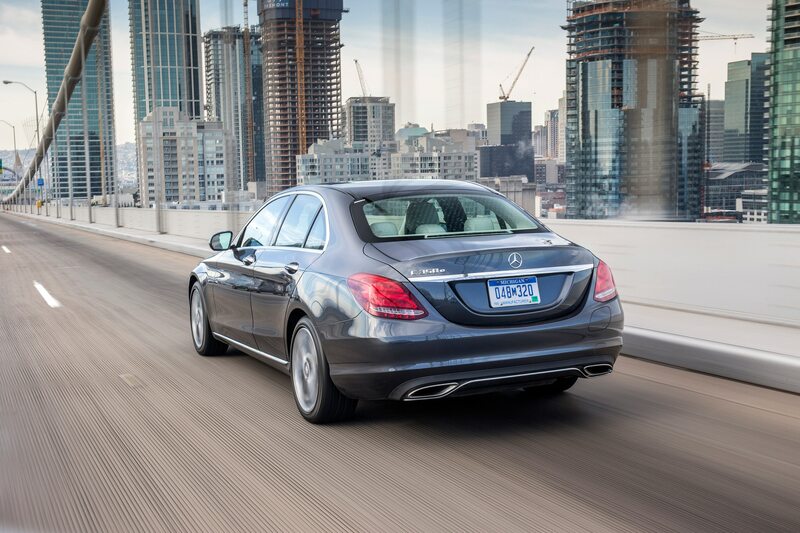 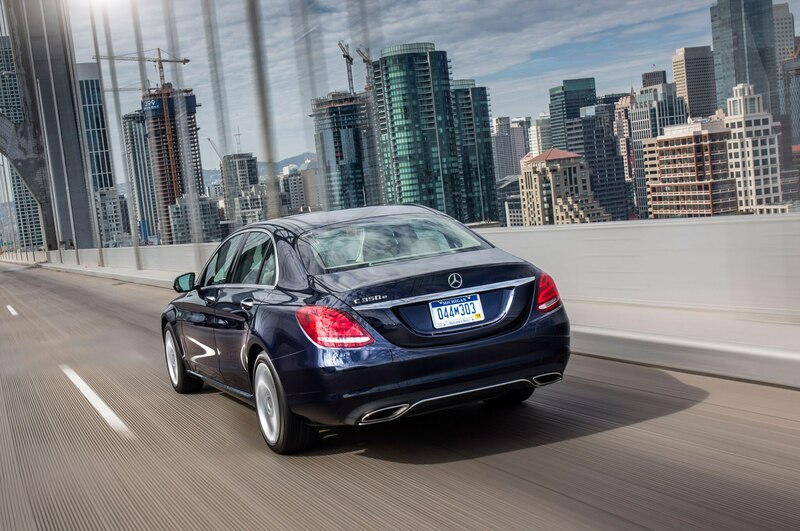 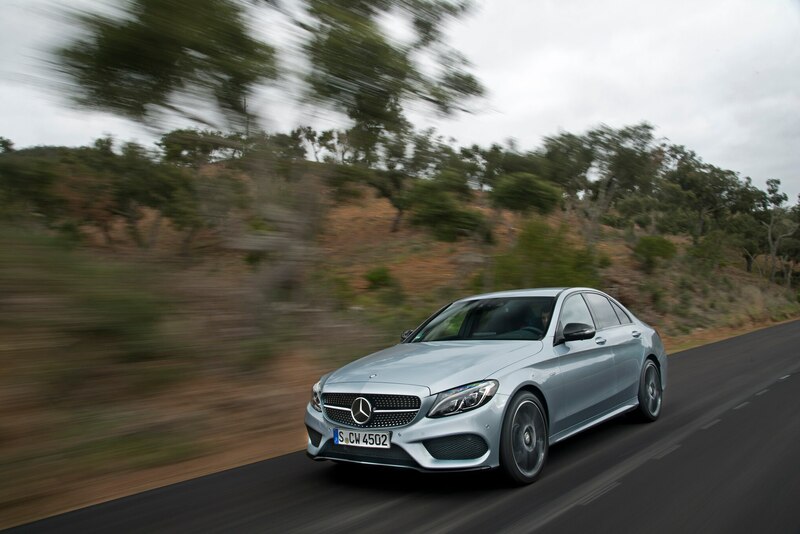 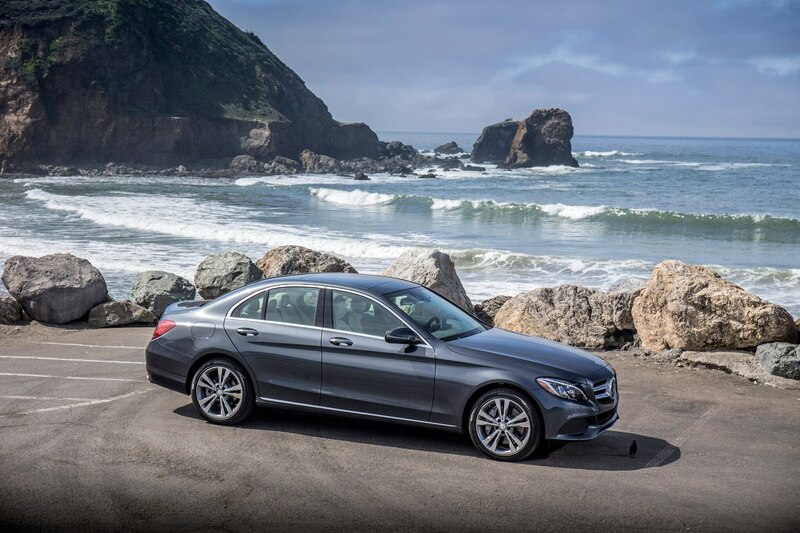 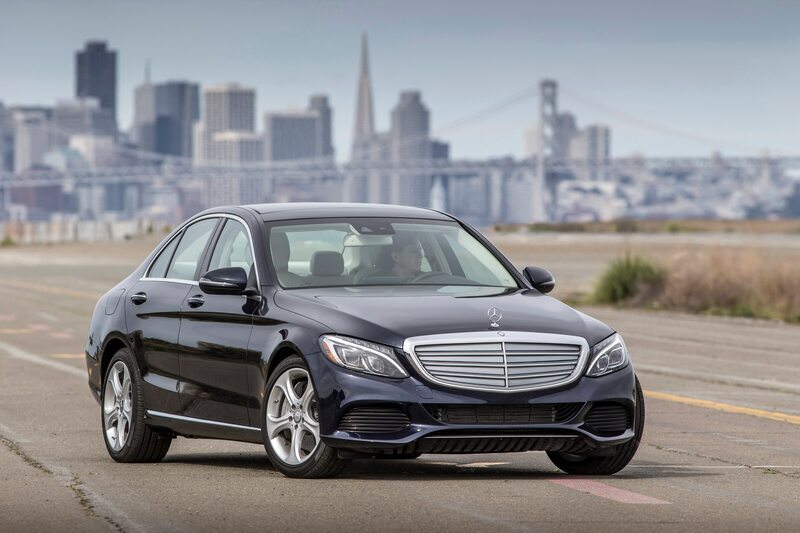 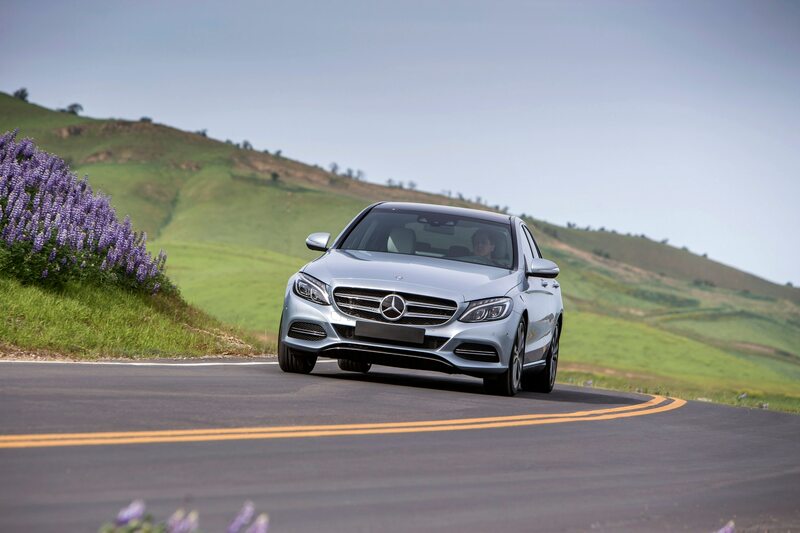 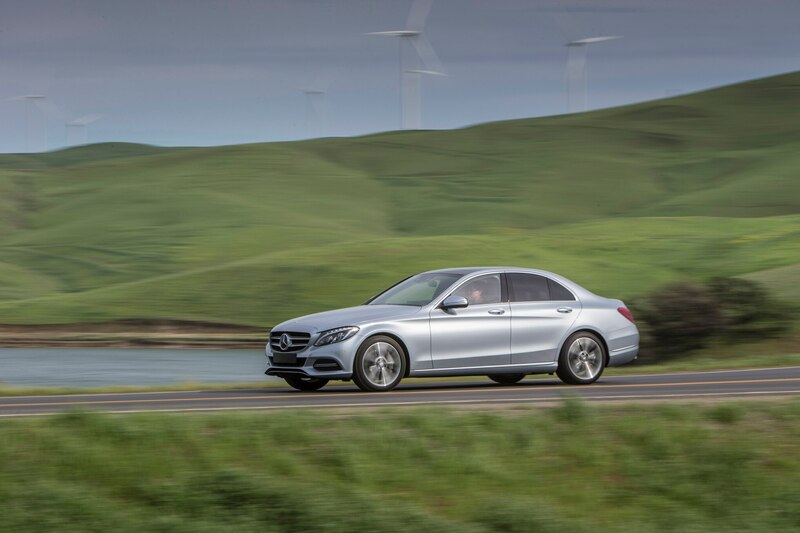 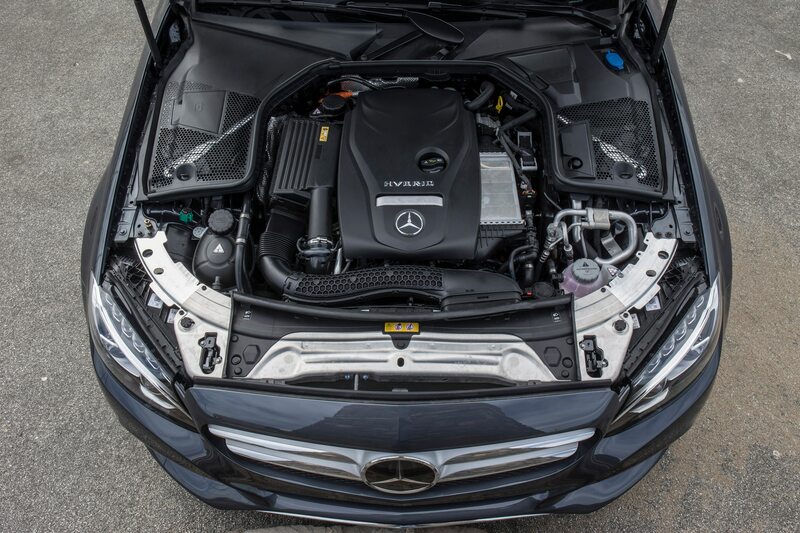 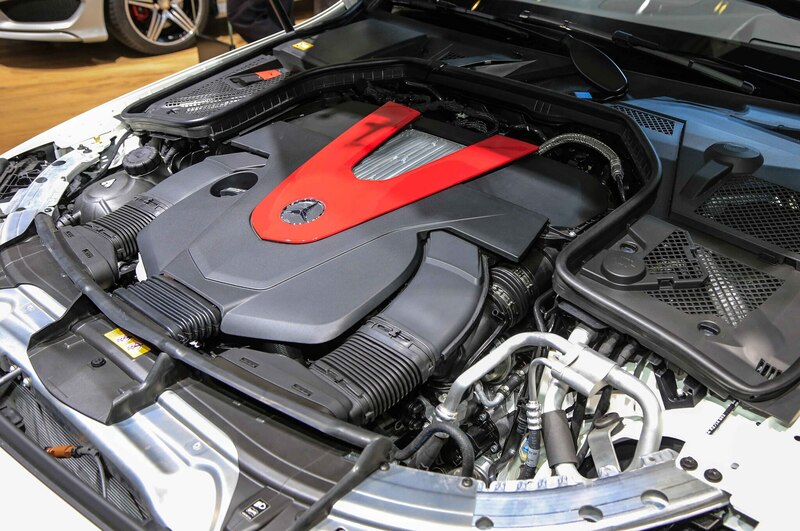 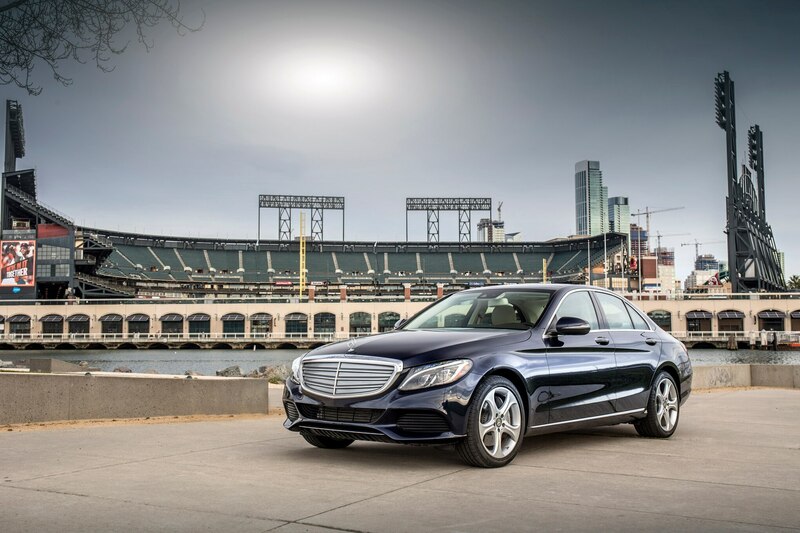 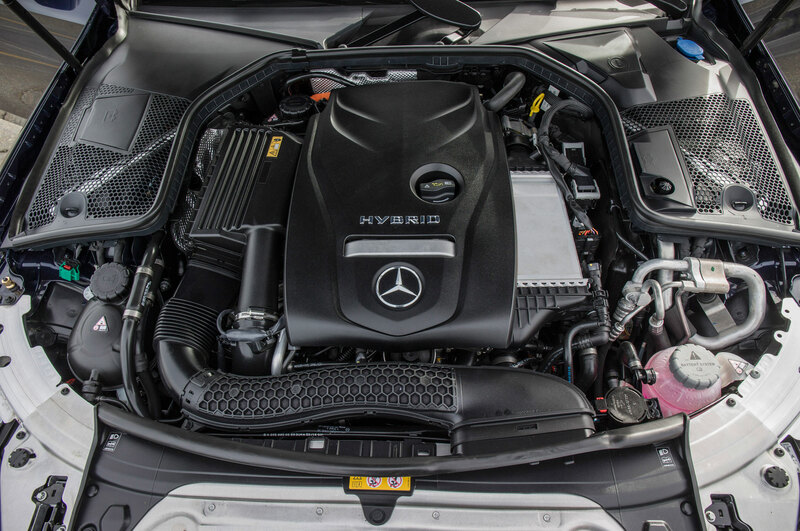 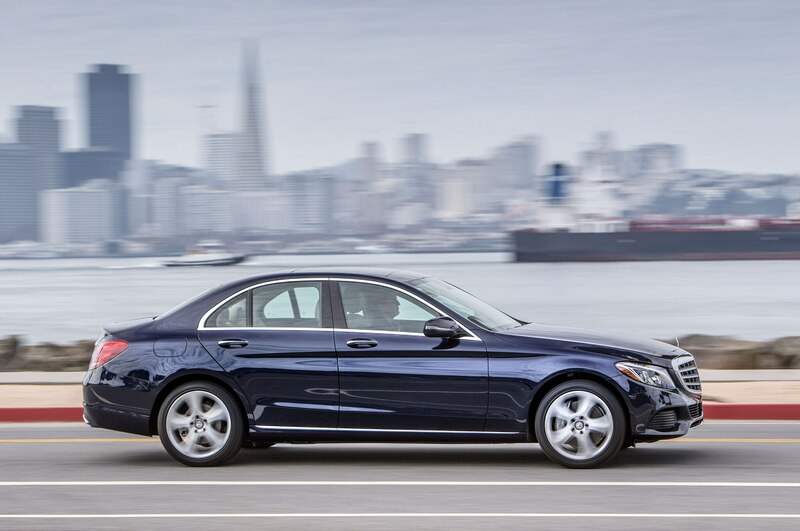 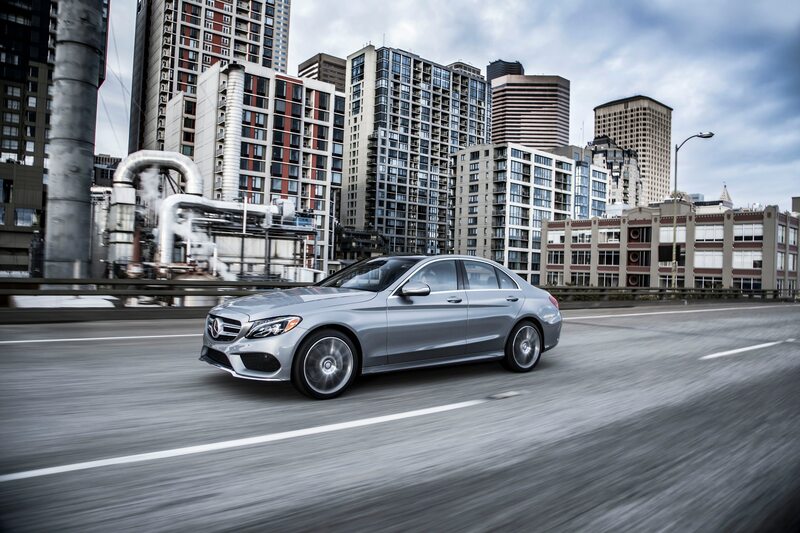 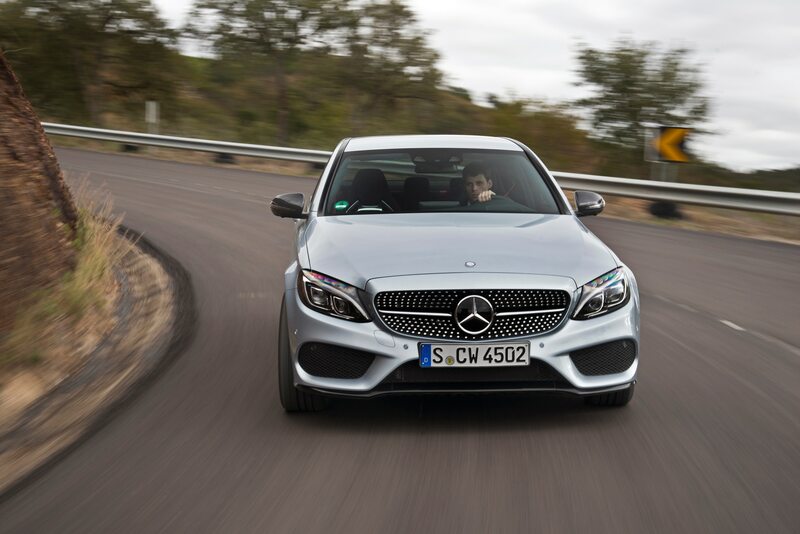 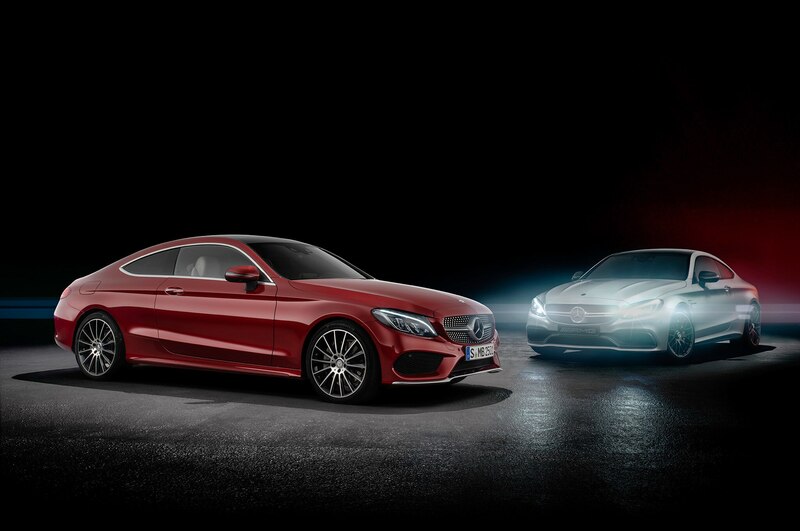 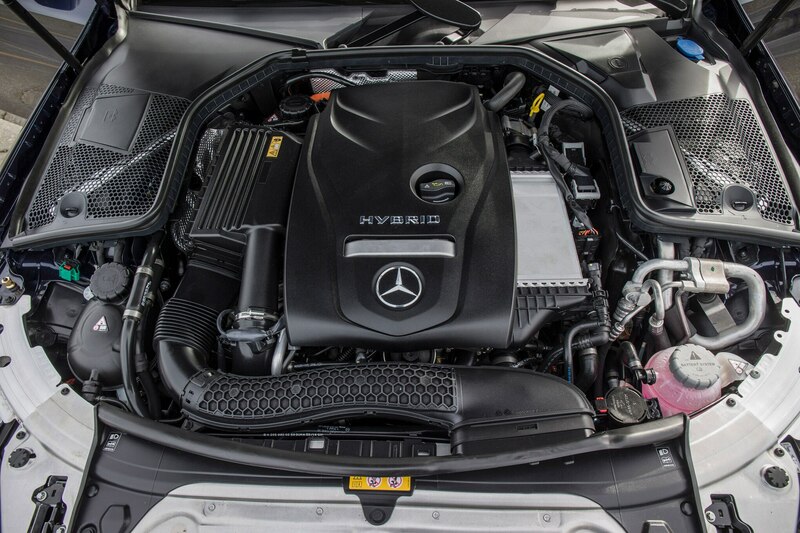 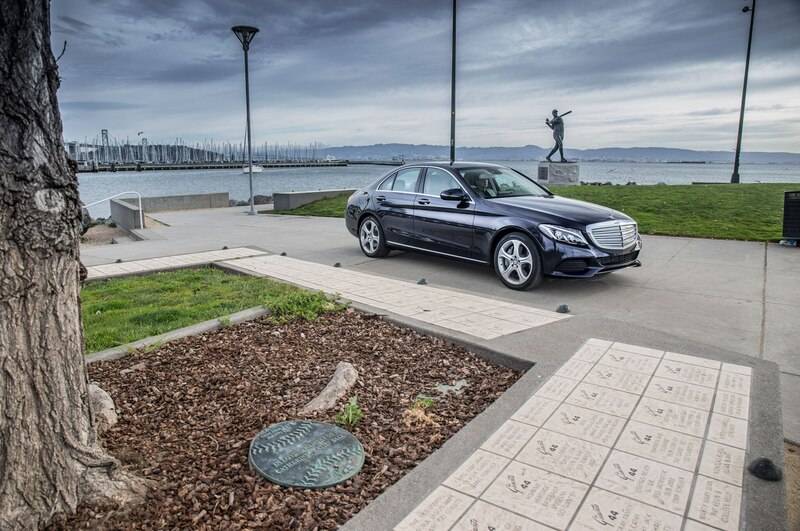 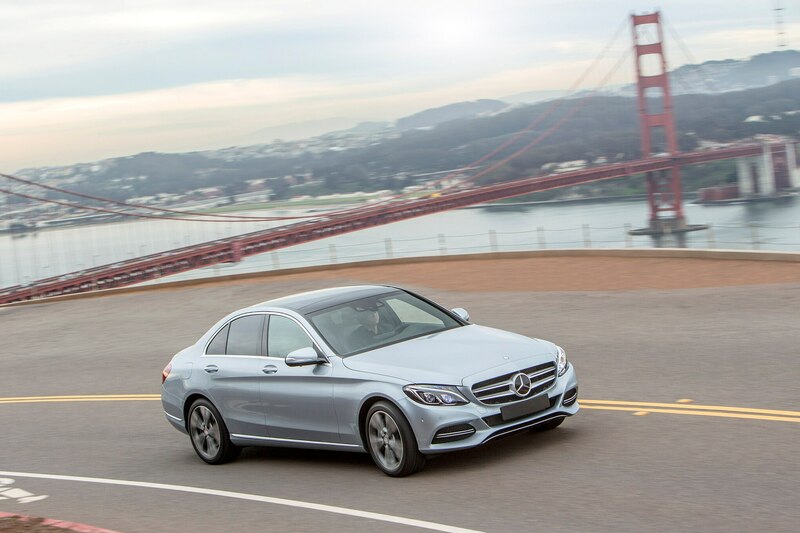 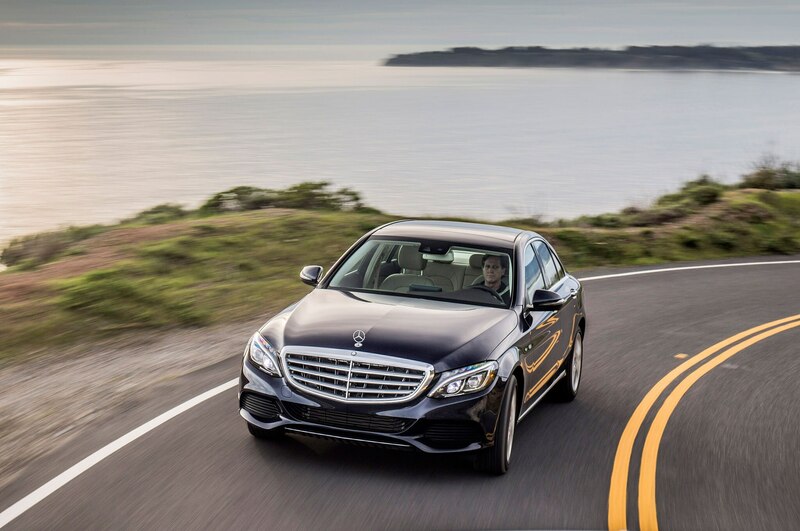 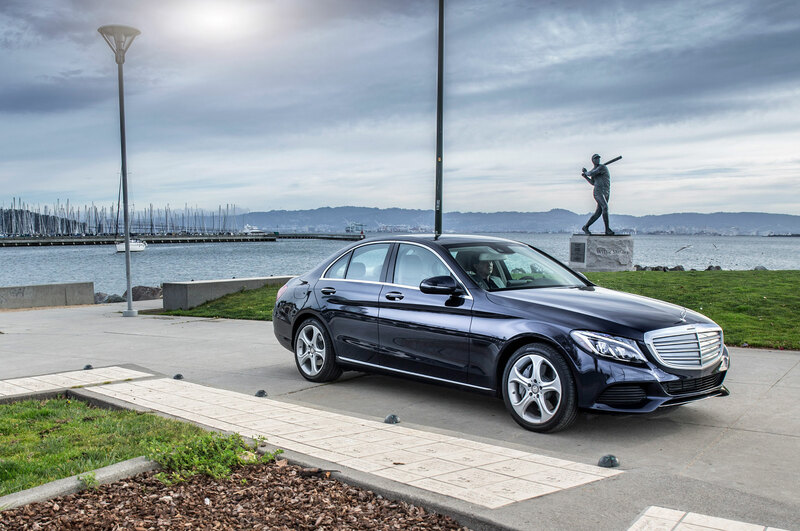 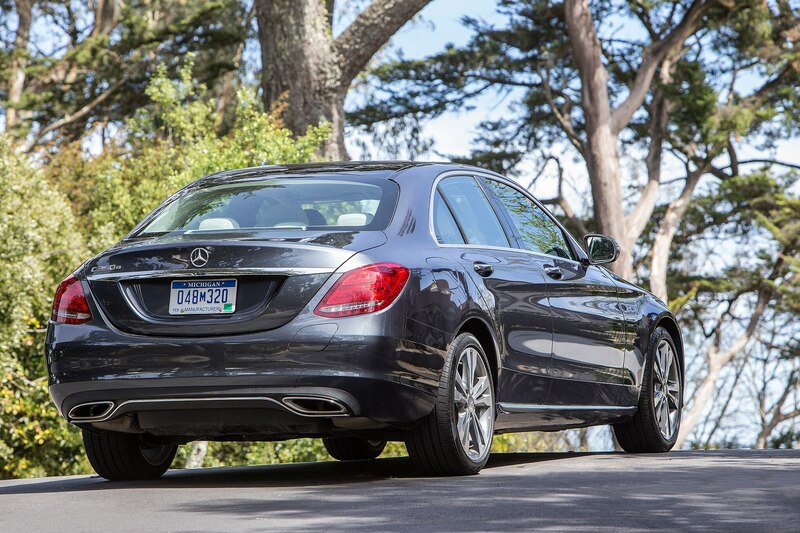 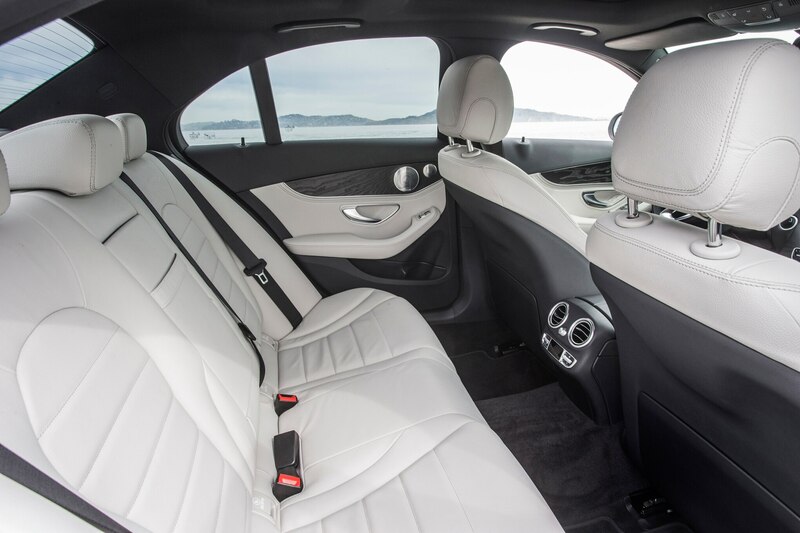 More punch for the C-Class sedan.